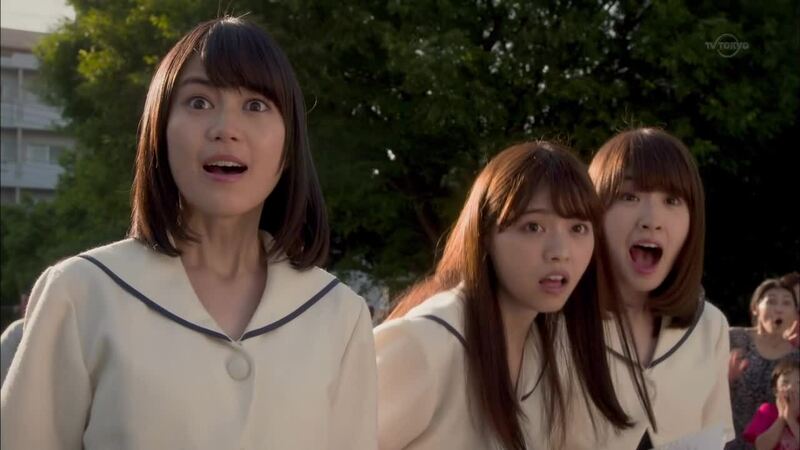 The group will be starring in their first drama which starts this Friday night, July 10th on TV Tokyo, their new single "Taiyou Knock" will be the theme song. 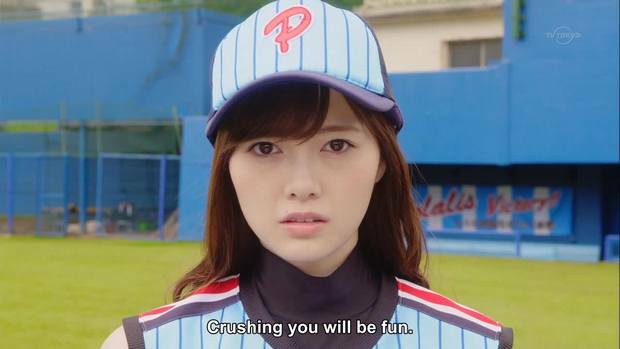 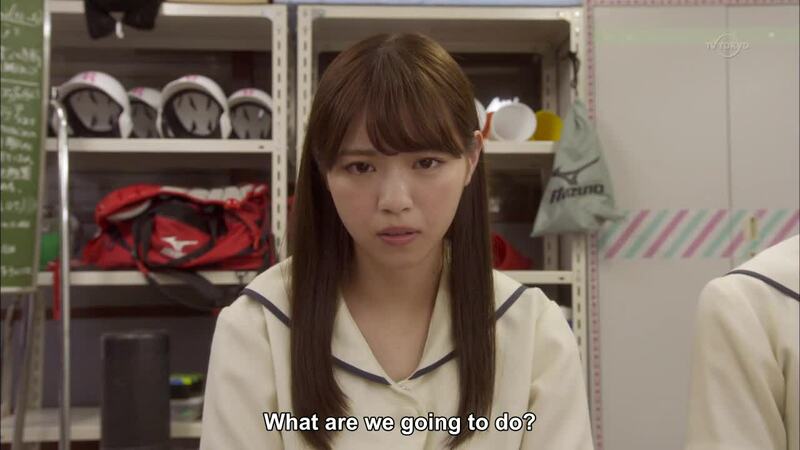 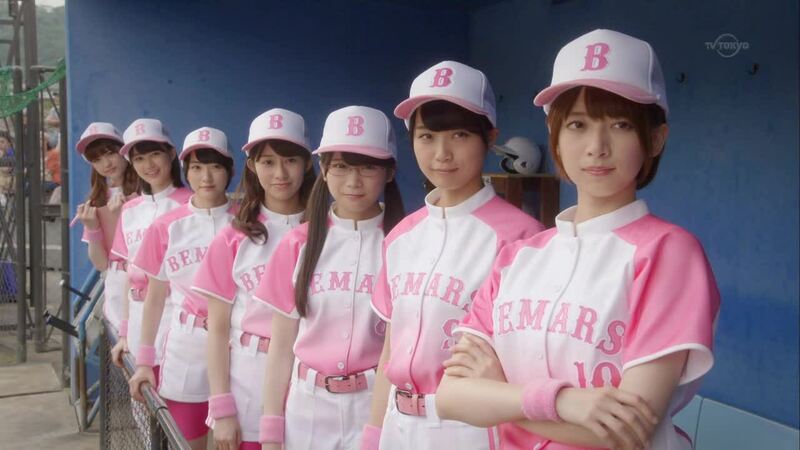 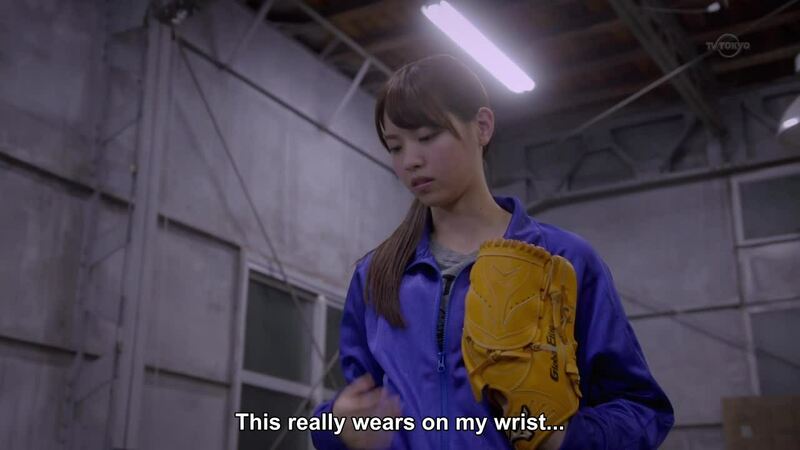 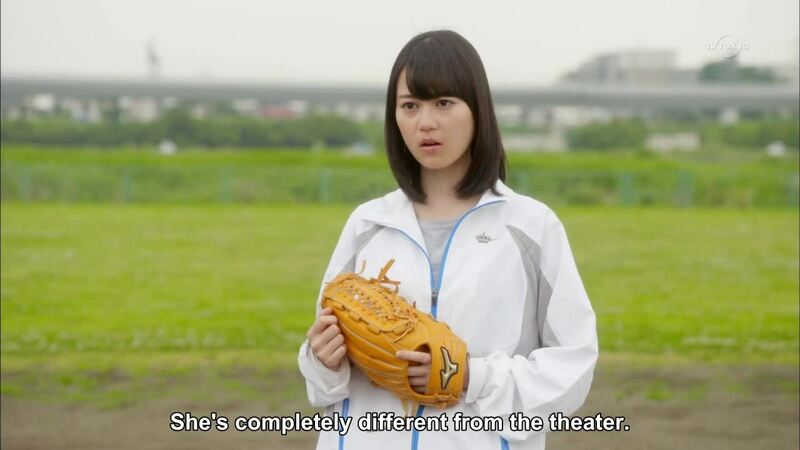 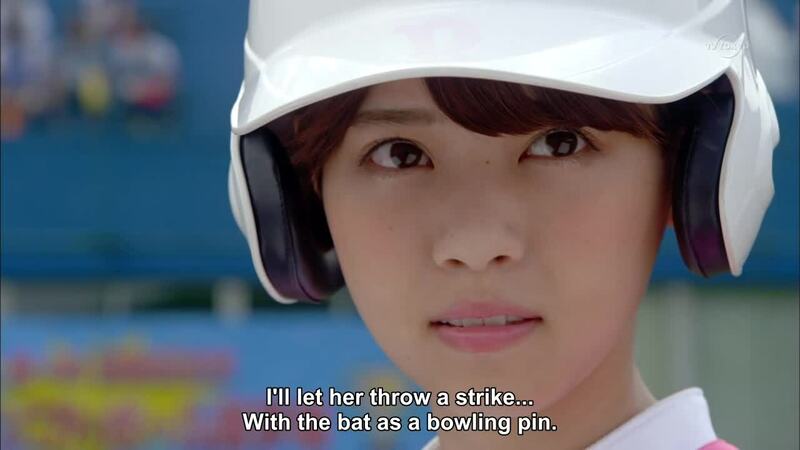 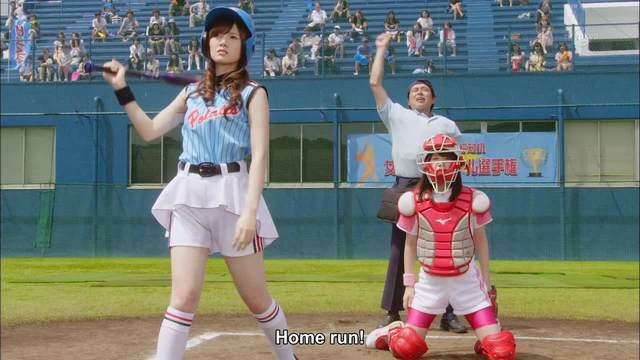 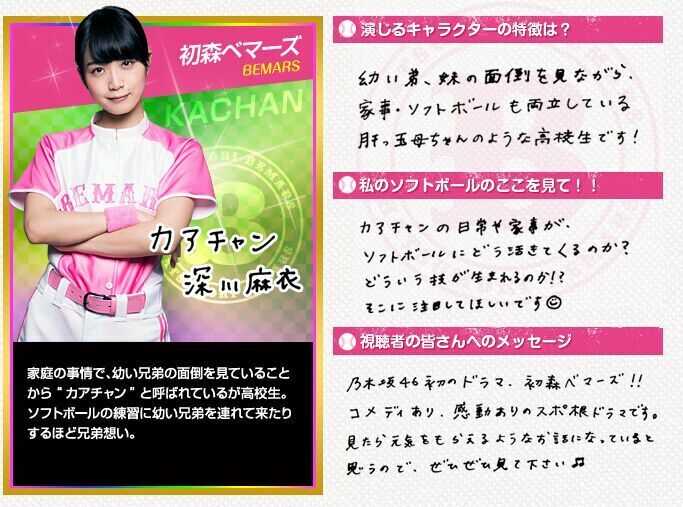 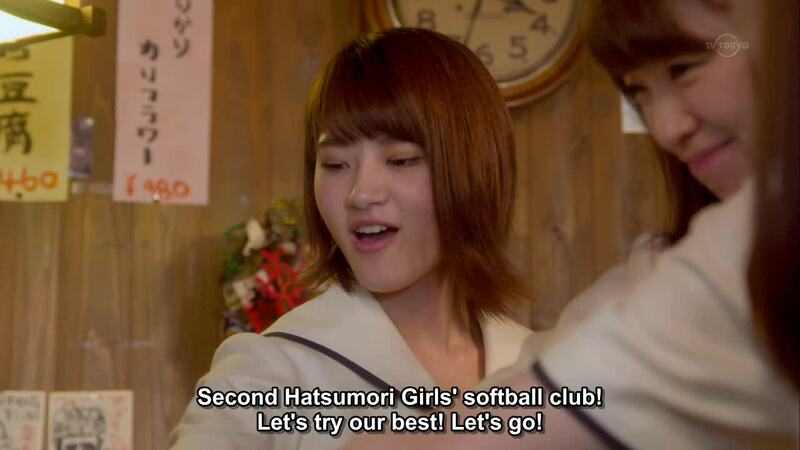 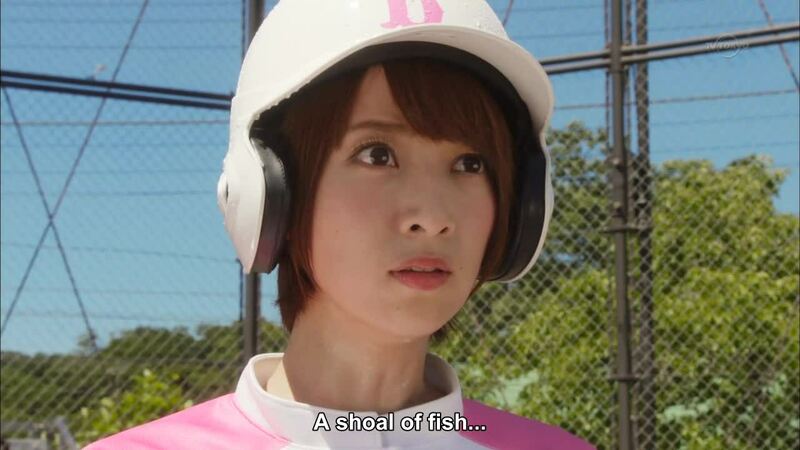 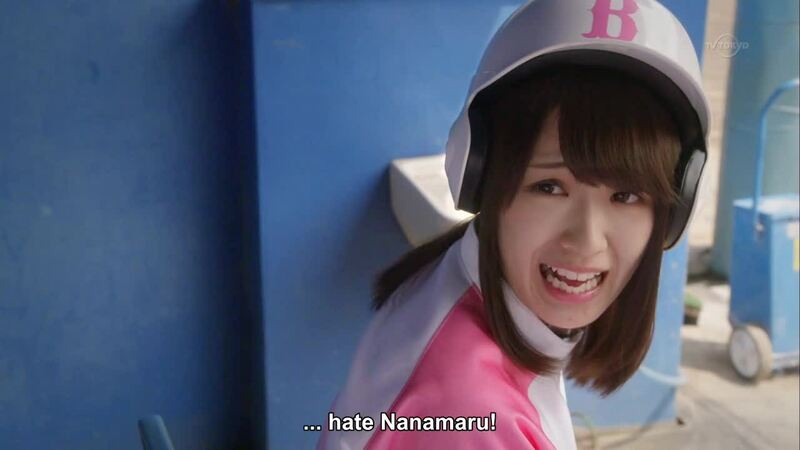 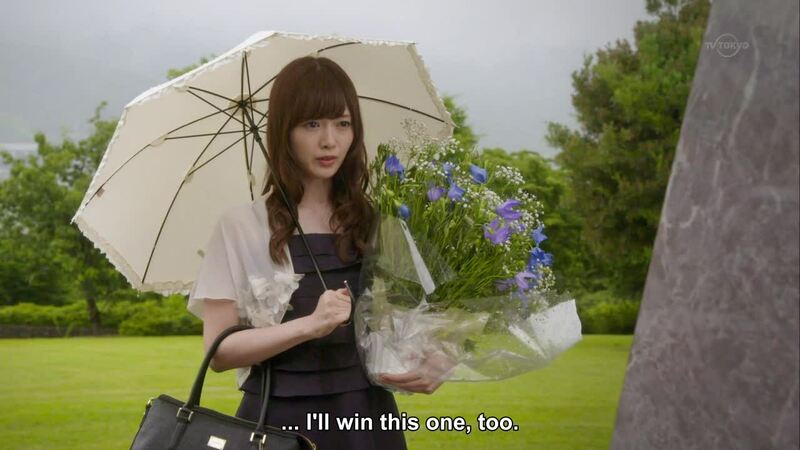 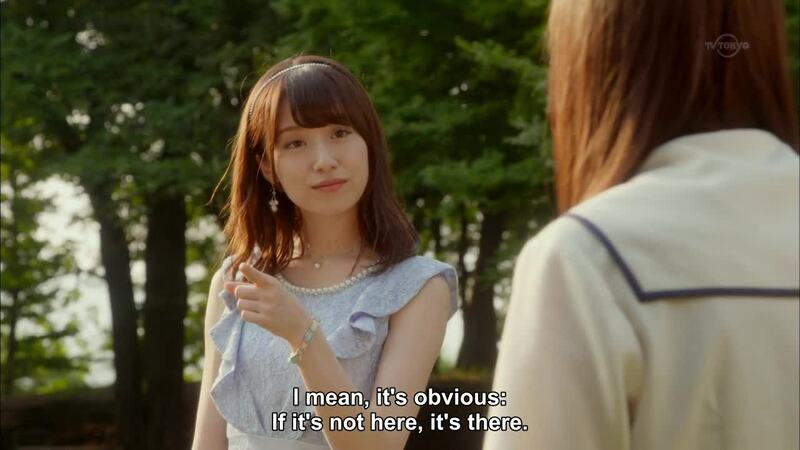 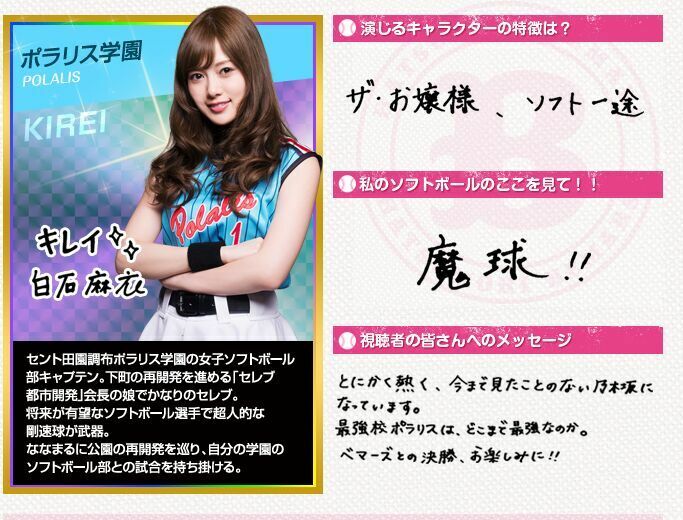 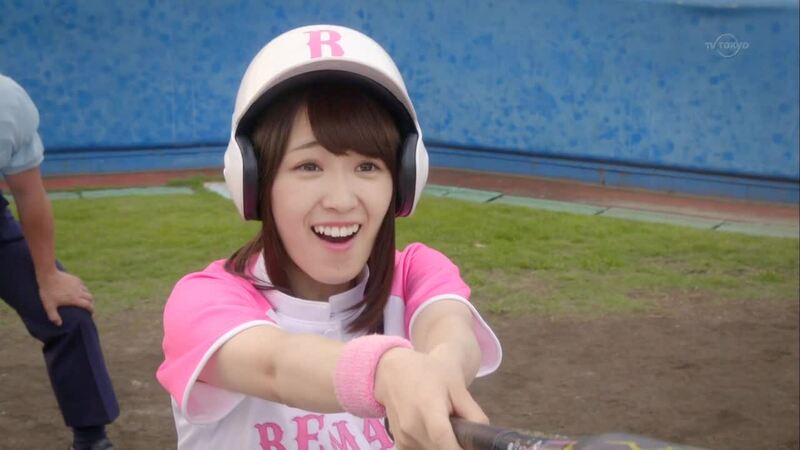 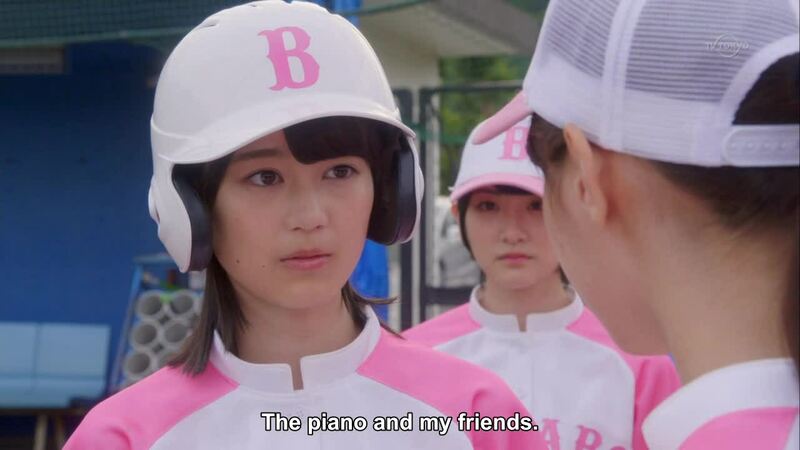 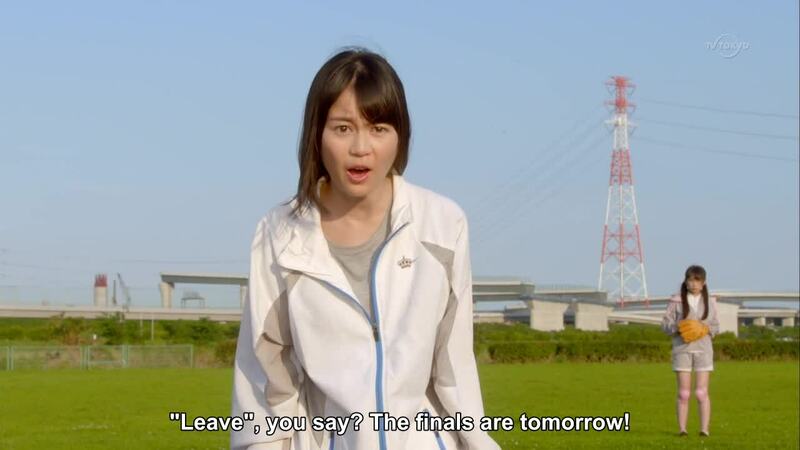 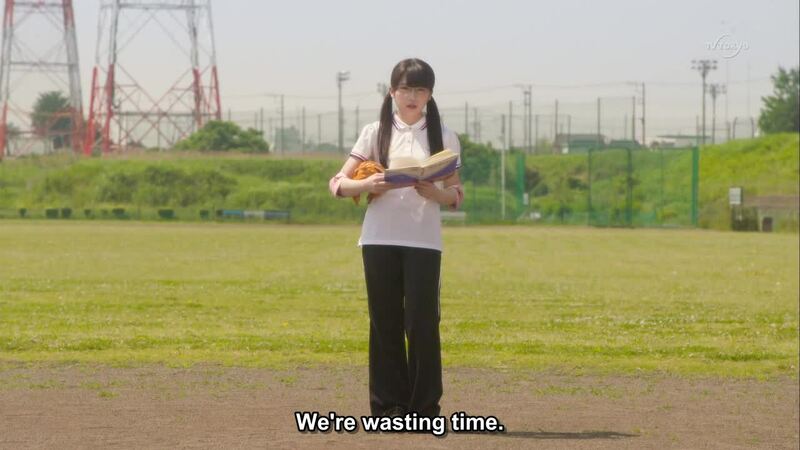 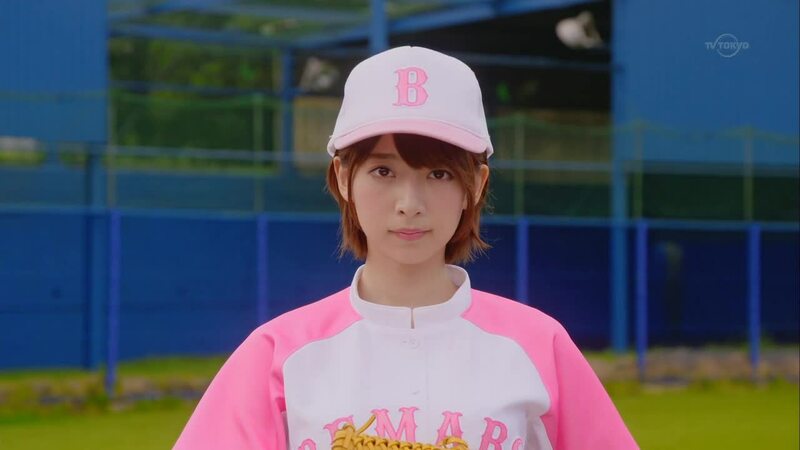 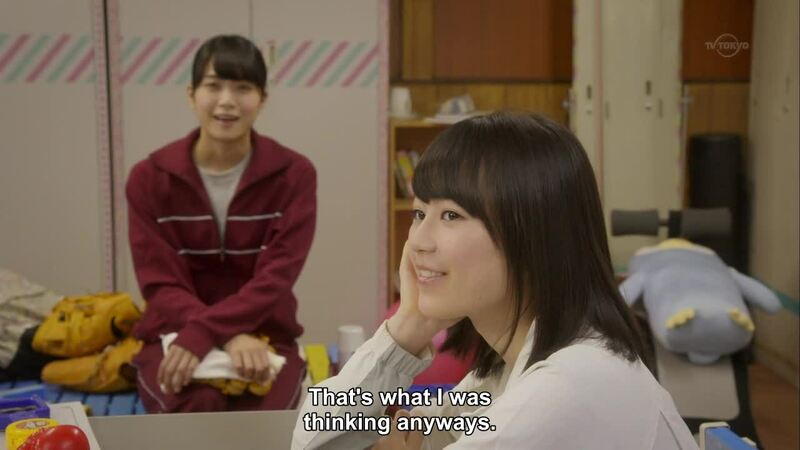 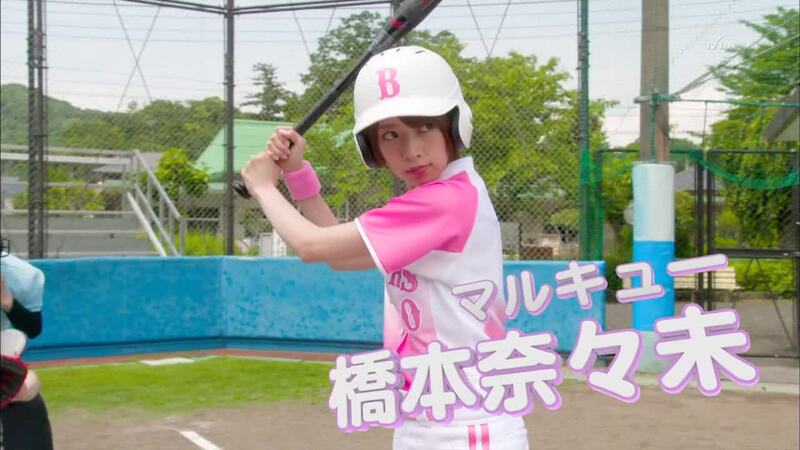 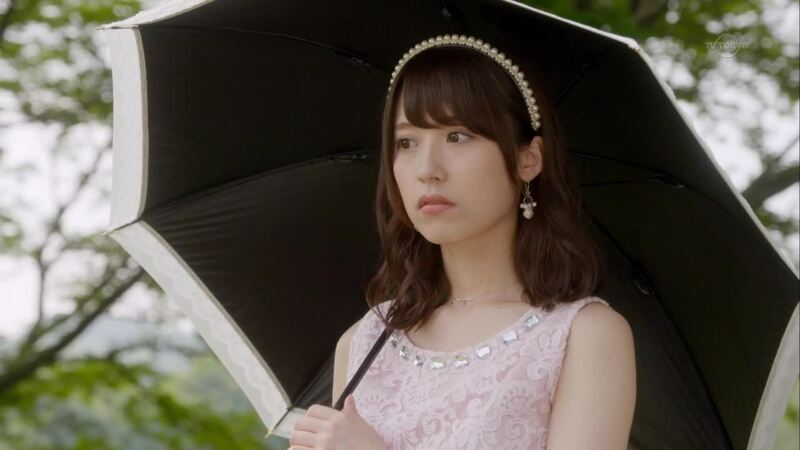 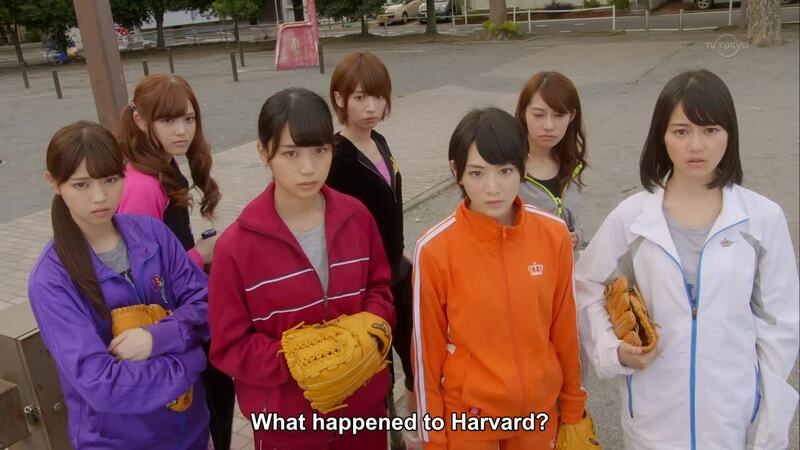 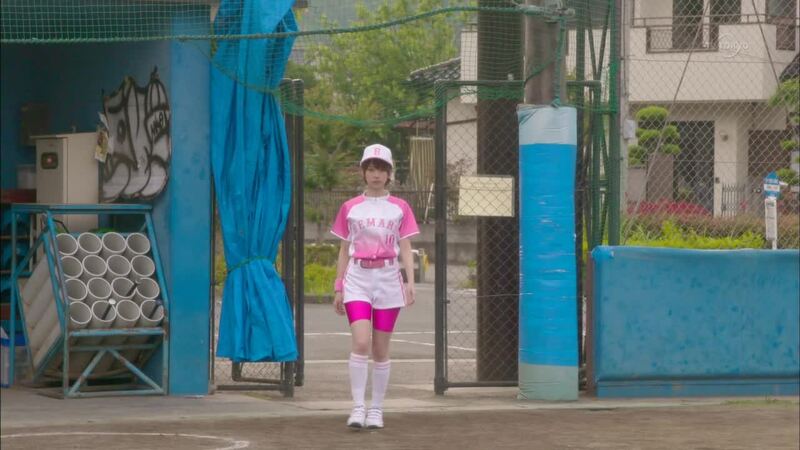 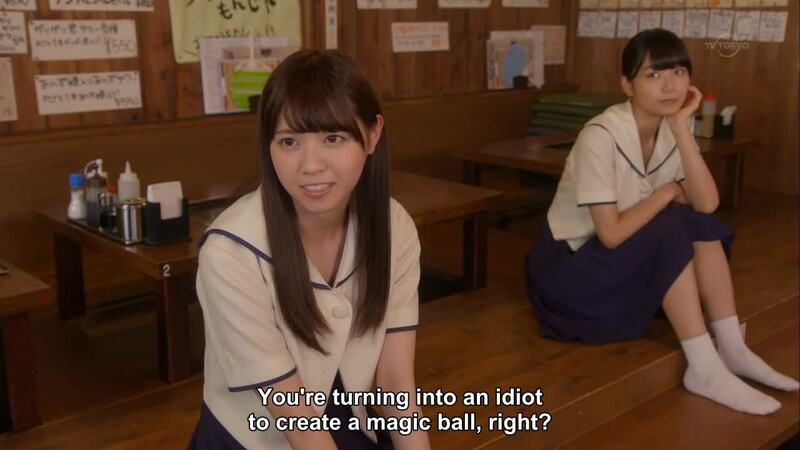 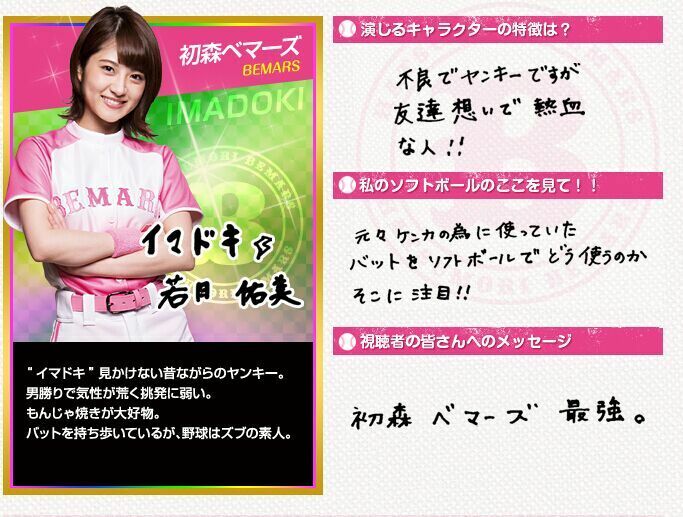 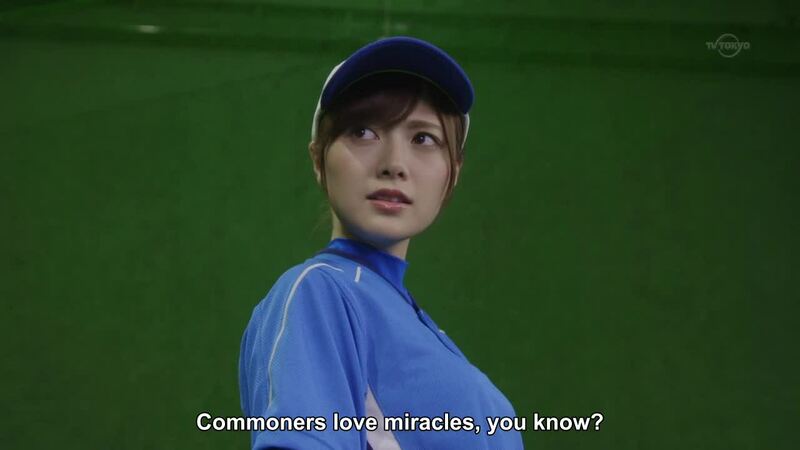 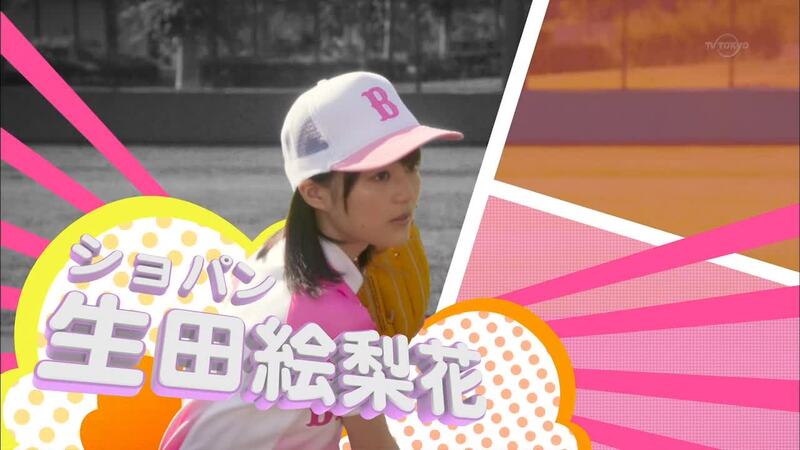 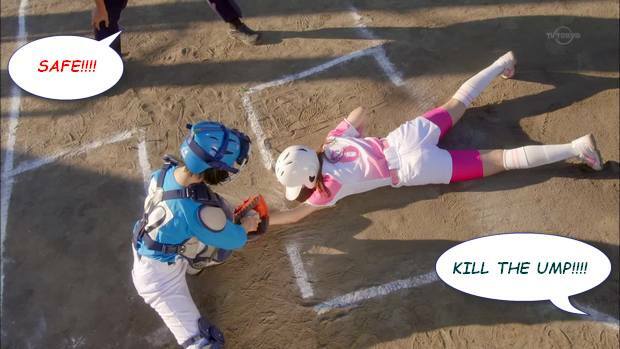 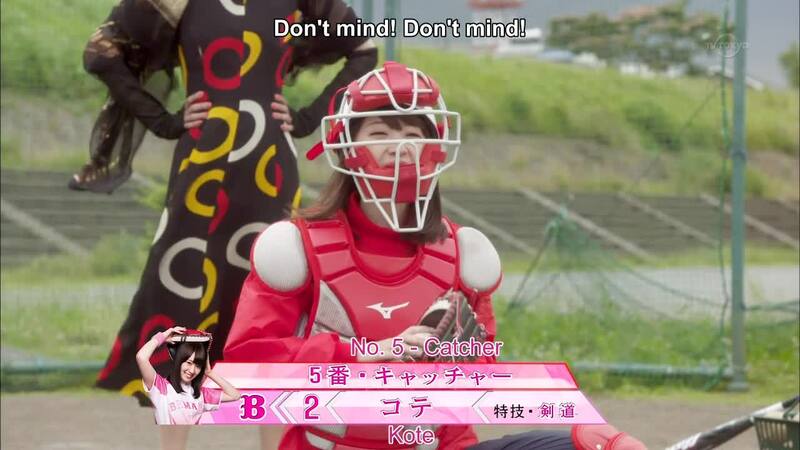 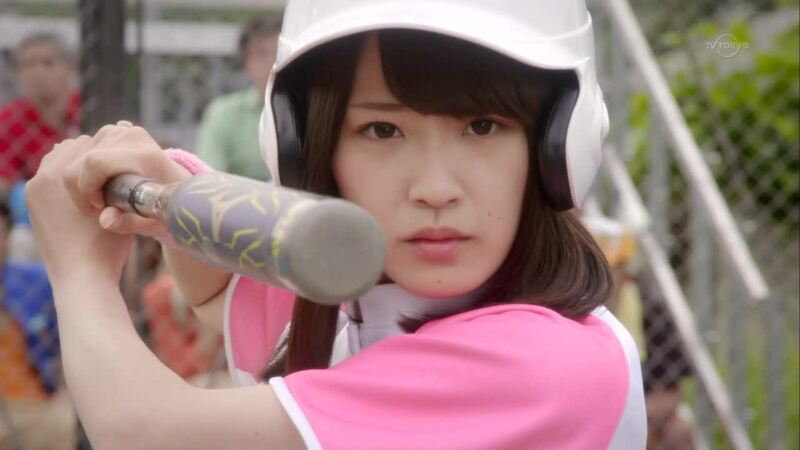 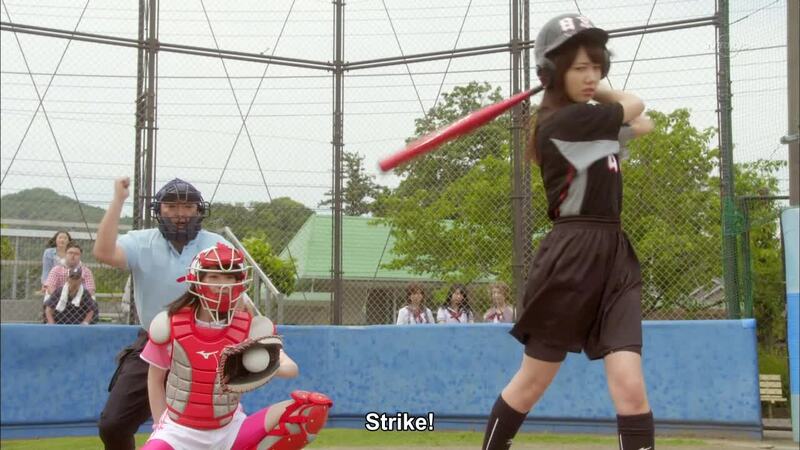 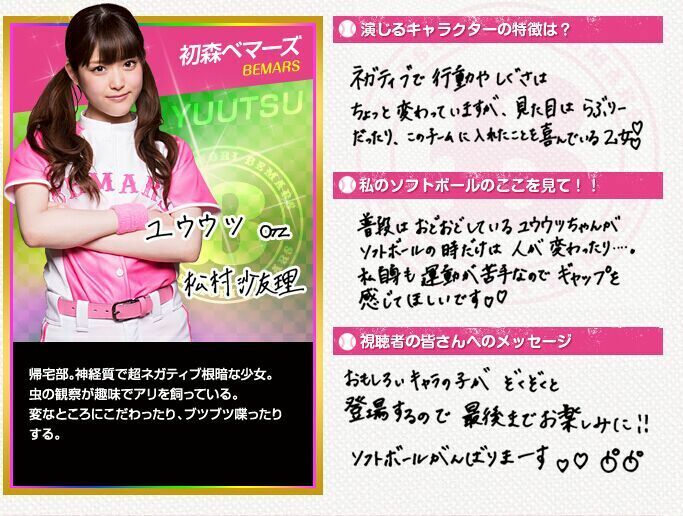 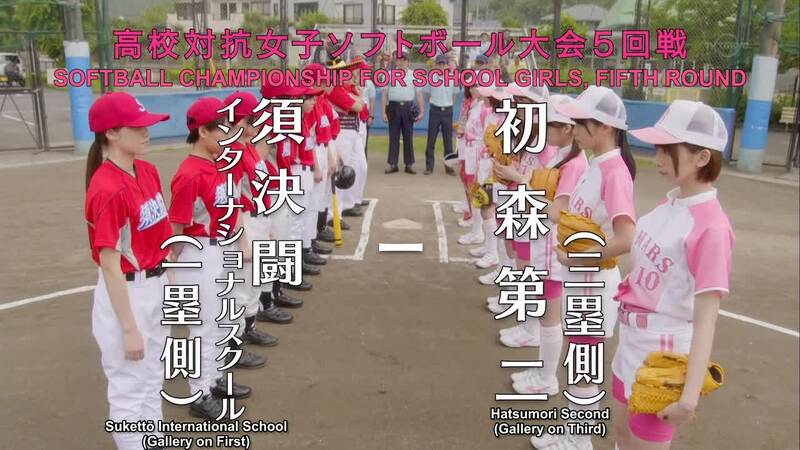 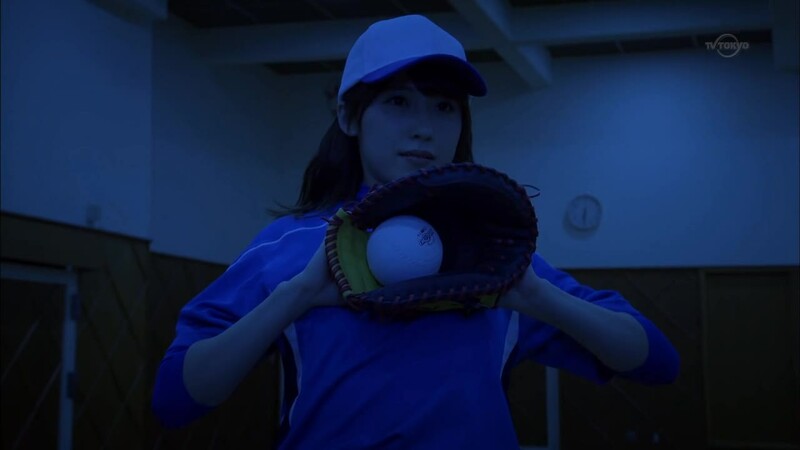 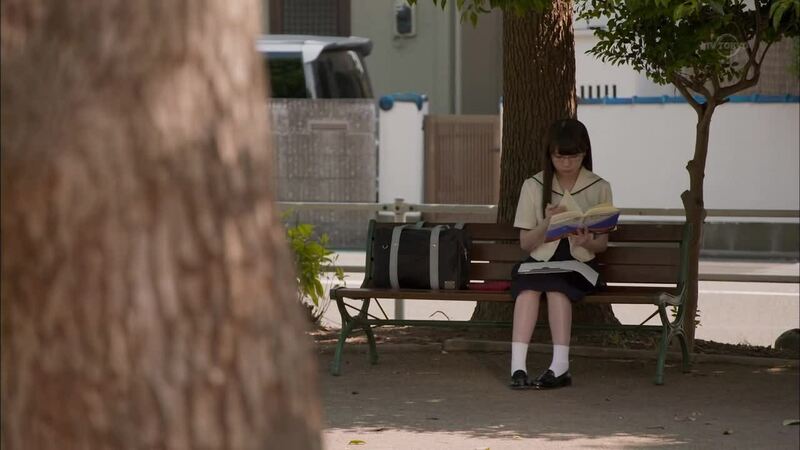 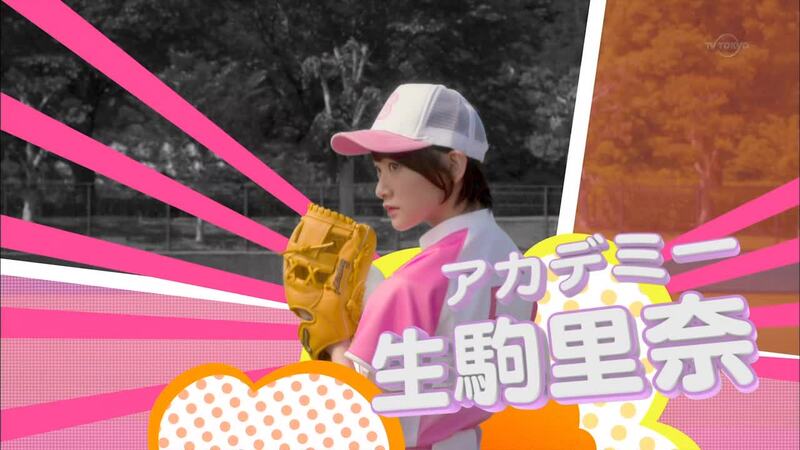 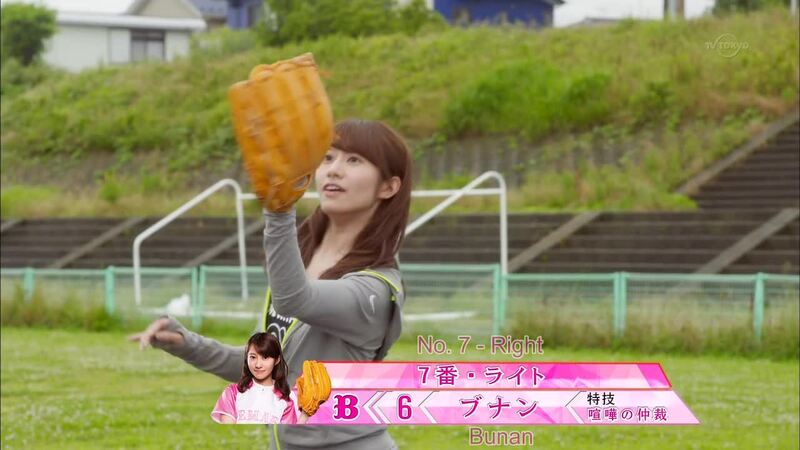 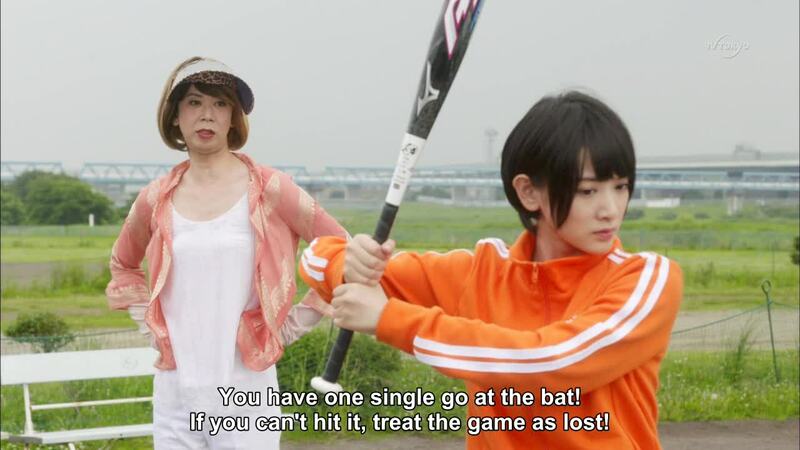 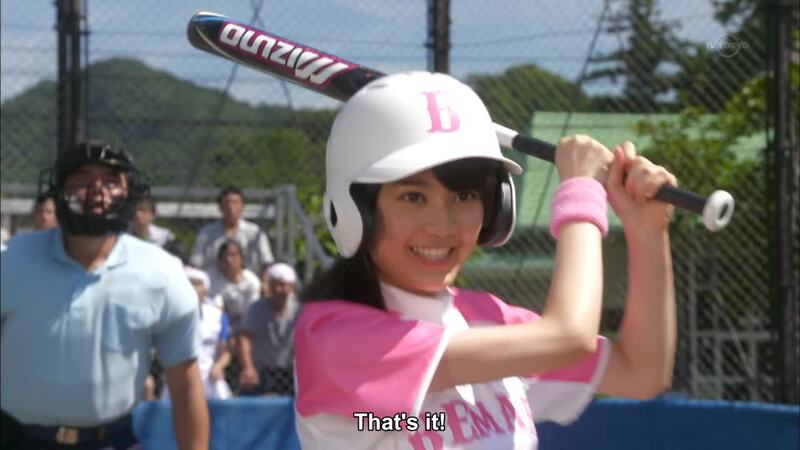 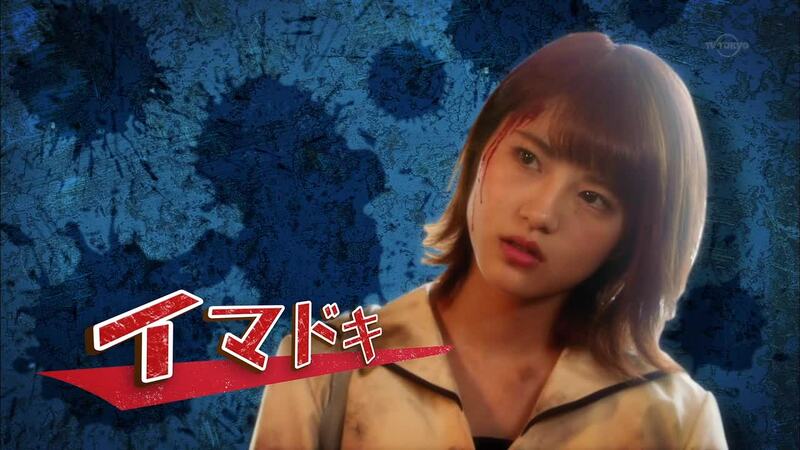 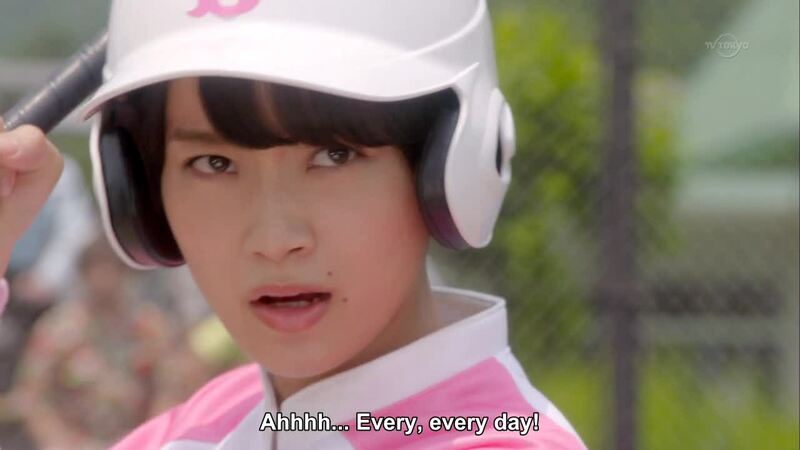 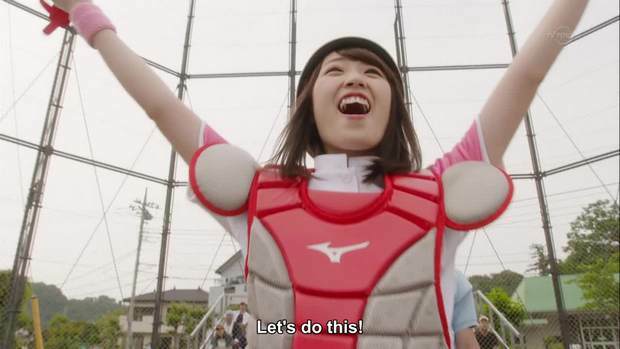 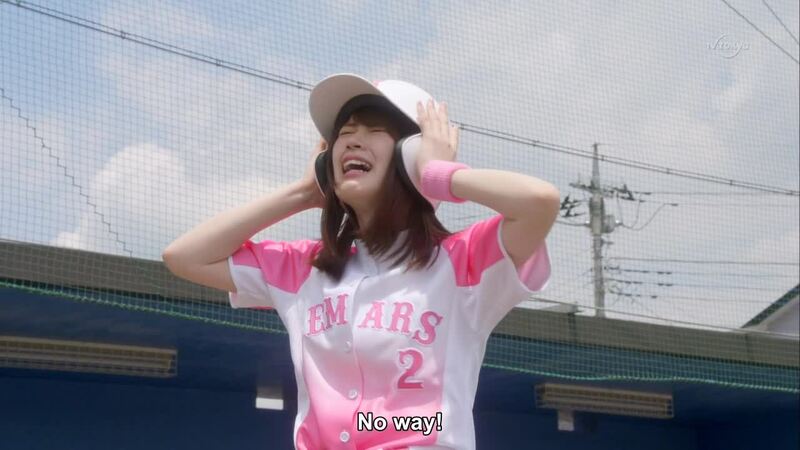 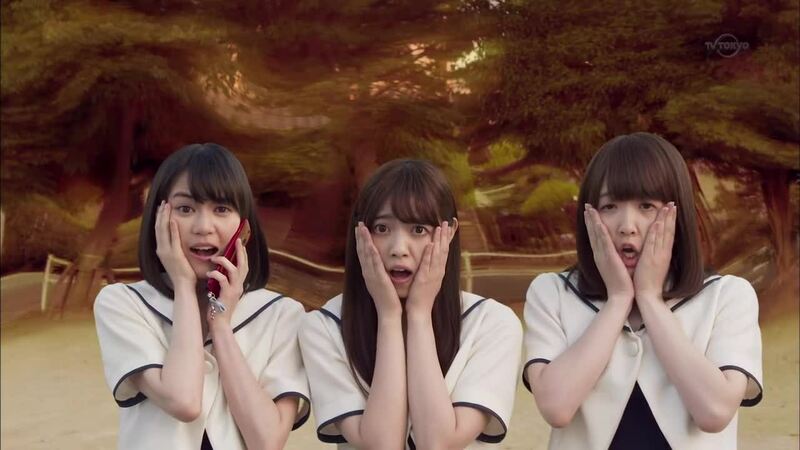 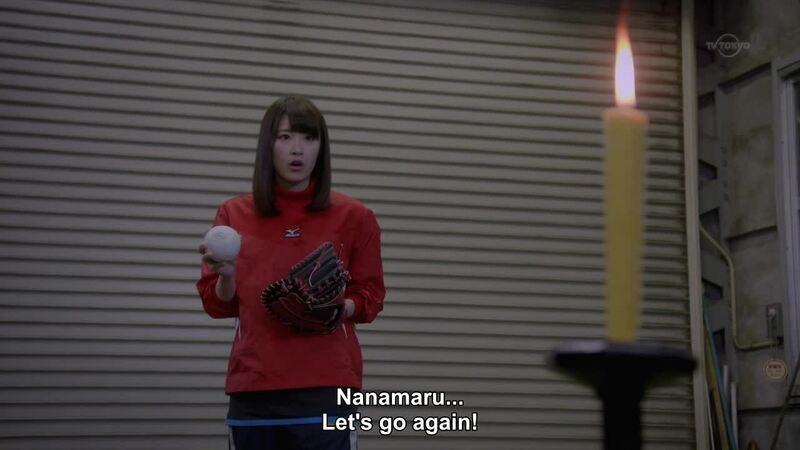 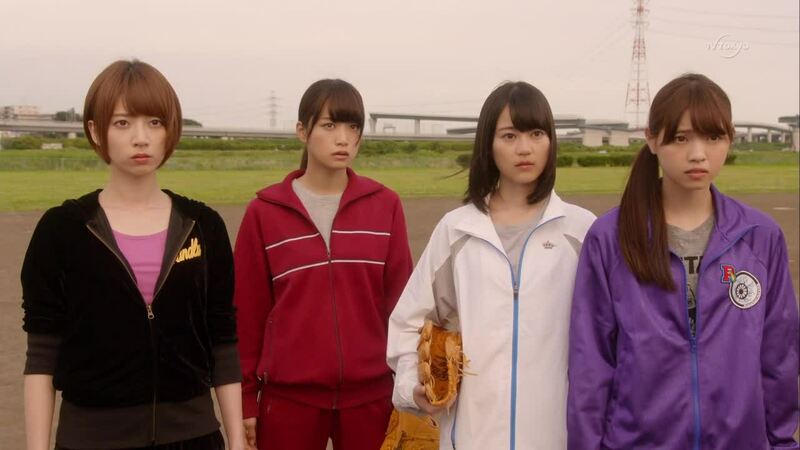 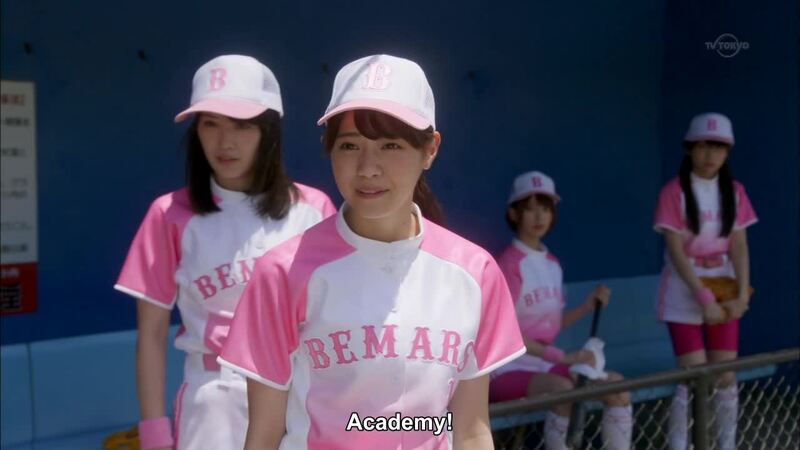 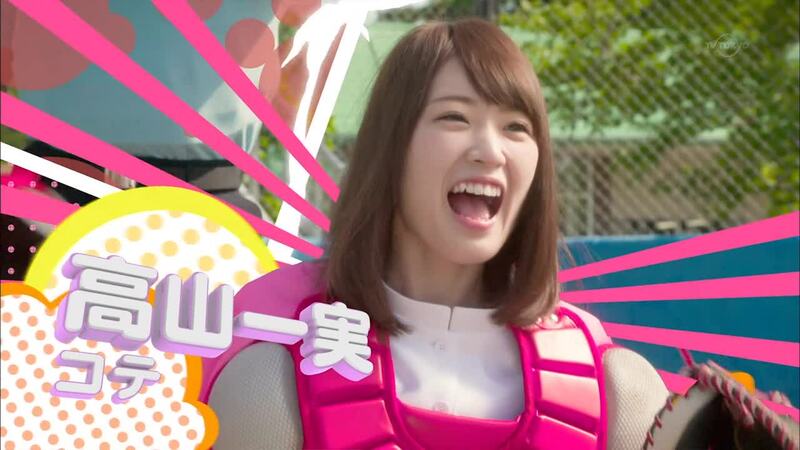 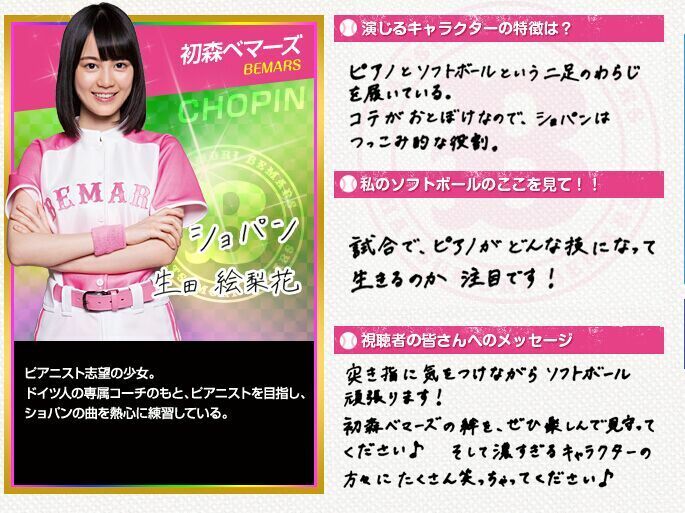 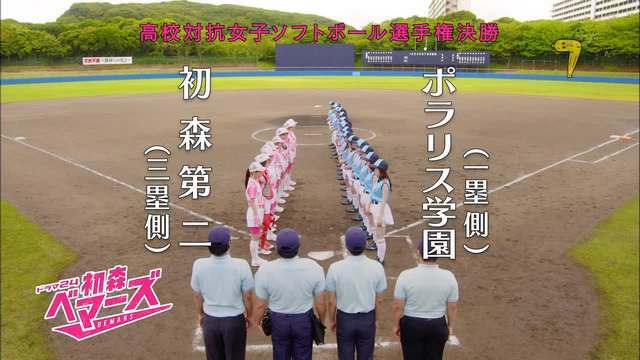 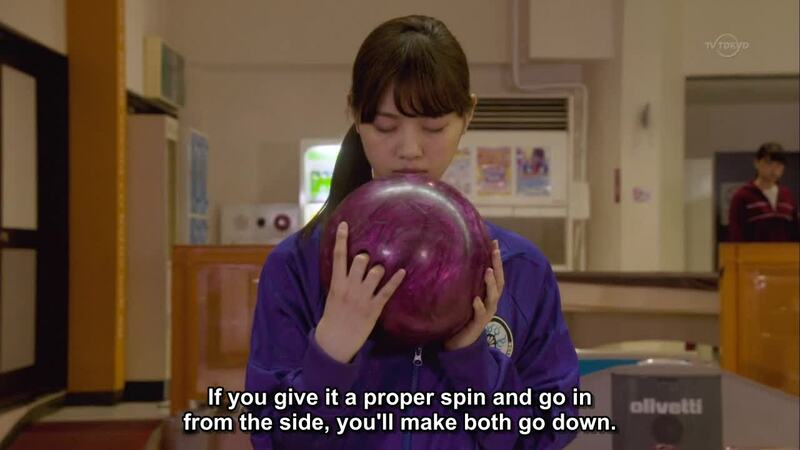 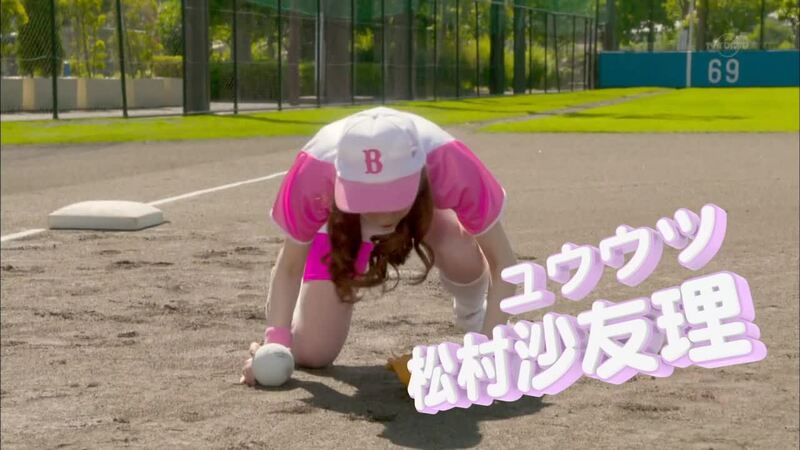 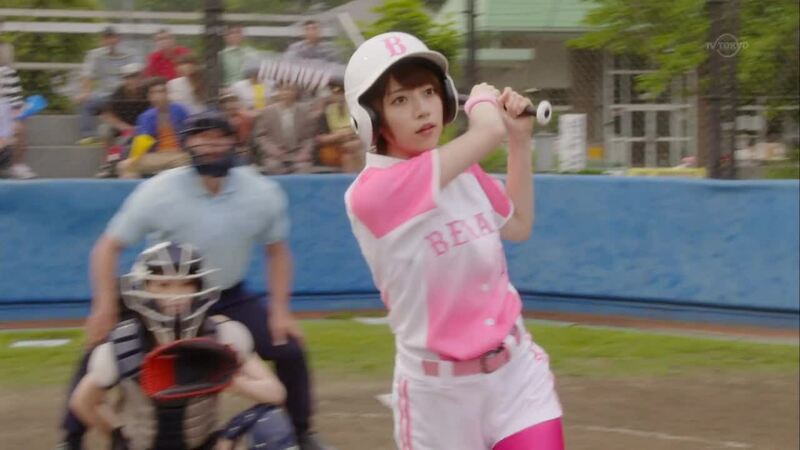 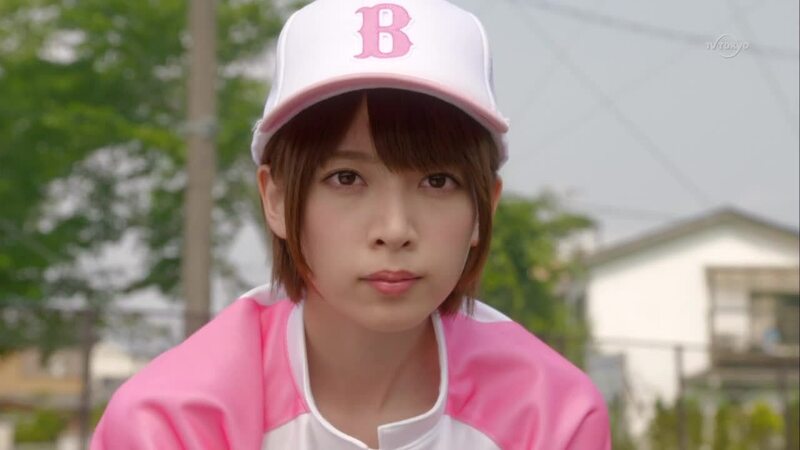 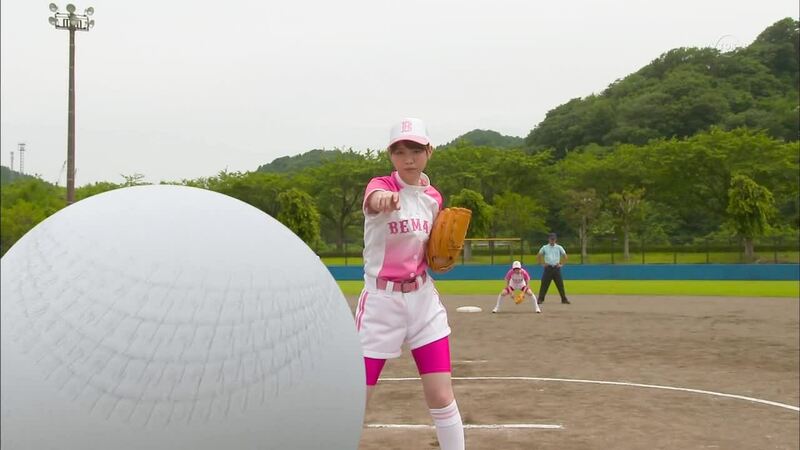 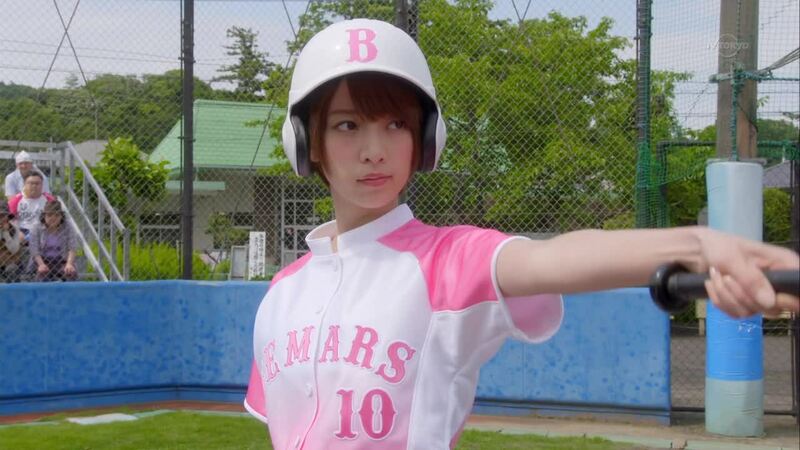 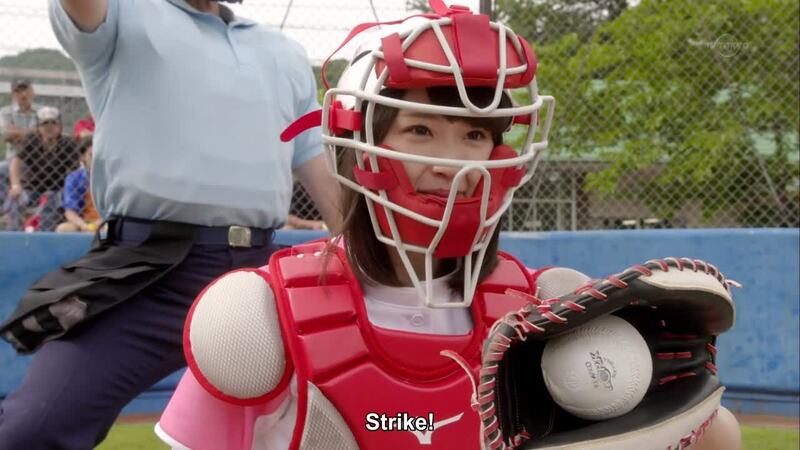 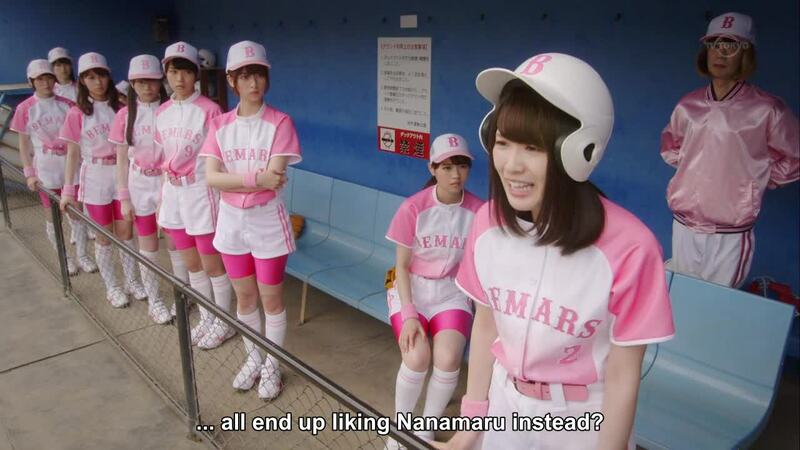 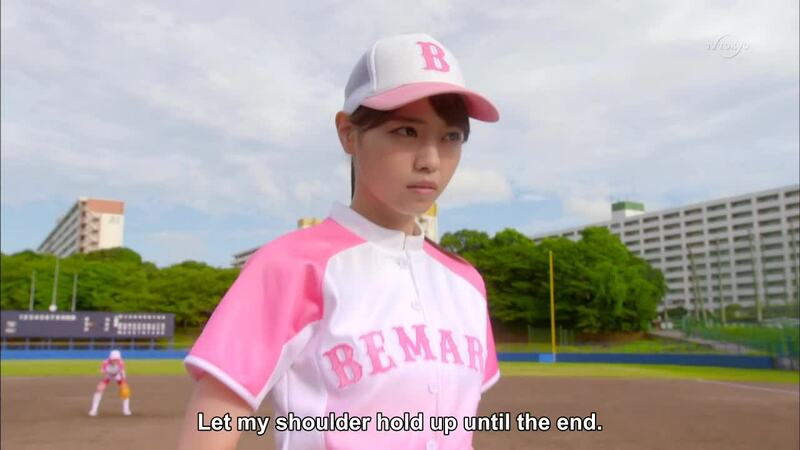 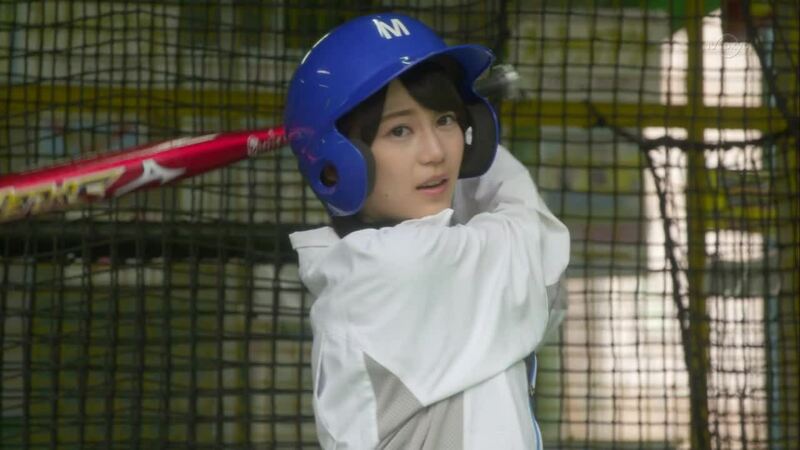 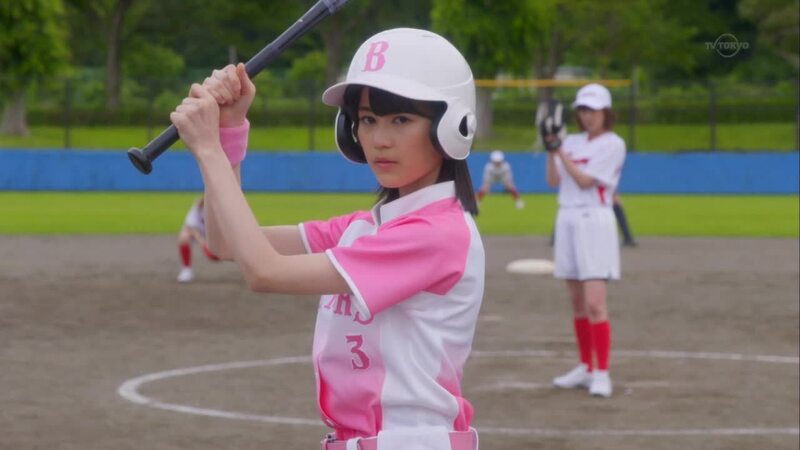 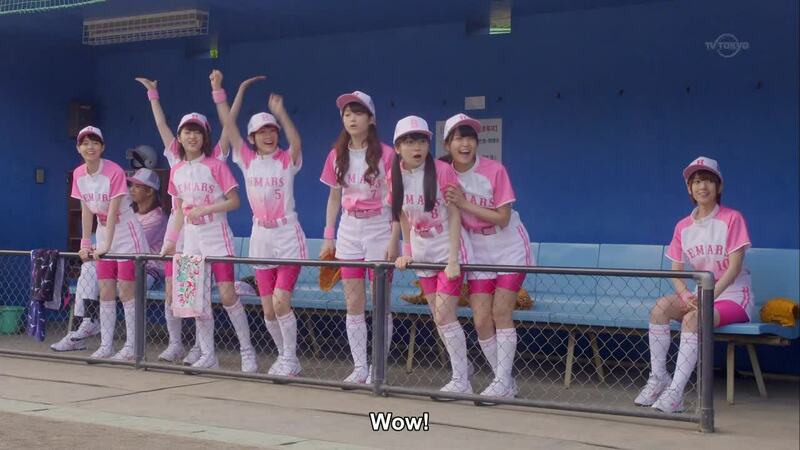 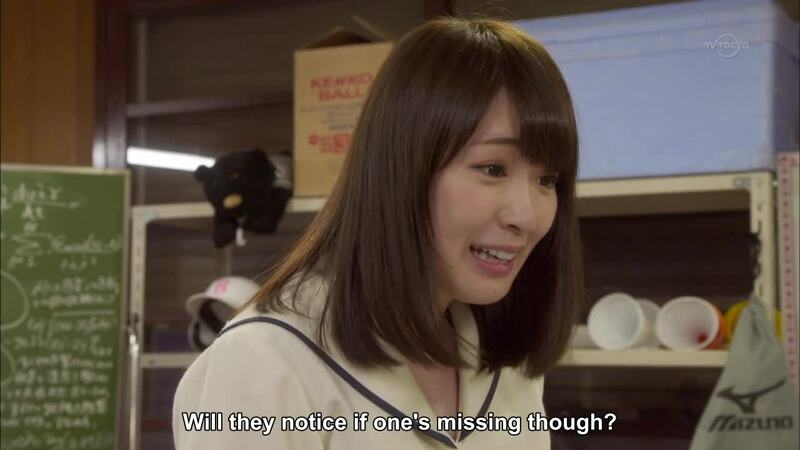 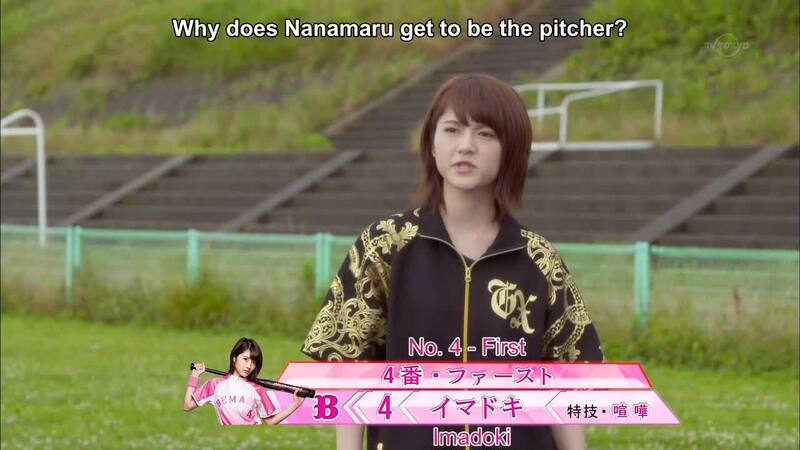 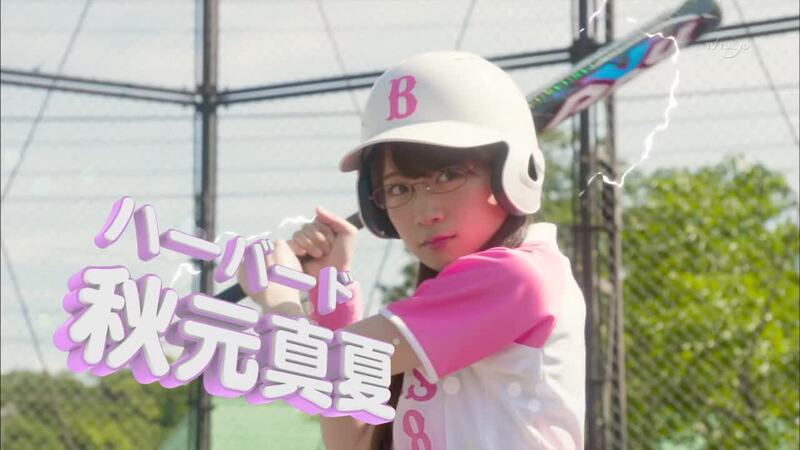 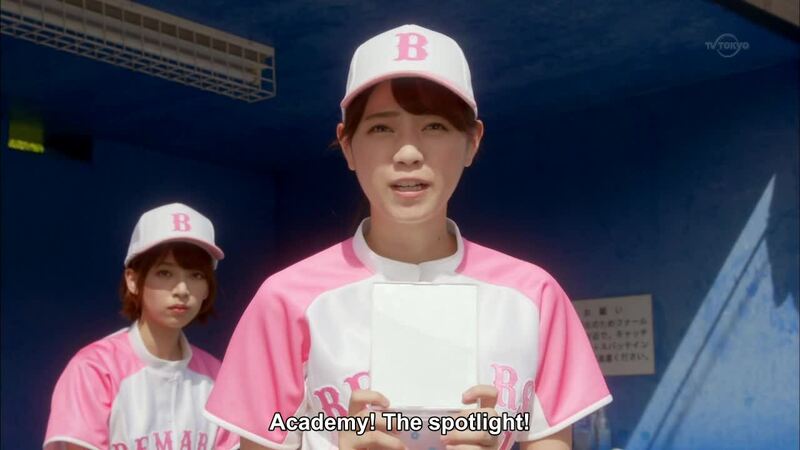 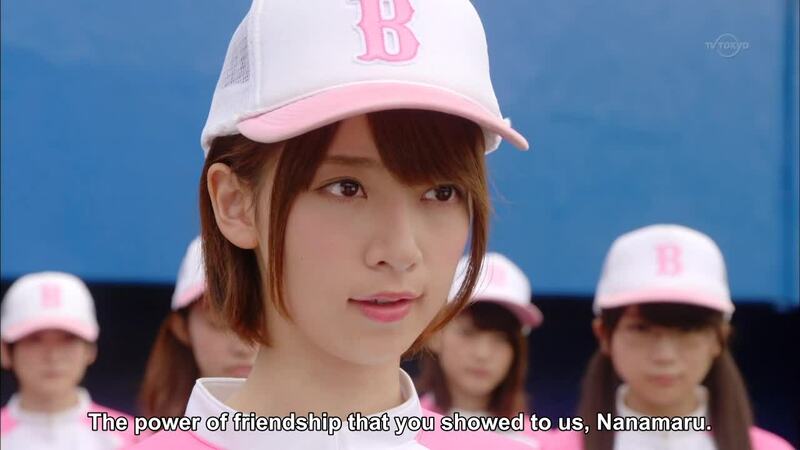 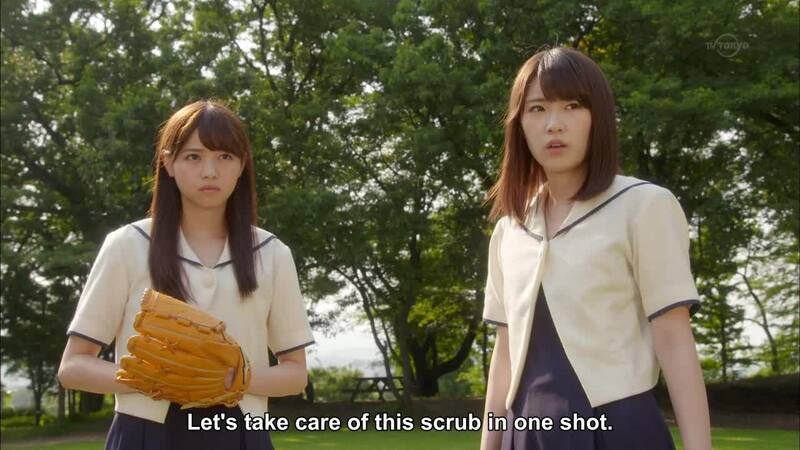 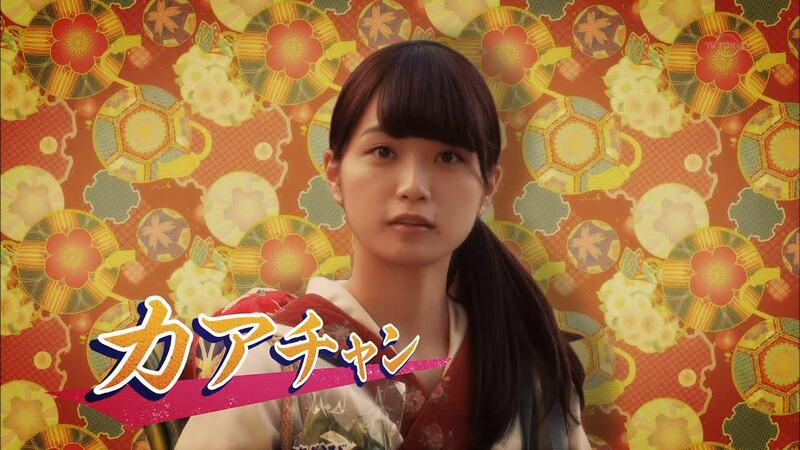 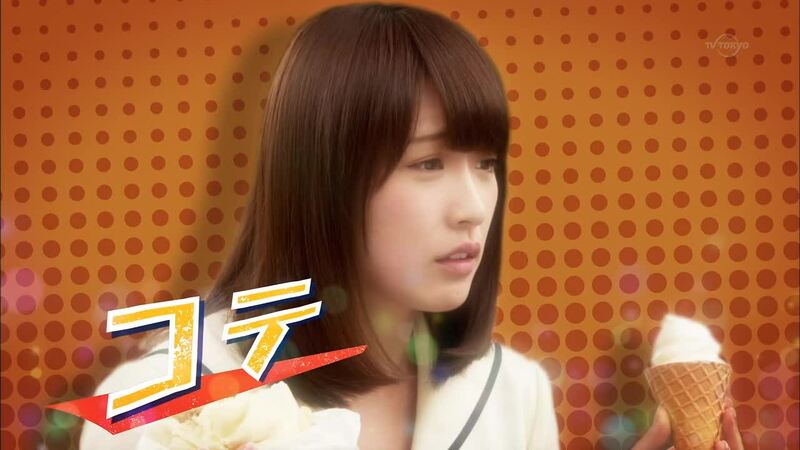 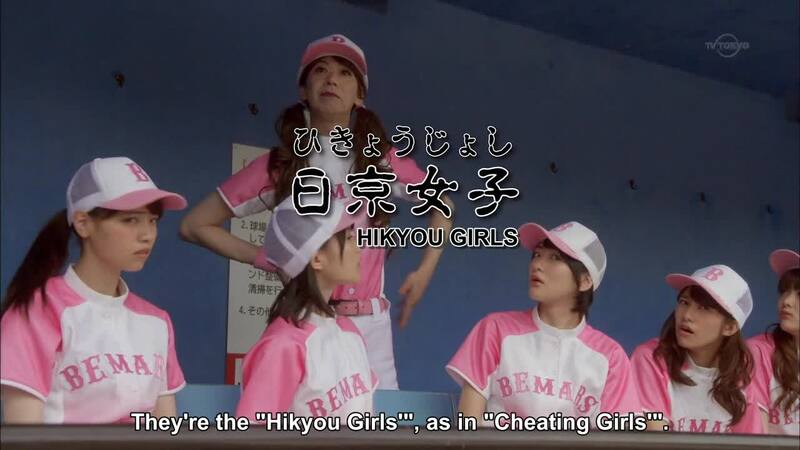 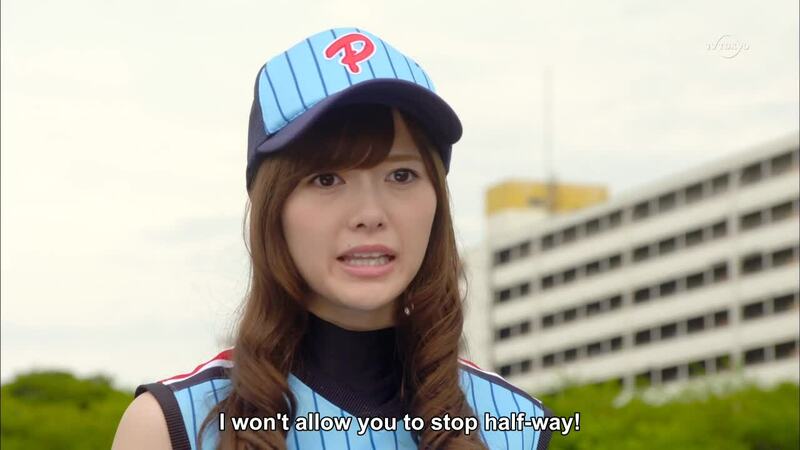 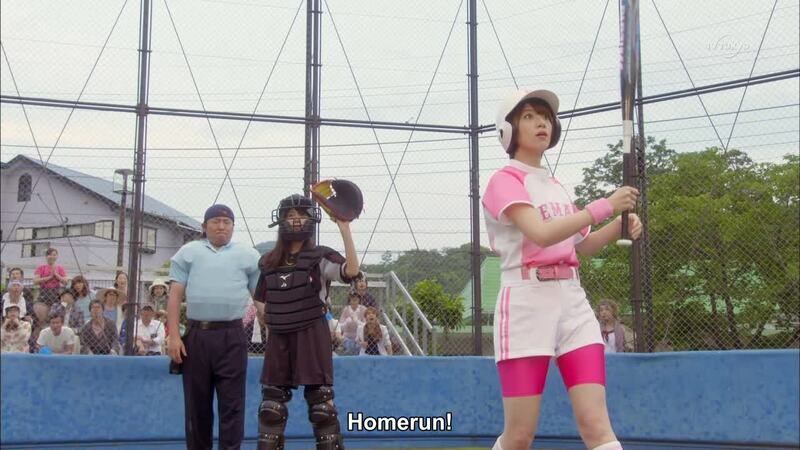 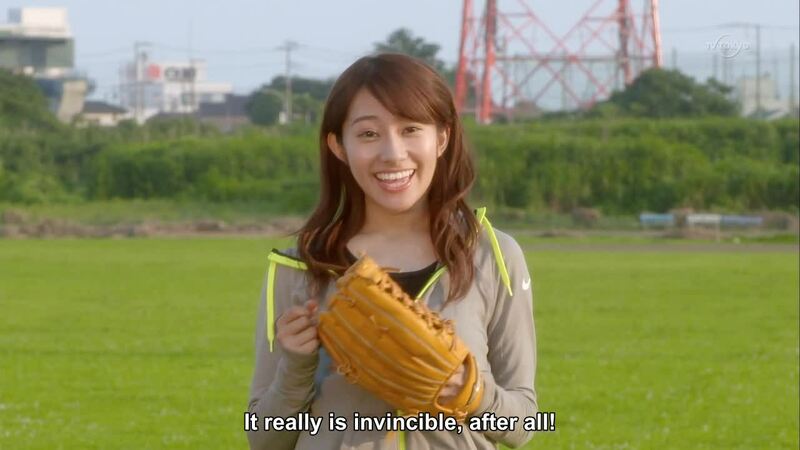 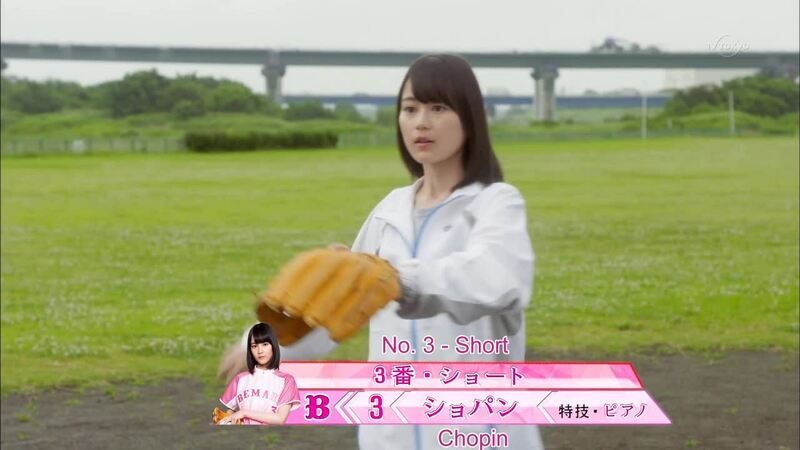 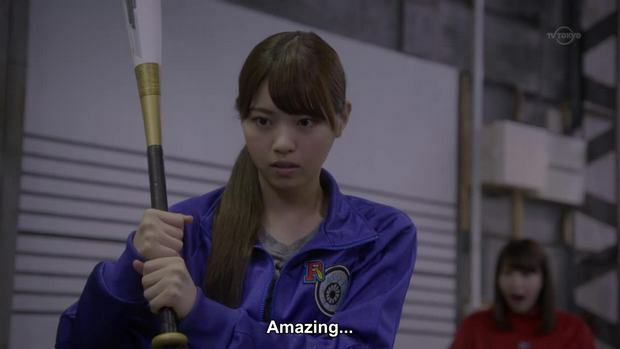 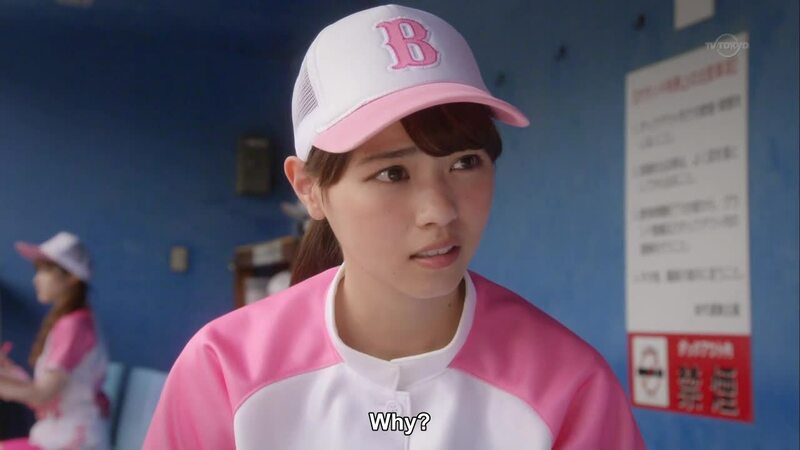 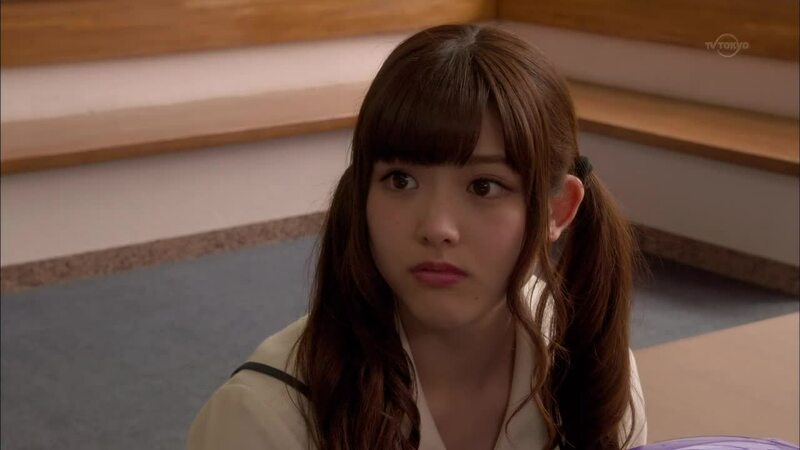 Quickie synopsis: The main character Nanase Nishino forms a softball team called the Bemars to participate in a softball game against the Polaris (lead by veterans Mai Shiraishi & Misa Eto) to prevent her favorite park from being taken away. 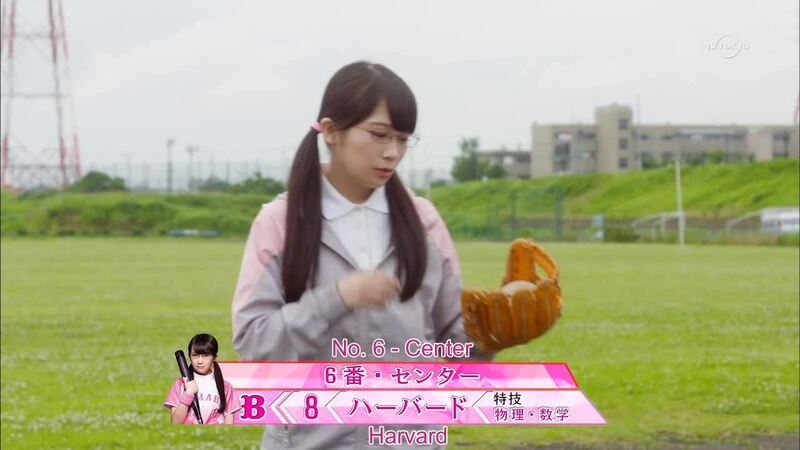 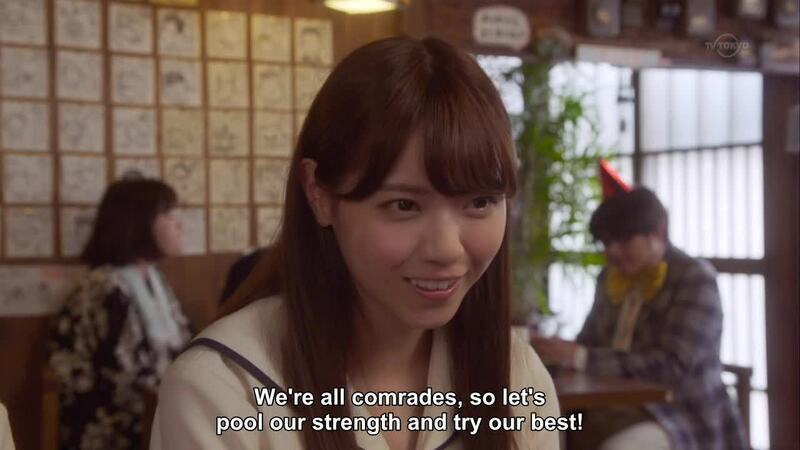 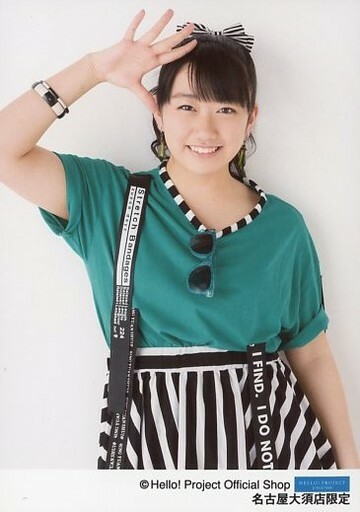 Nishino's team is a full of inexperienced players from different backgrounds. 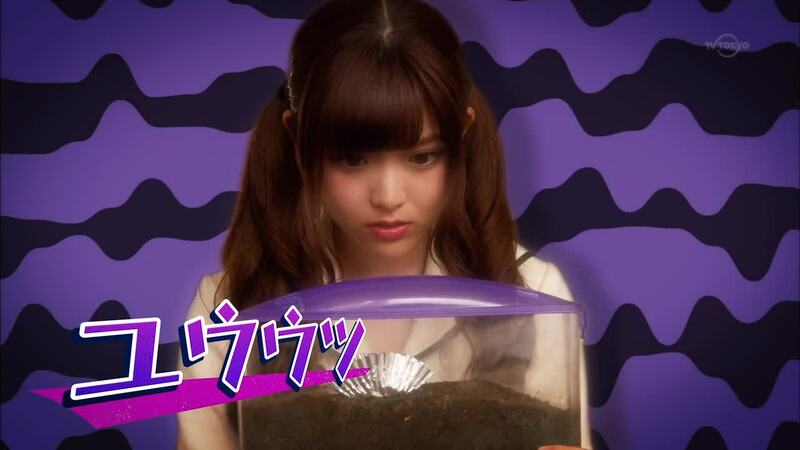 Short trailer for the show. 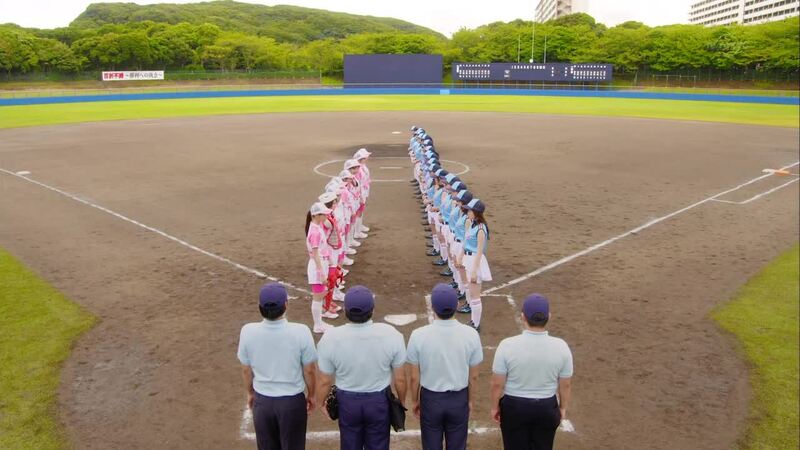 More pics of the characters from episode one, first five rows are the 'players' from the Good team. 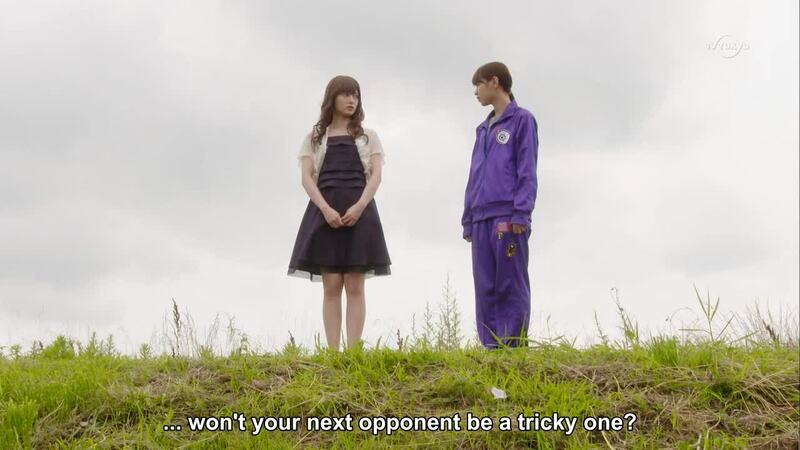 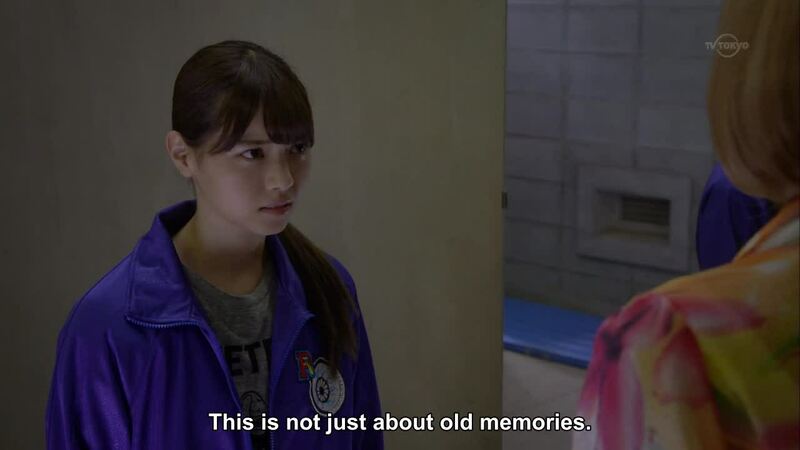 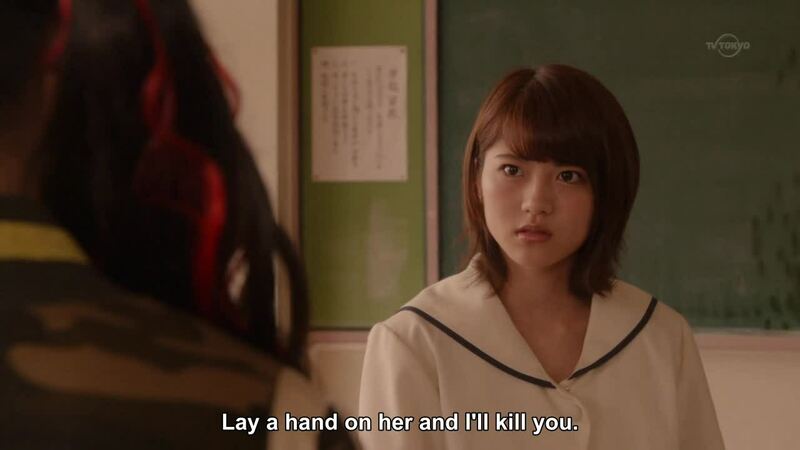 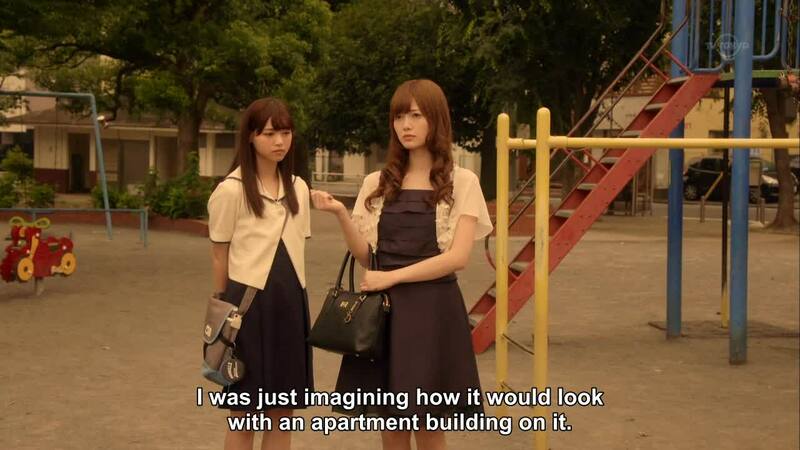 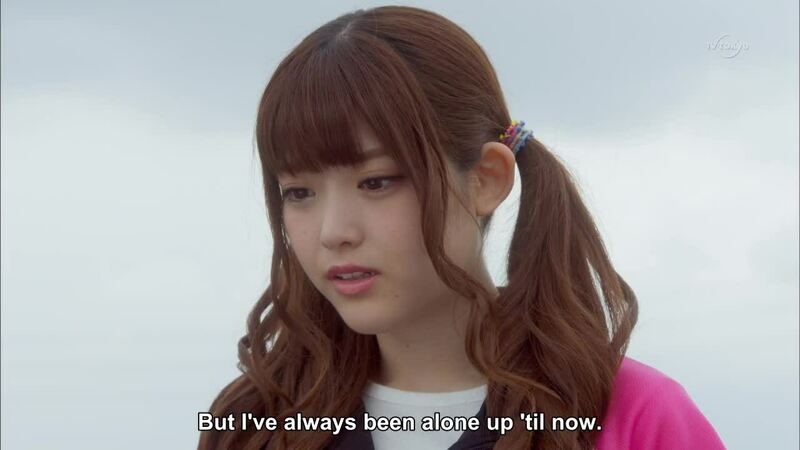 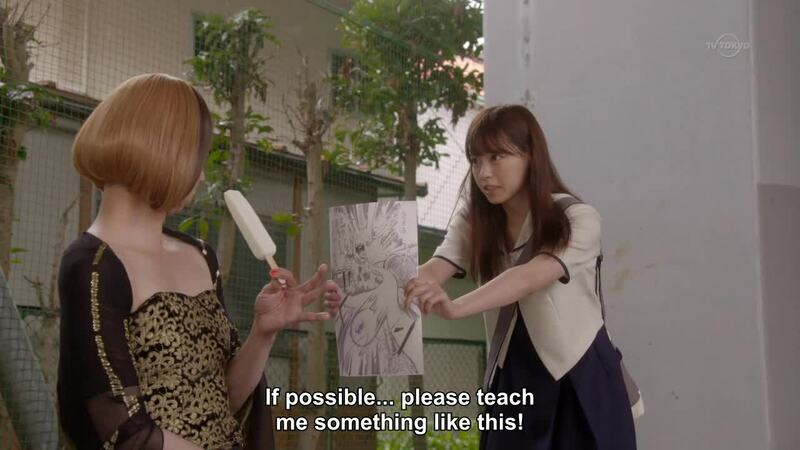 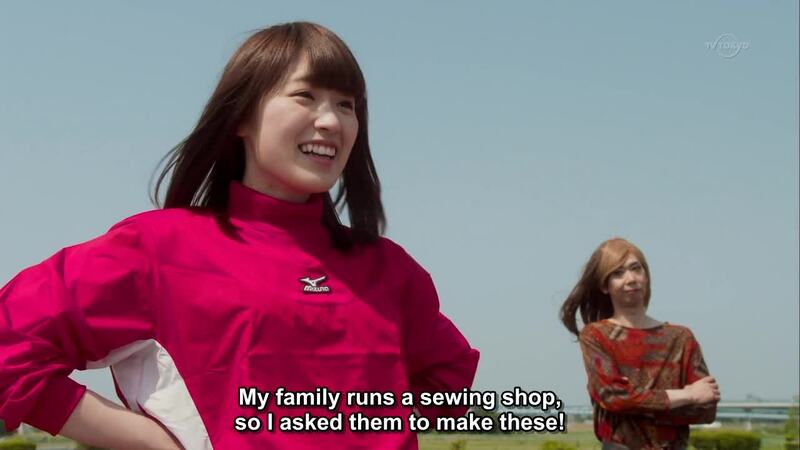 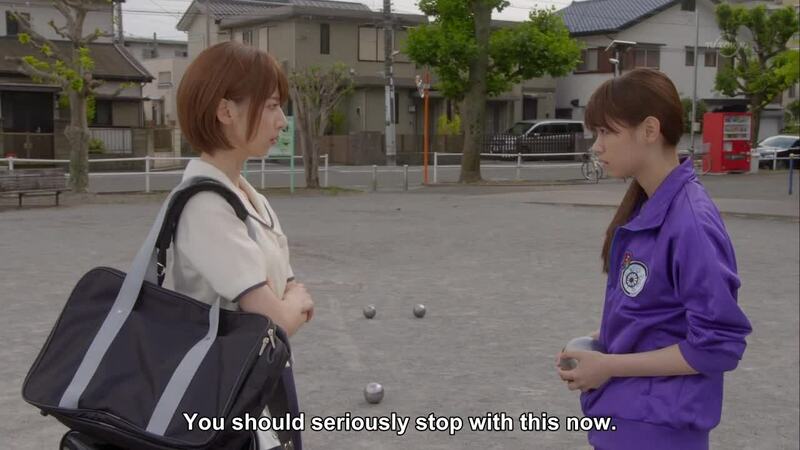 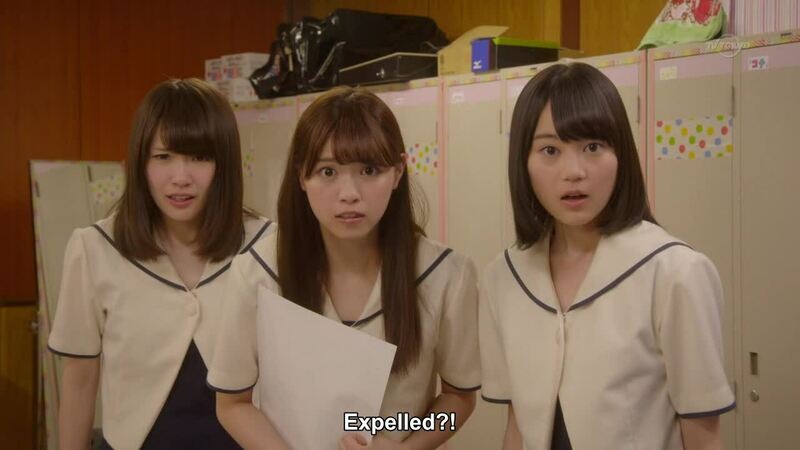 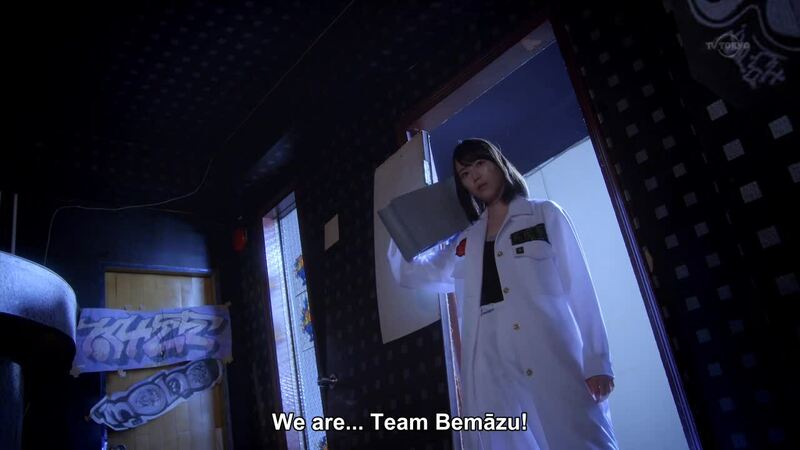 And the Evil team of Mai and Misa. 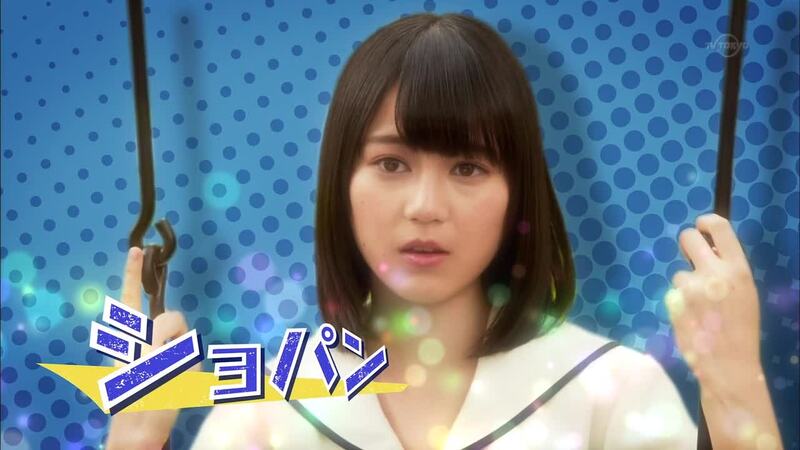 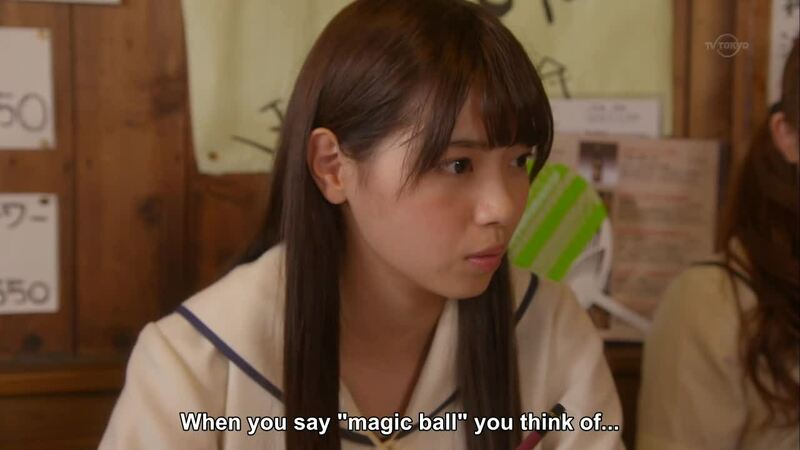 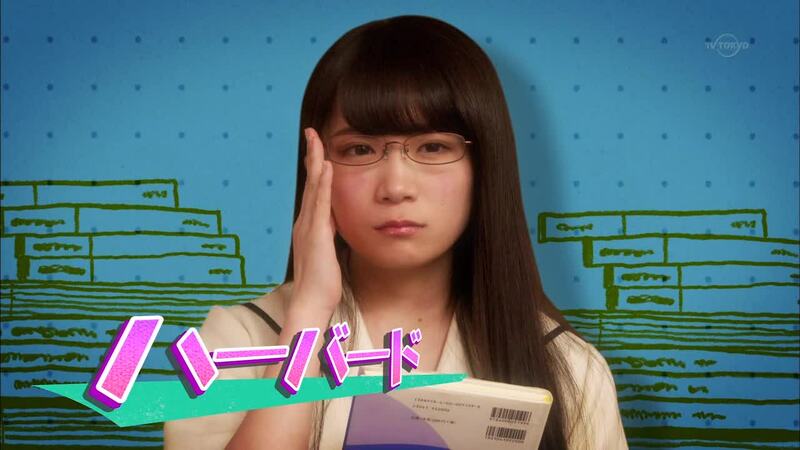 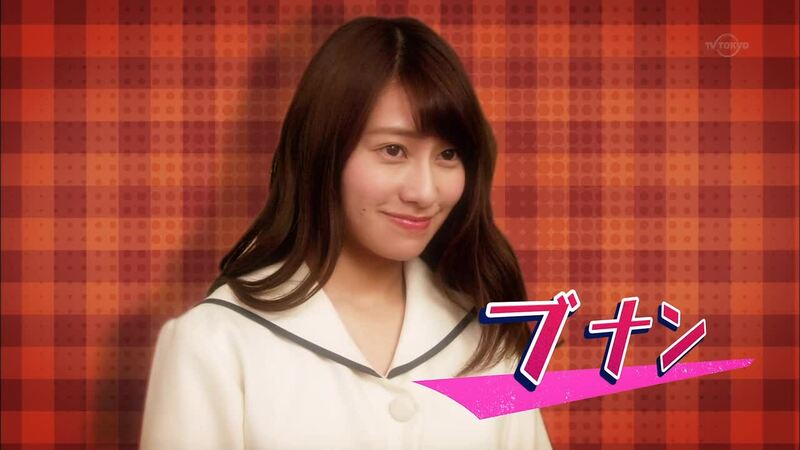 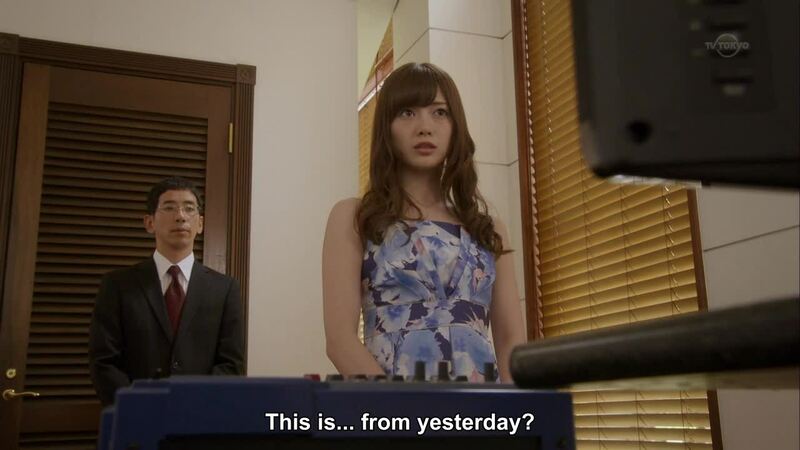 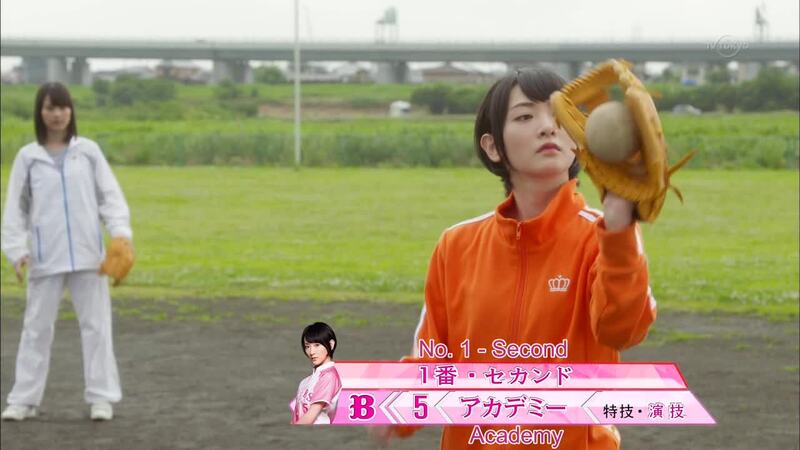 Screenshots from the first episode, no clue if it's going to be subbed but easy enough to follow it without them. 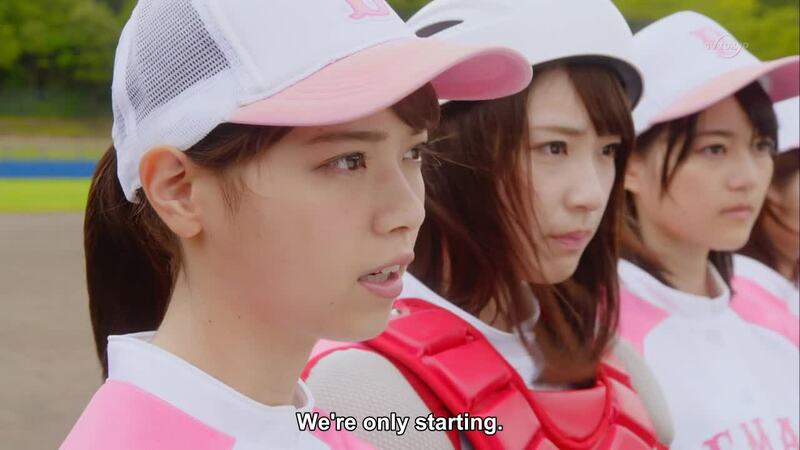 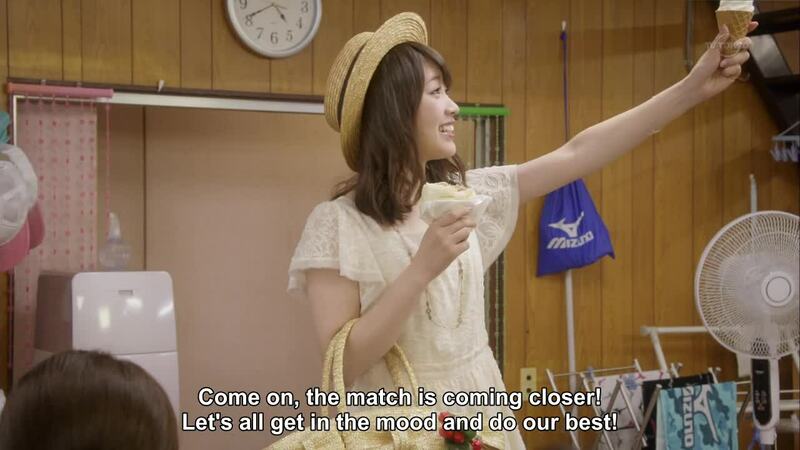 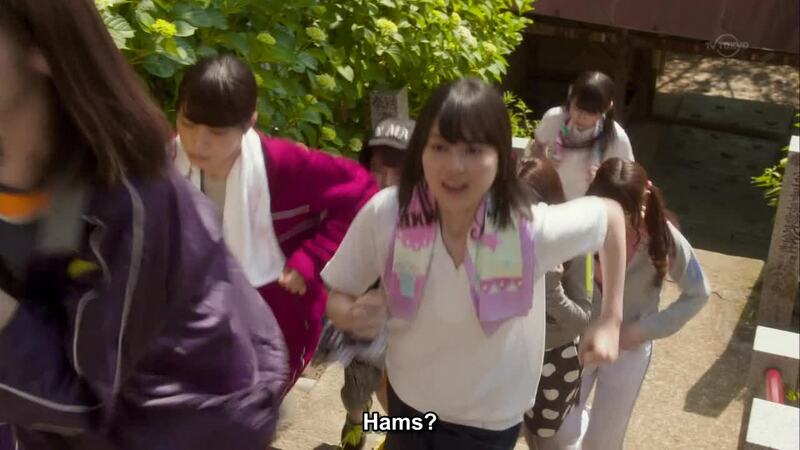 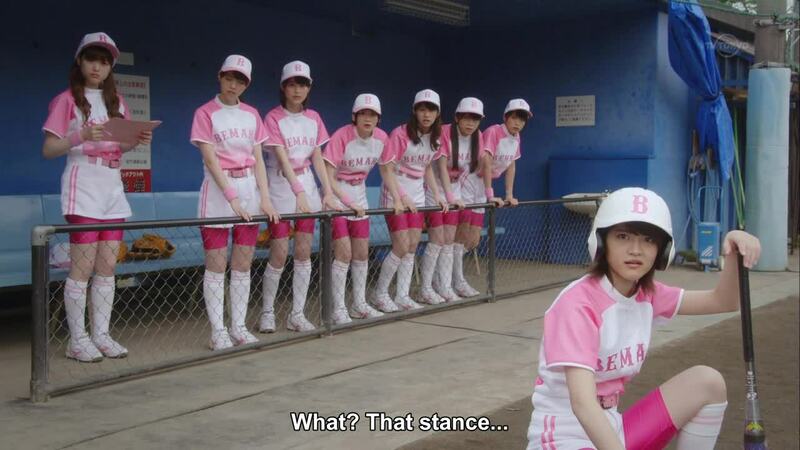 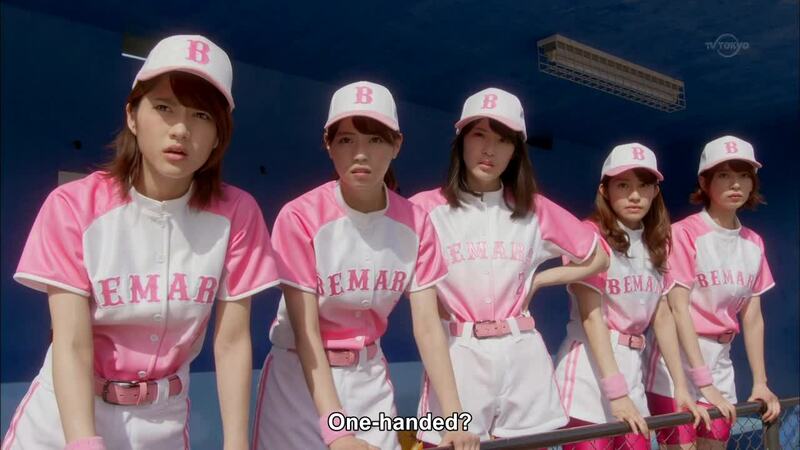 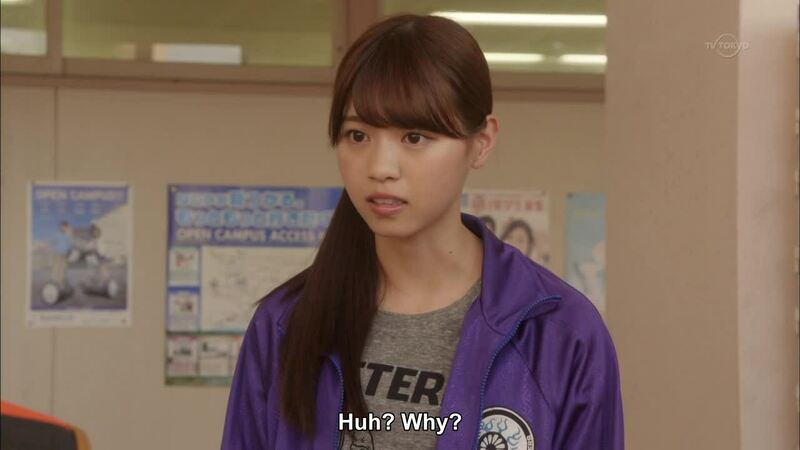 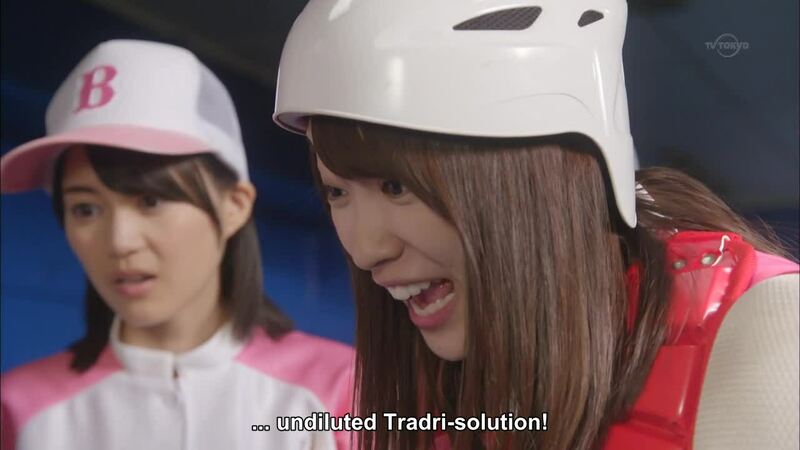 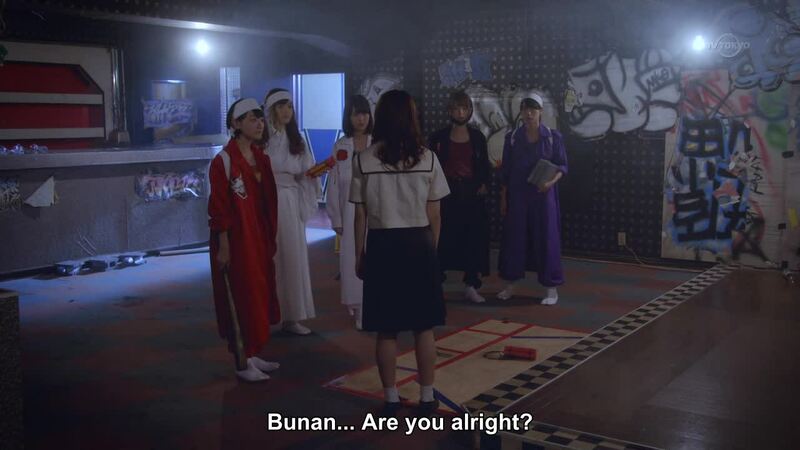 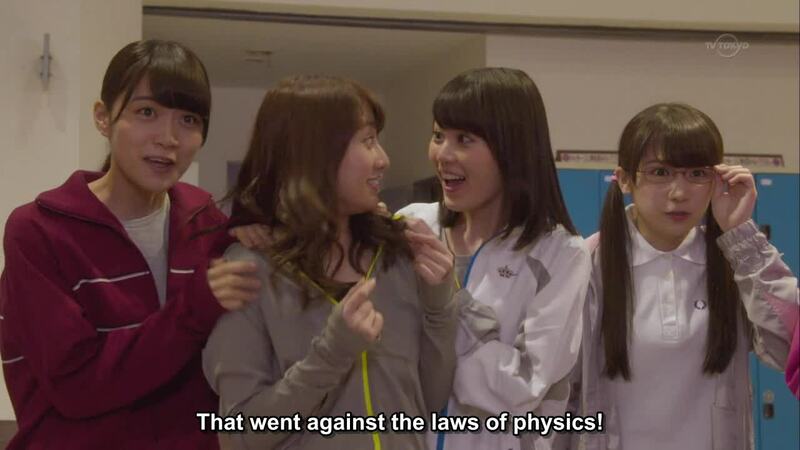 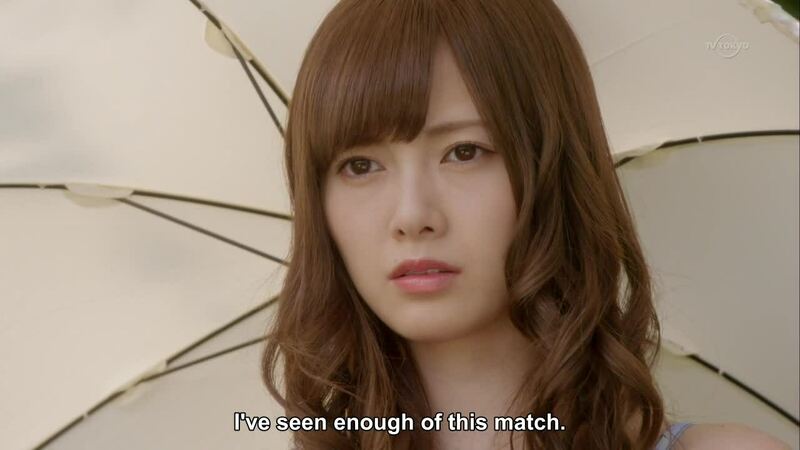 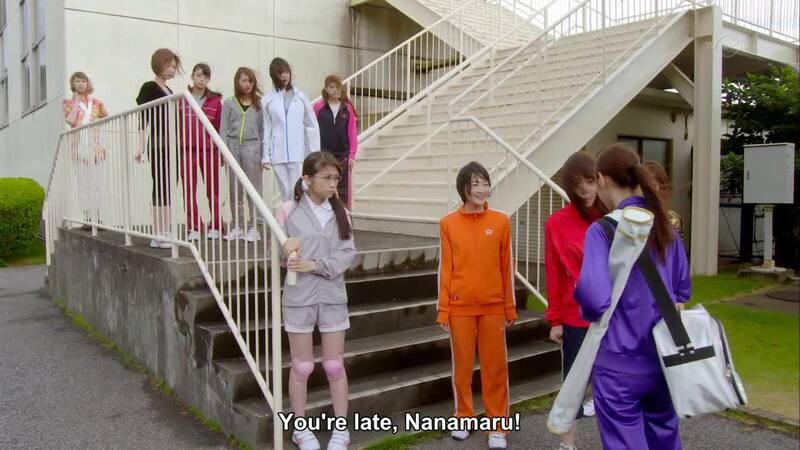 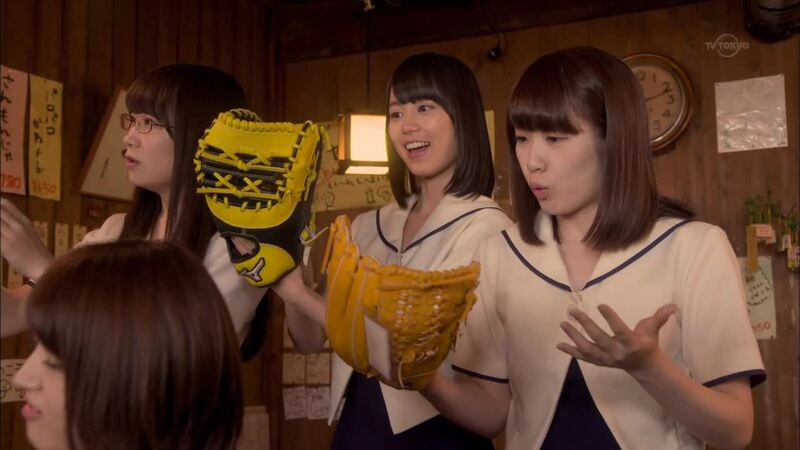 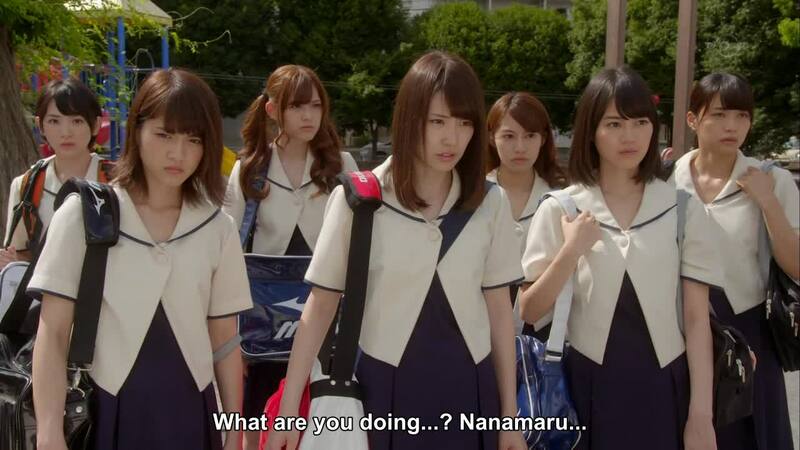 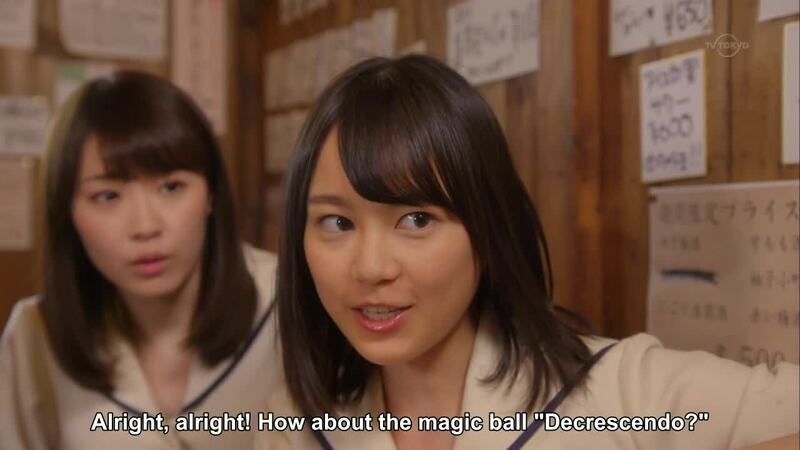 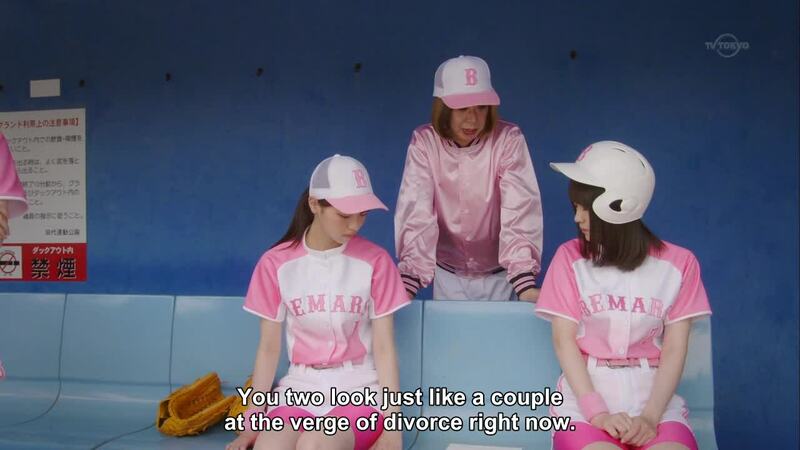 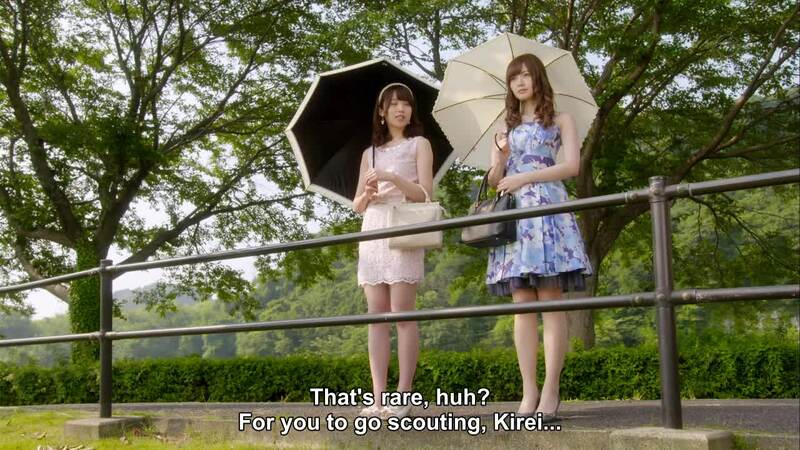 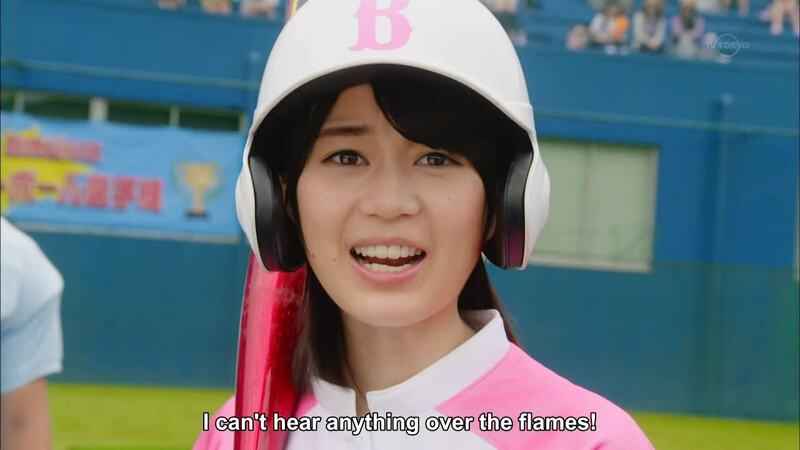 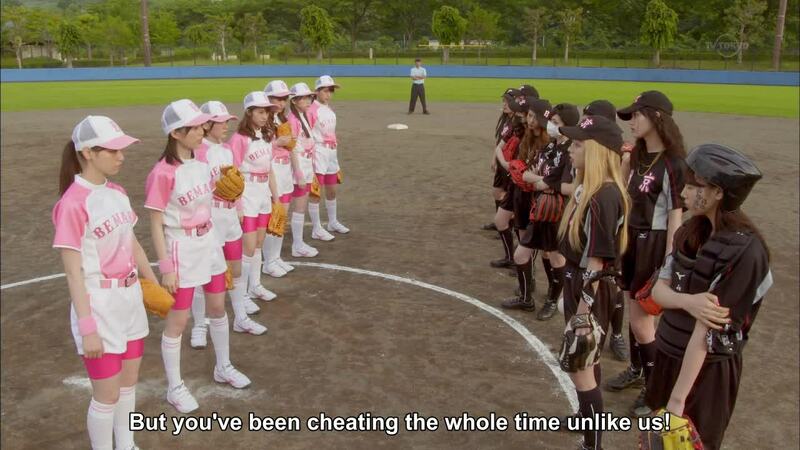 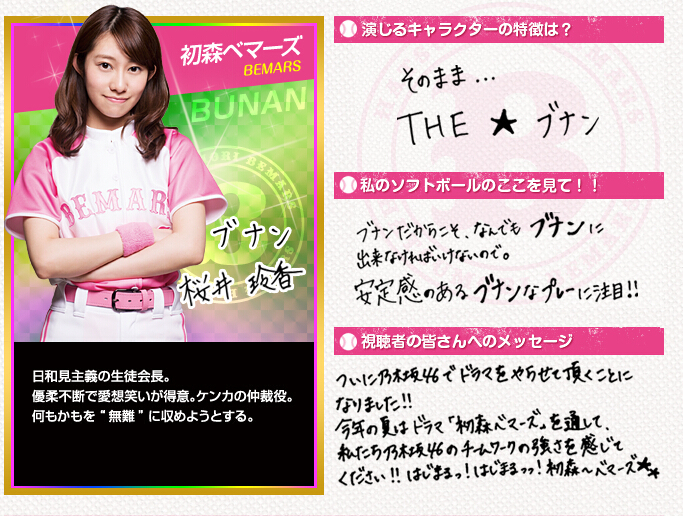 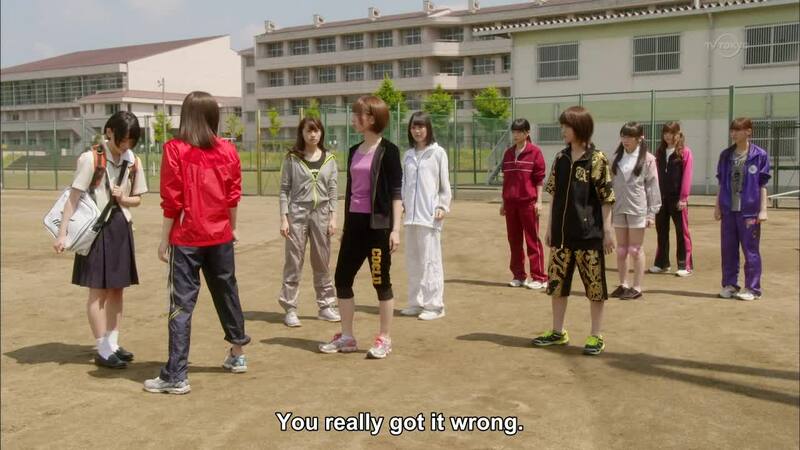 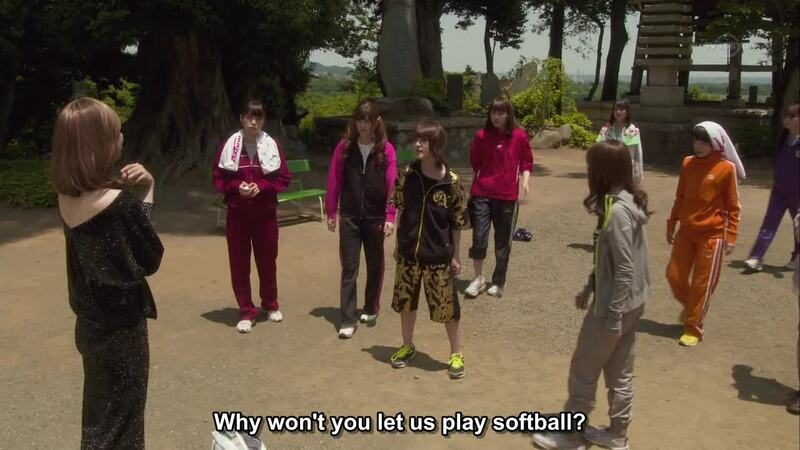 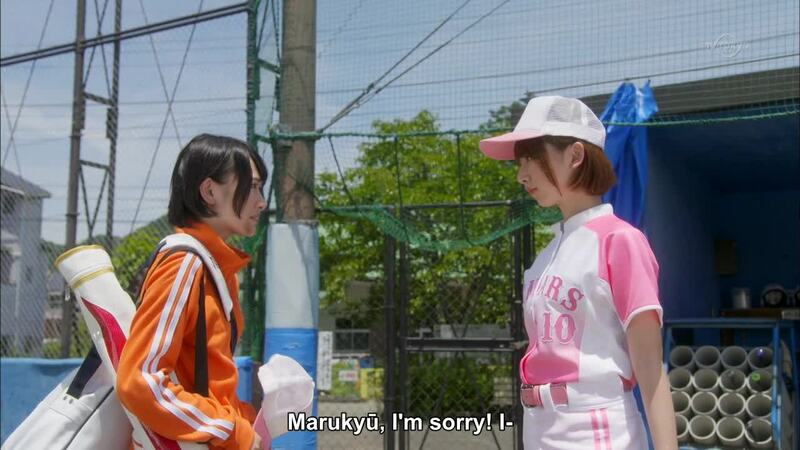 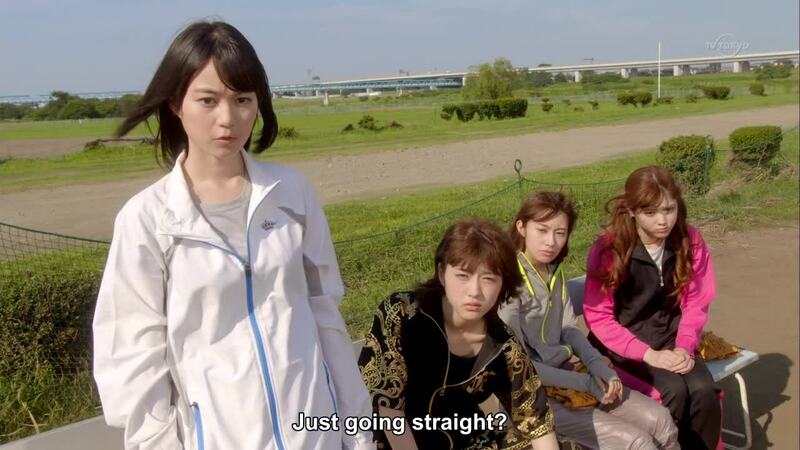 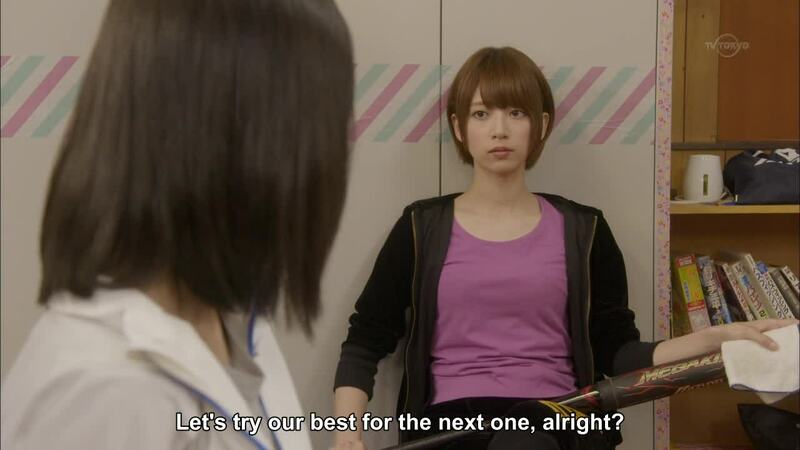 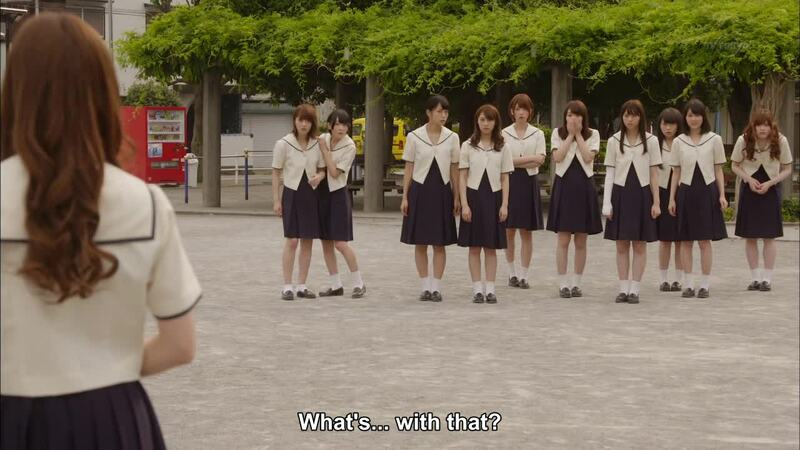 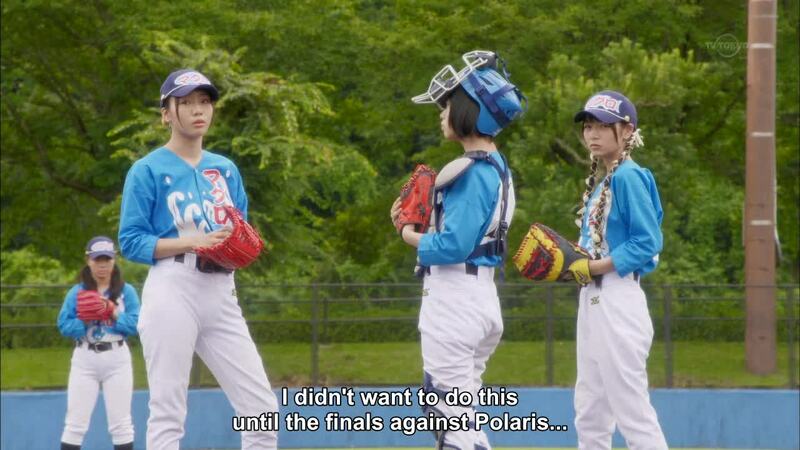 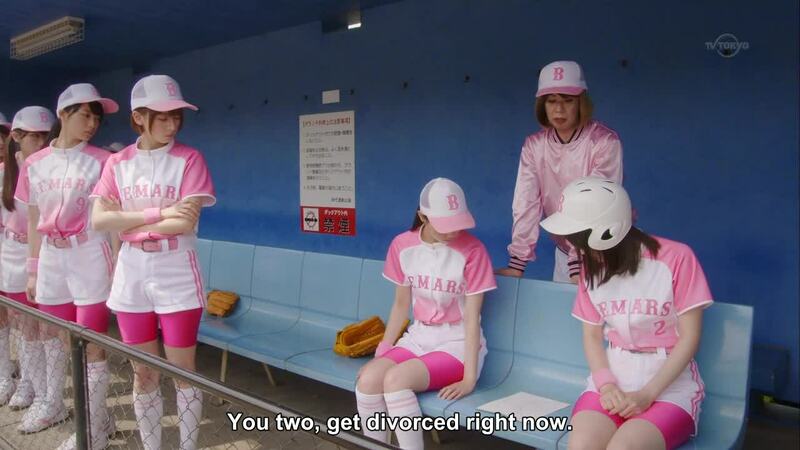 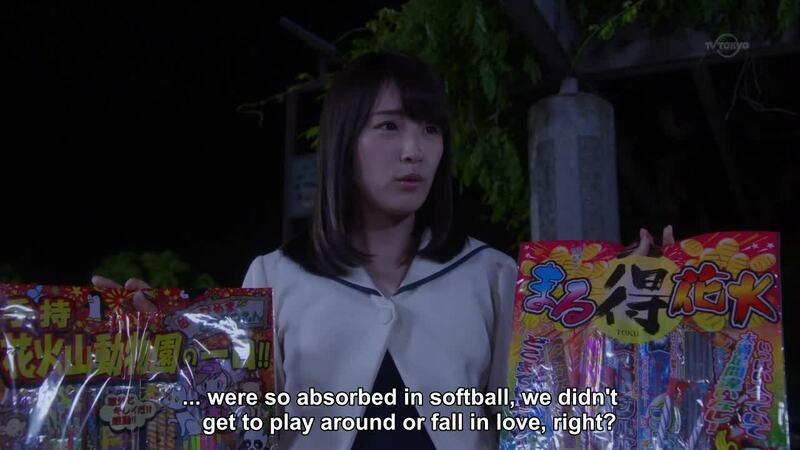 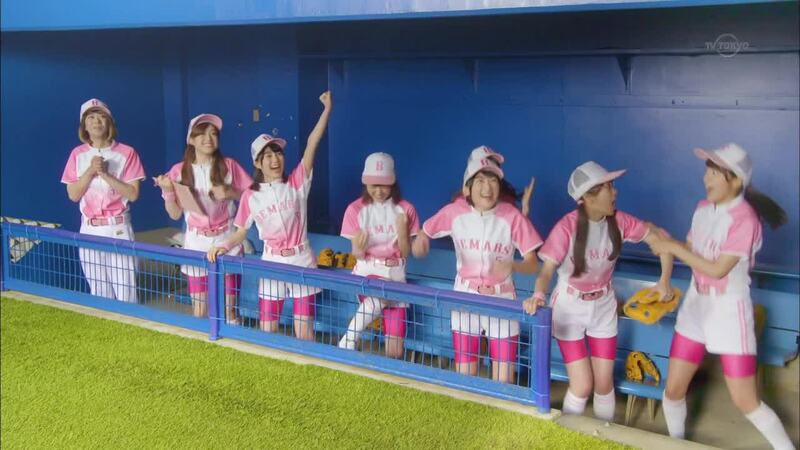 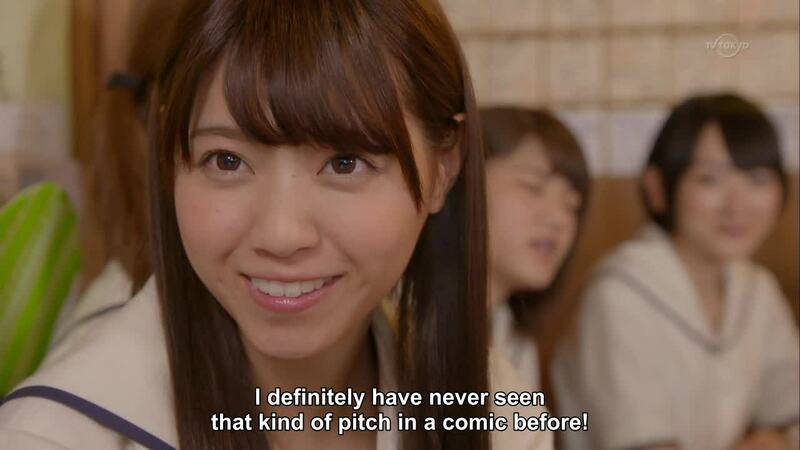 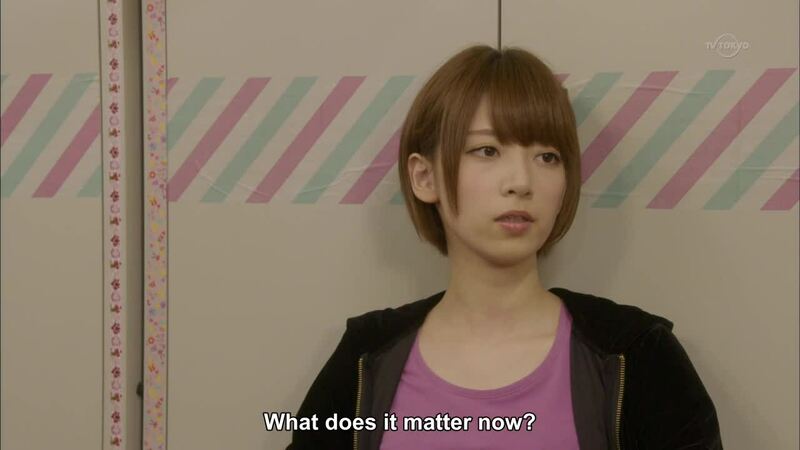 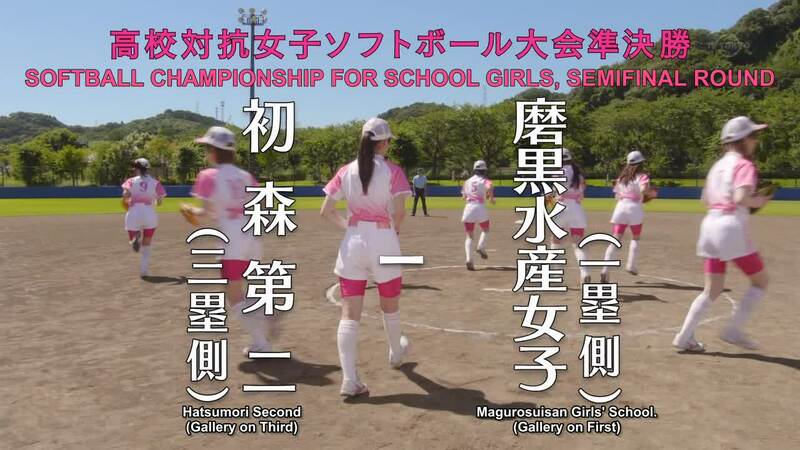 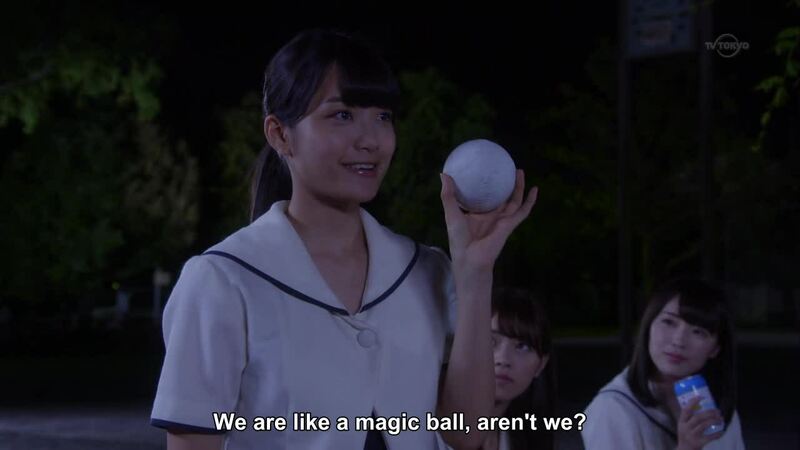 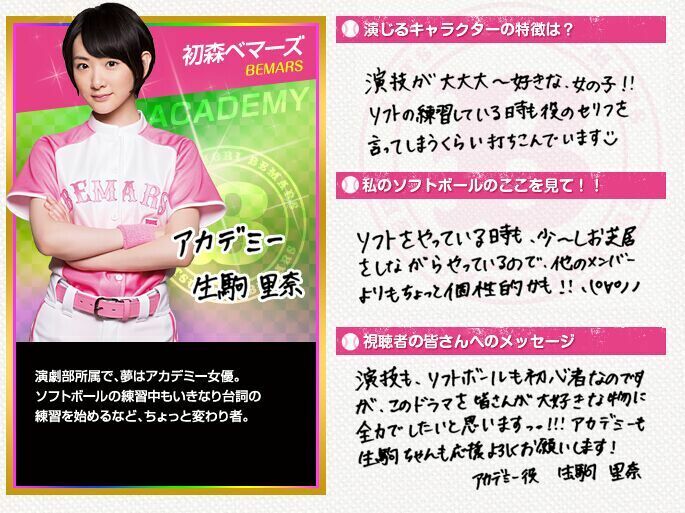 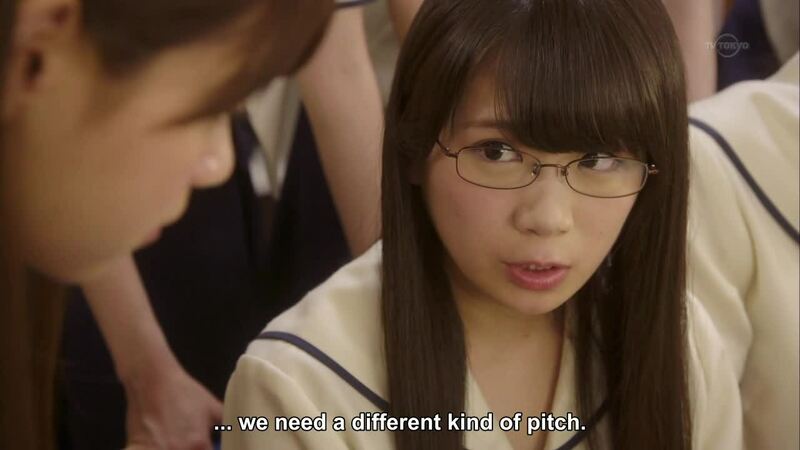 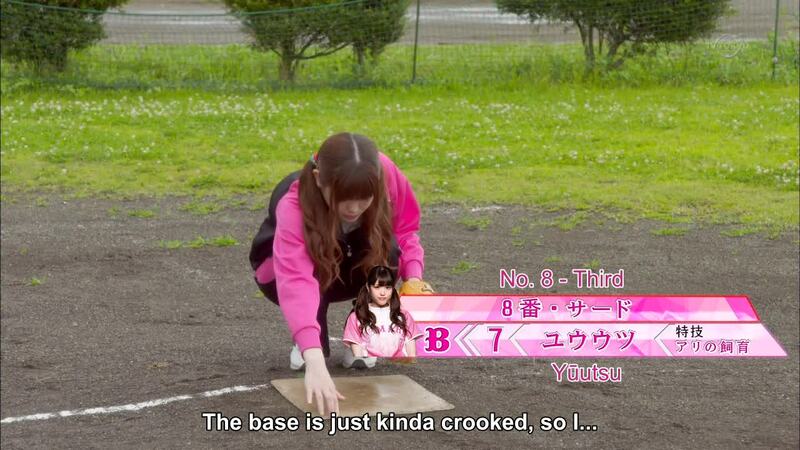 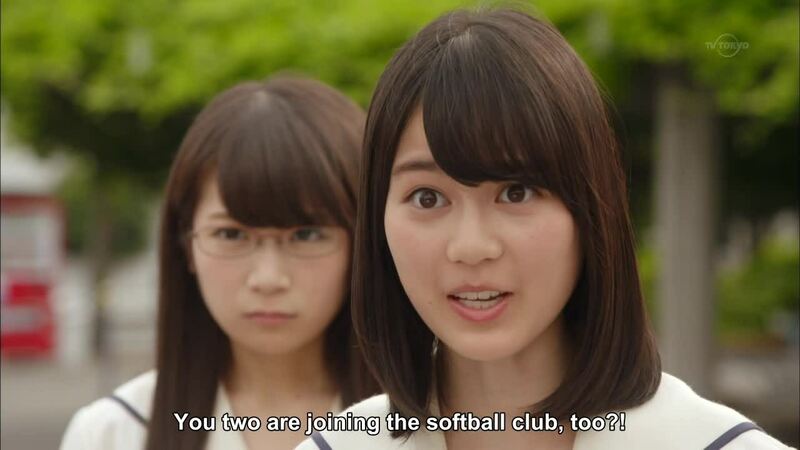 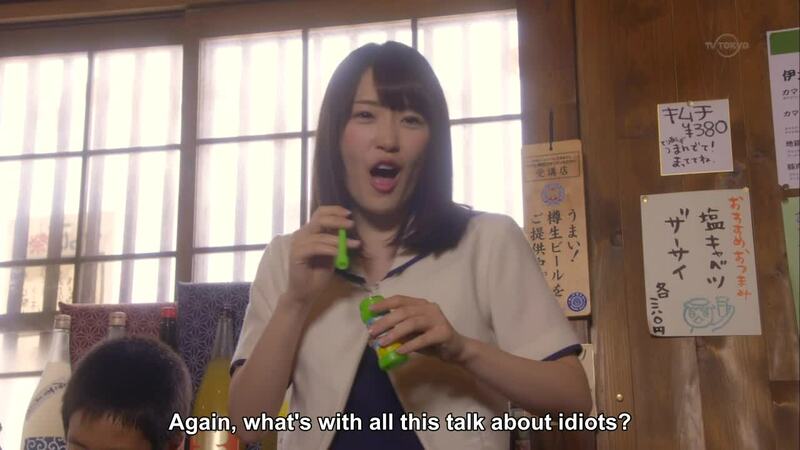 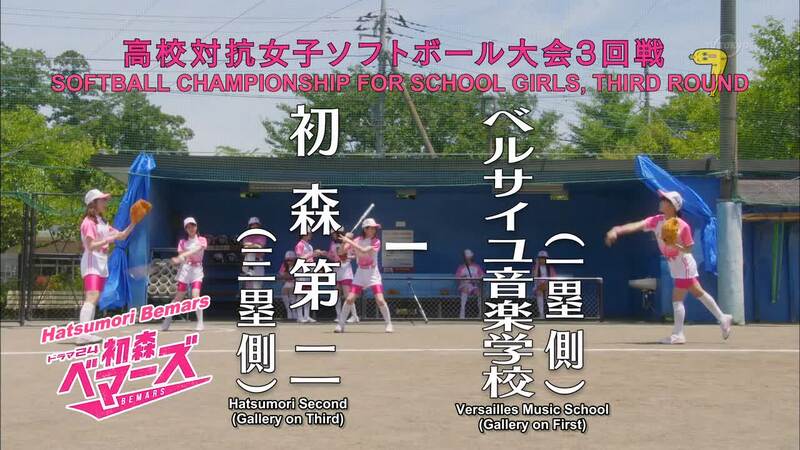 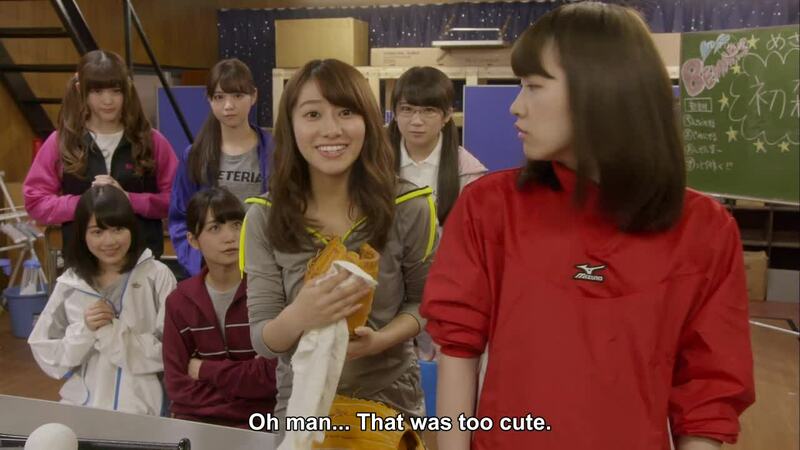 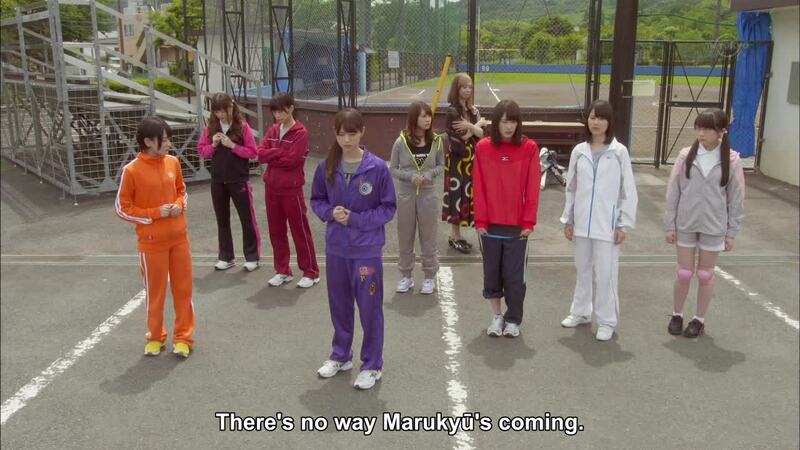 No softball playing yet as the trio of Nanase, Erika and Kazumi are still trying to form a team. 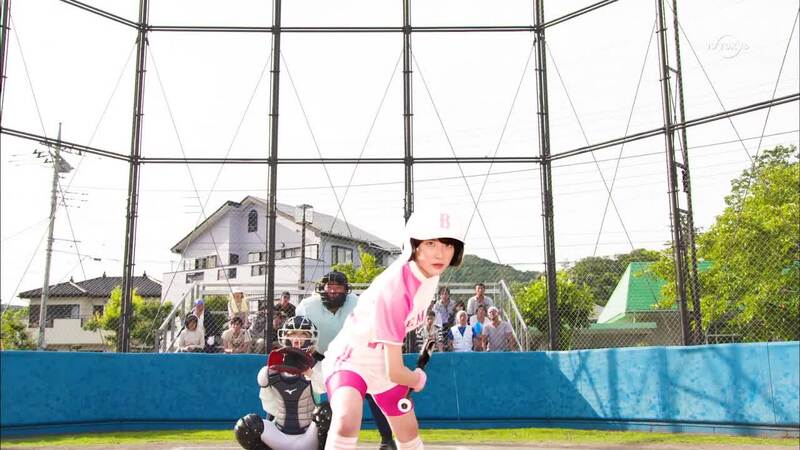 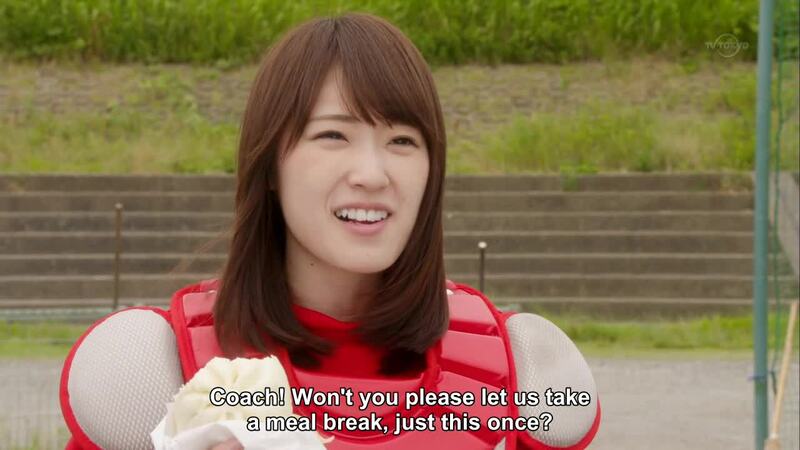 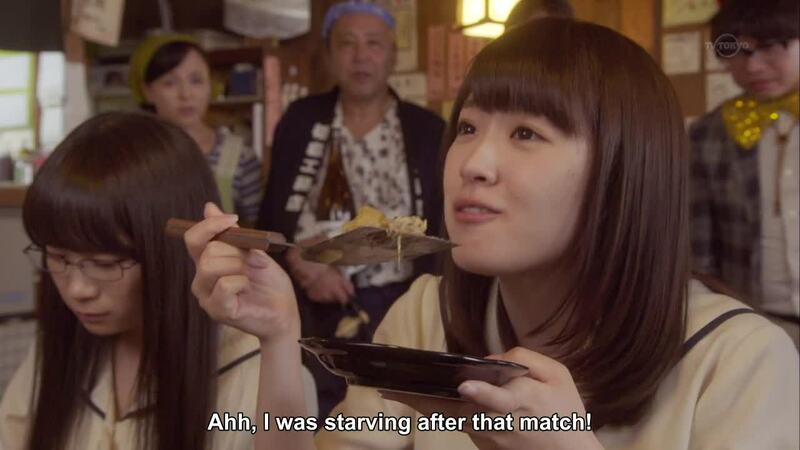 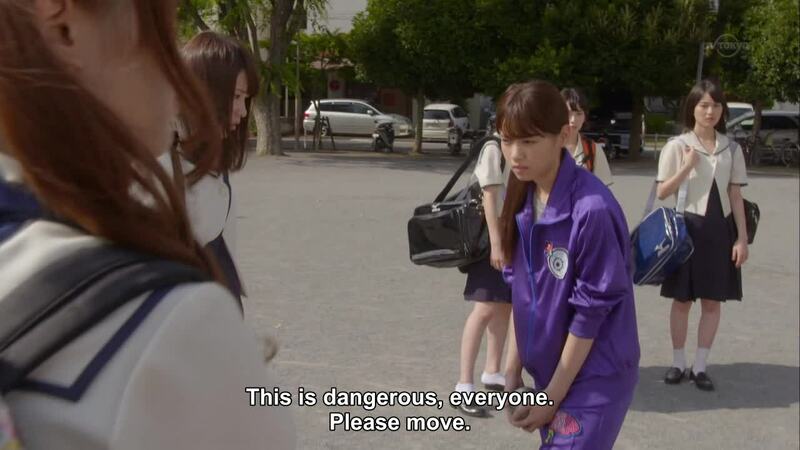 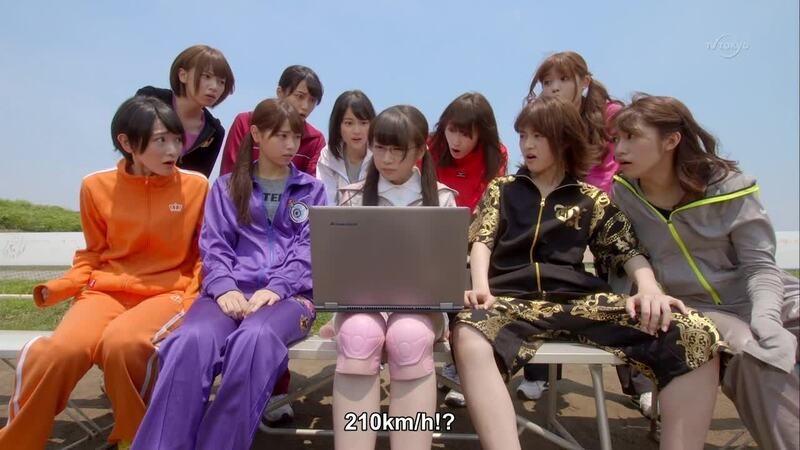 Sayuri and Nanase turn Sports world sideways! 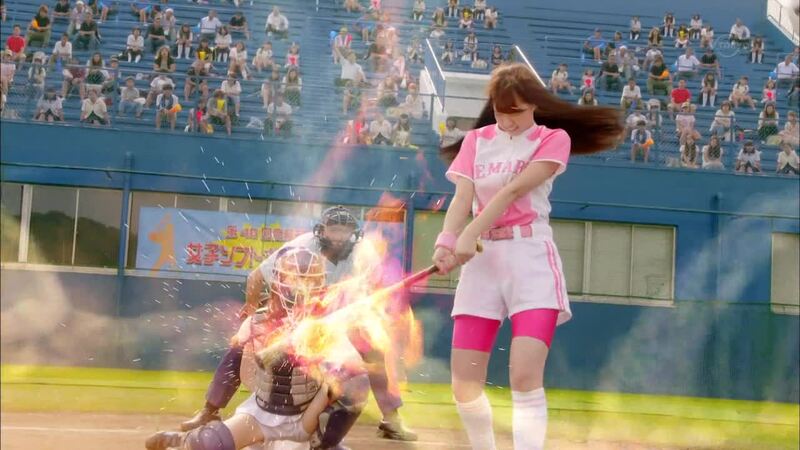 special effects! 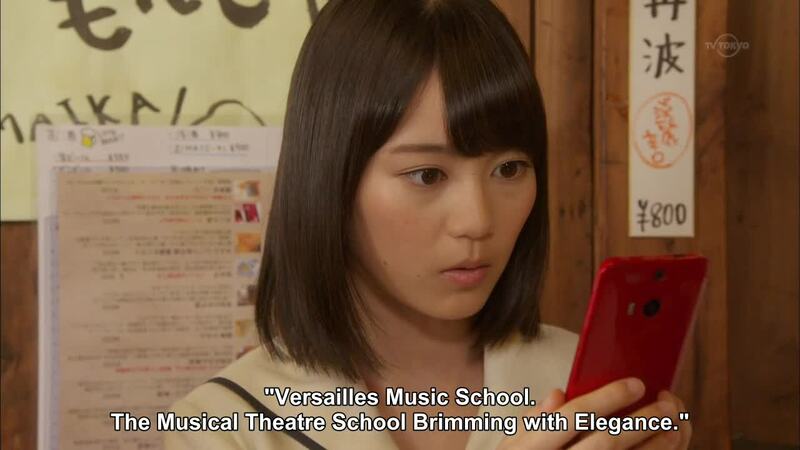 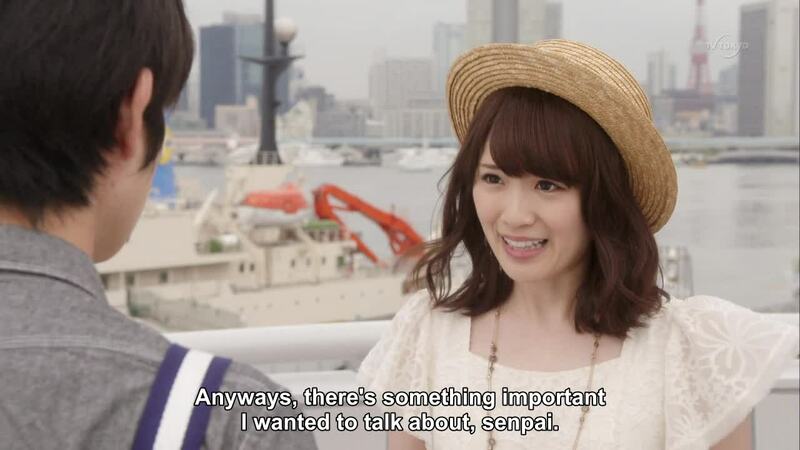 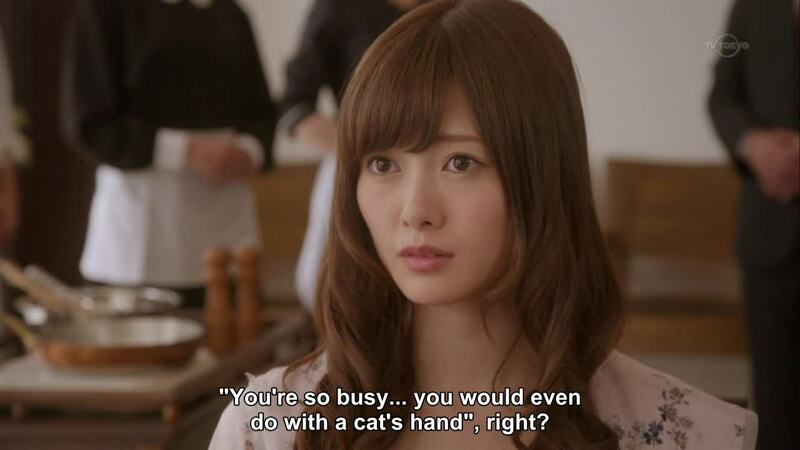 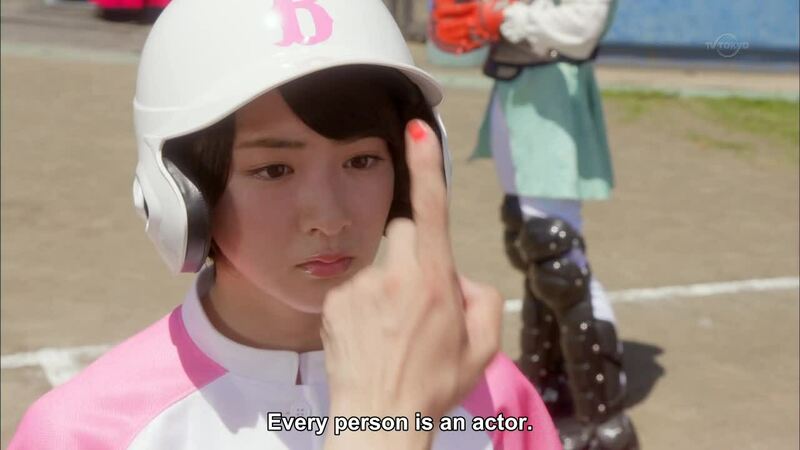 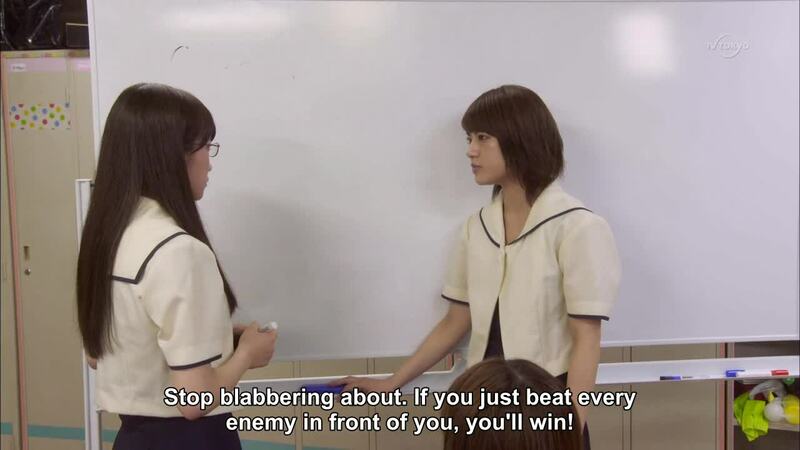 In other words, Idol Drama! 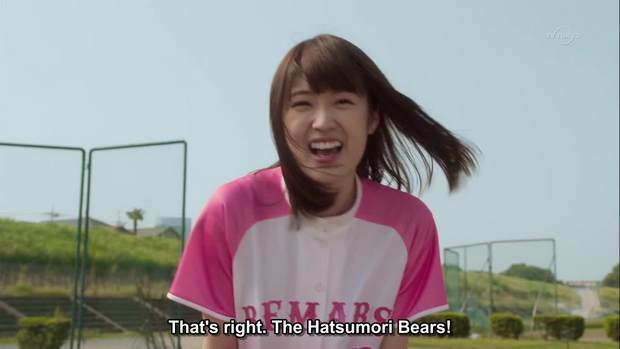 .... no names mentioned (Kazumi) but the team were supposed to be named after the 'Bad News Bears' until someone spelled the name wrong ordering the jerseys. 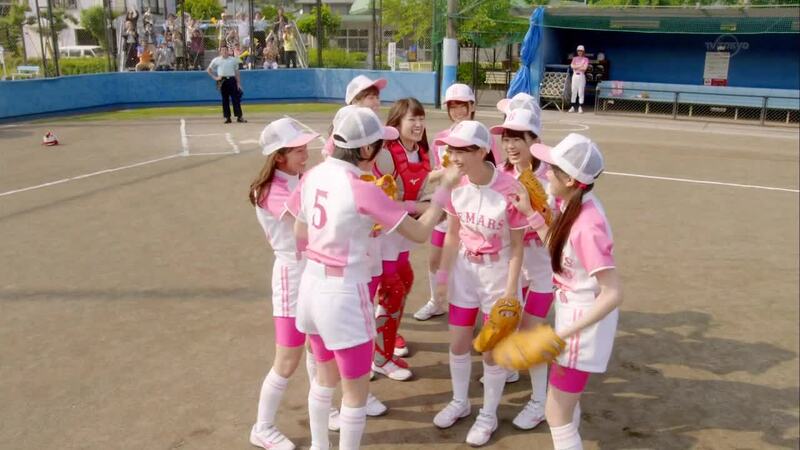 The team's positions are finally settled^^ in the third episode and this being a drama the show ended off in a dramatic way, of course they're the 46th ranked team in the softball tournament. 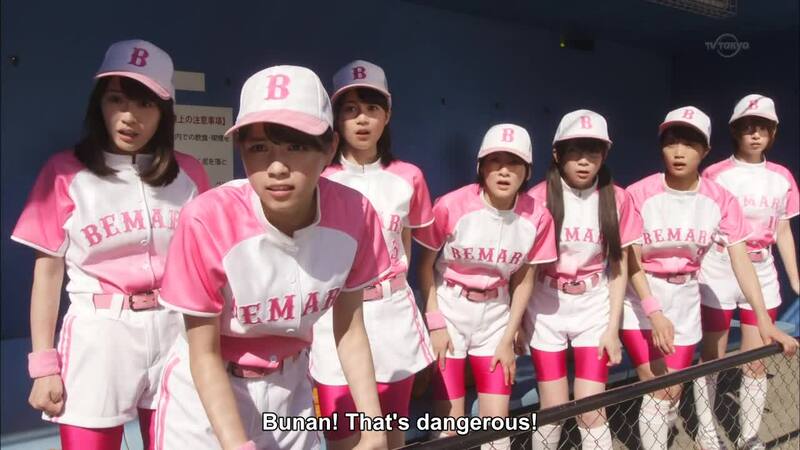 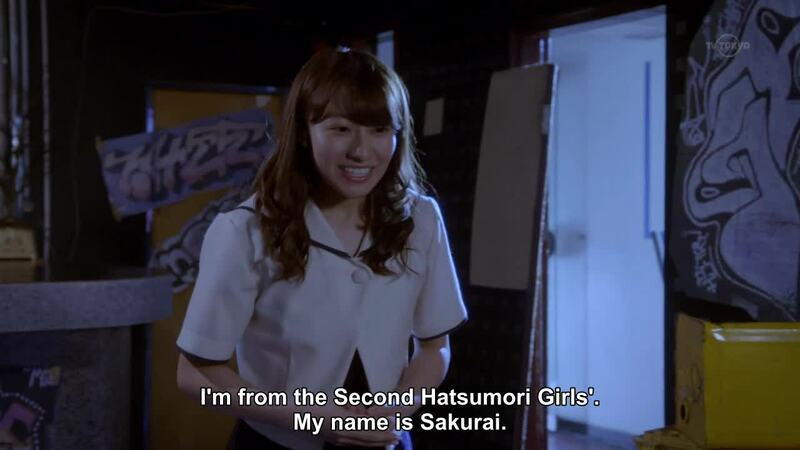 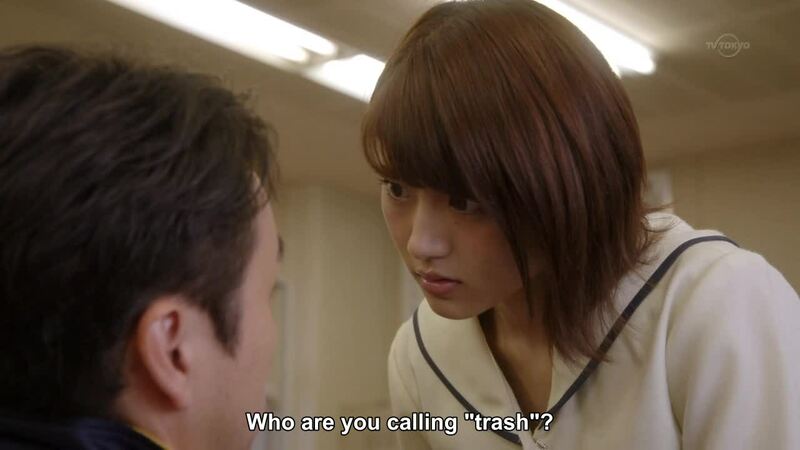 .... as the other names are actually their nicknames but didn't learn that until this episode. 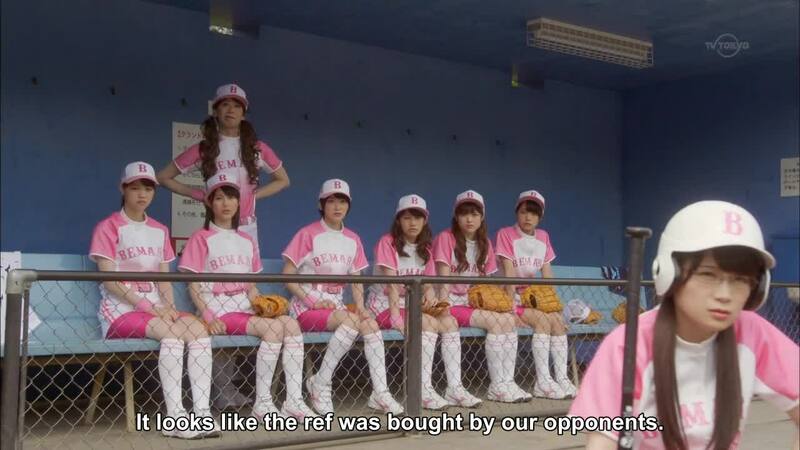 Once again they won in dramatic fashion though they'll never be confused with The Big Red Machine. 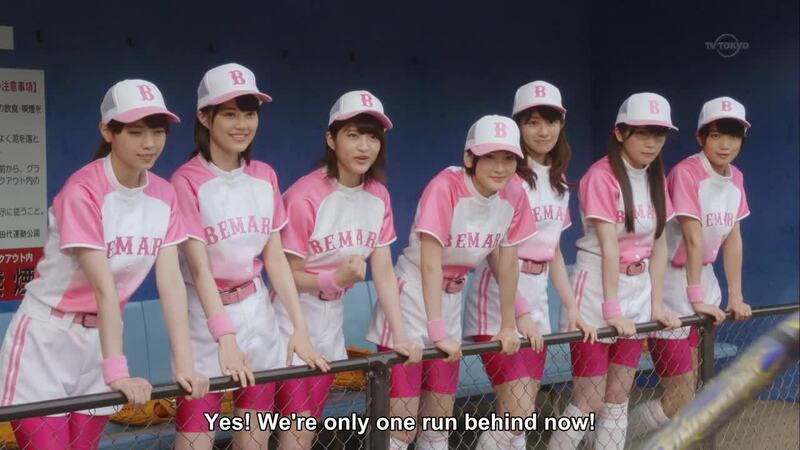 .... and though another team they won't be confused with are the '27 Yankees and their 'Murderers Row' the Bemars certainly have a knack for hitting a HR with two outs in the final inning. 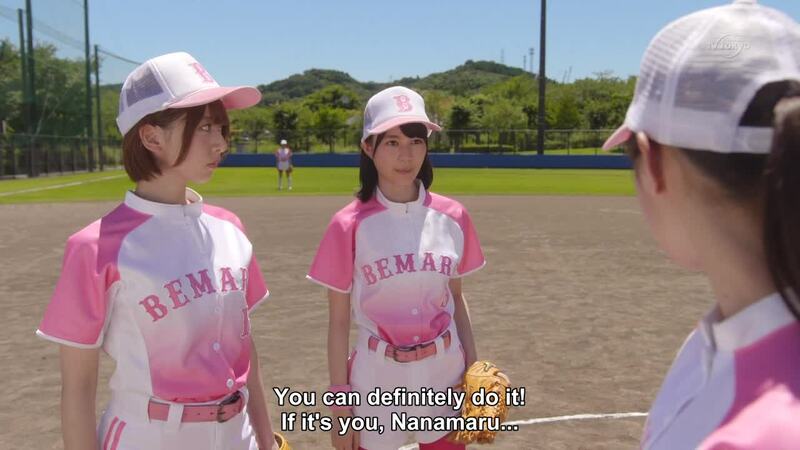 .... barrage of runs this game as the teams combined for seven of them, as usual a two out HR in the seventh has catapulted the Bemars into the next round! 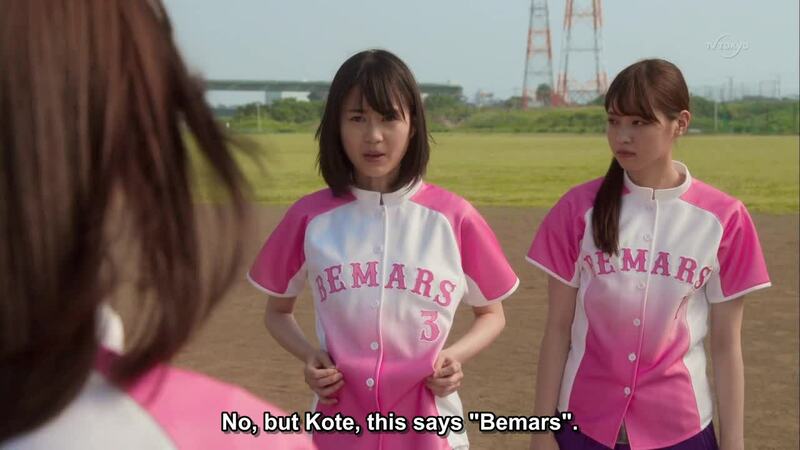 .... er, some do Kirei as for a change the Bemars didn't need a two out homer in the final inning to secure a victory, with only 46 teams how many rounds can there be? 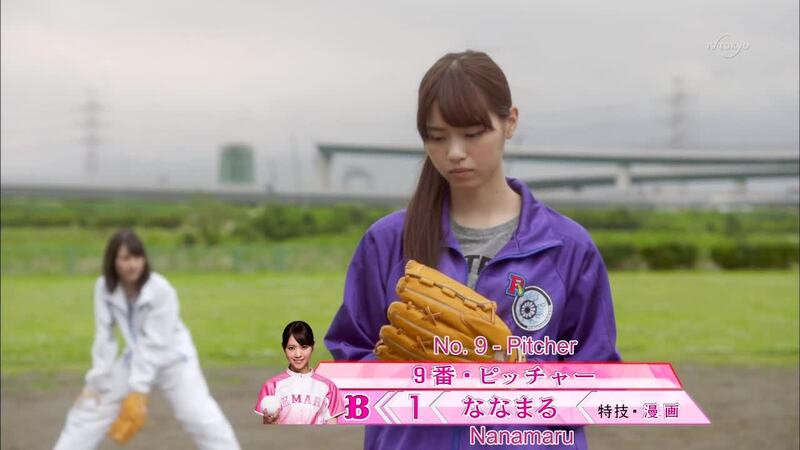 .... and the competition is getting more brutal, result of this game was, was.... sigh, to be continued on the next episode(9th) as the first batter of the game is still up. 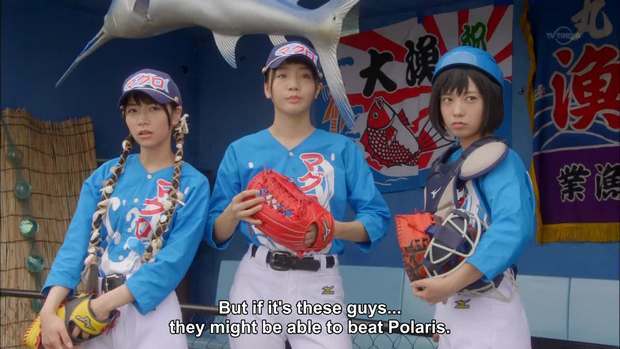 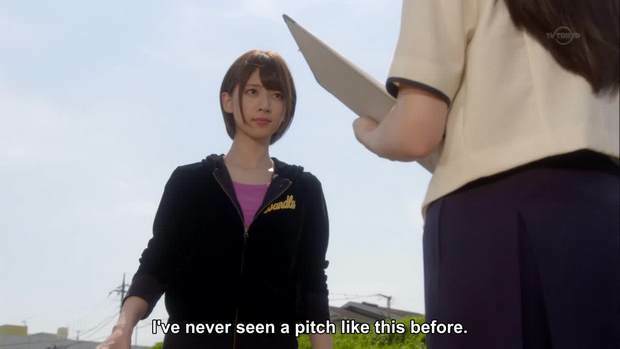 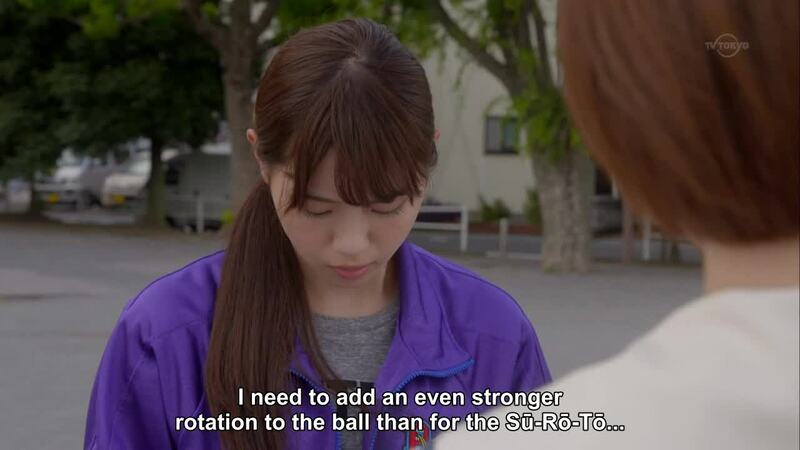 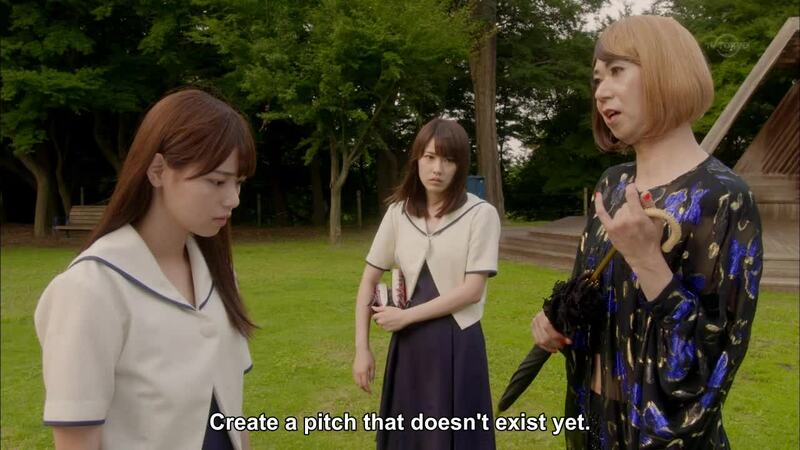 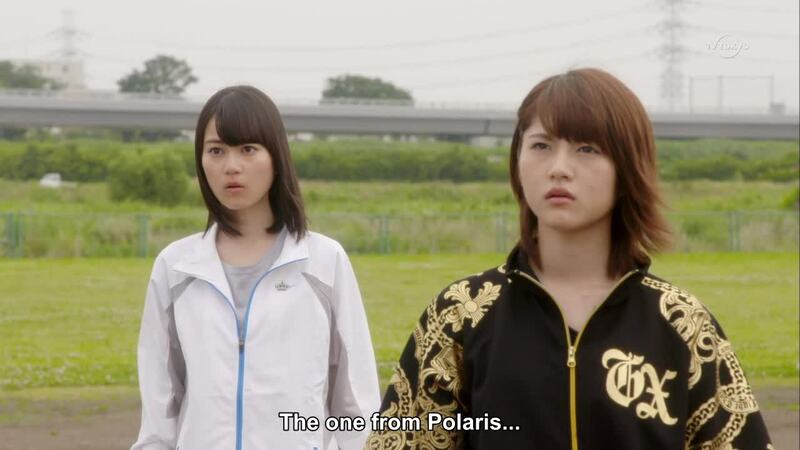 .... as Nanamaru's Su-Ro-To pitch will have no effect on the power lineup of the Polaris team, can she invent a new pitch never seen before? 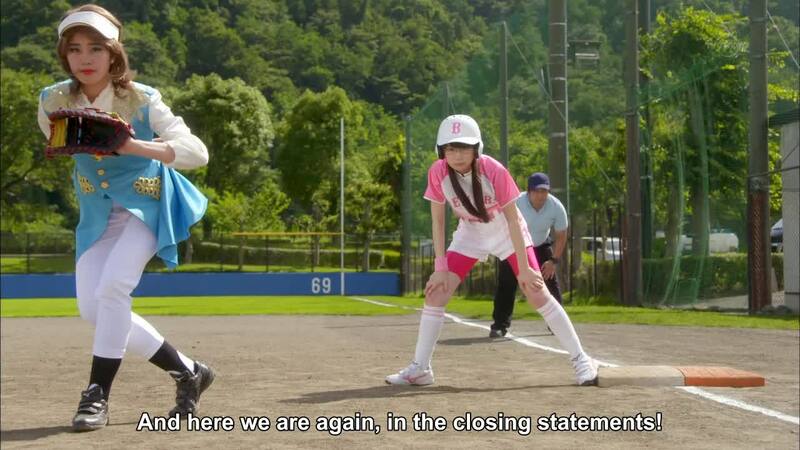 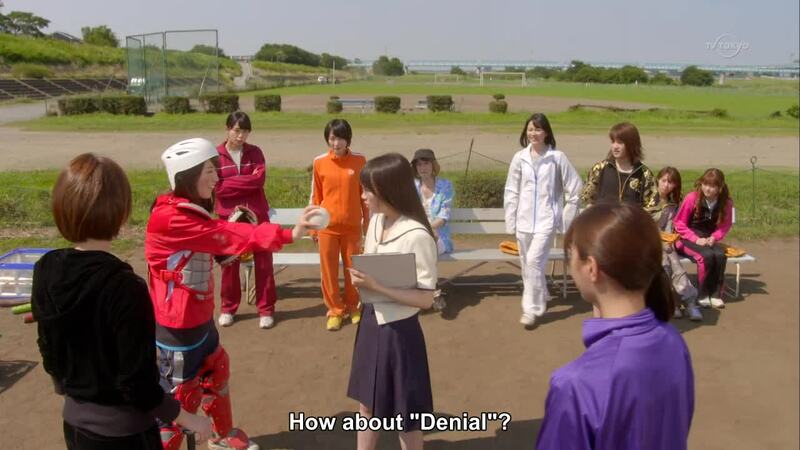 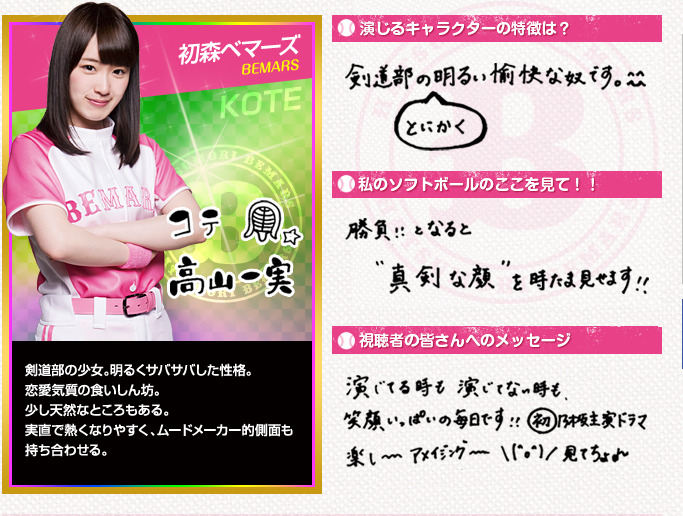 .... a pitch which Kote has lamely dubbed "Denial", title game starts this week. 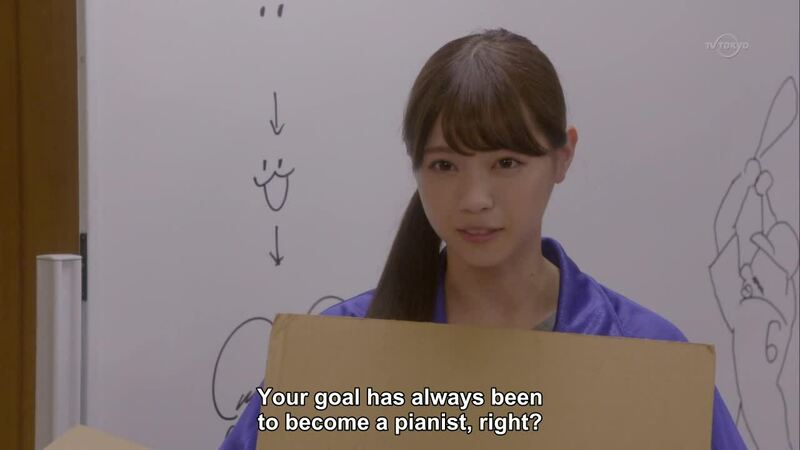 .... though someone wants to crush their impossible dream. 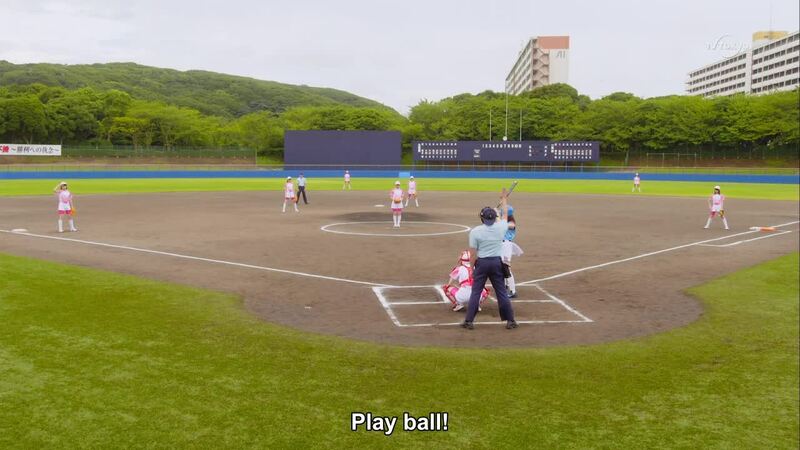 Things are stretched out a bit as the first batter is finally getting into the box as the show ends, the finale to the game and series is this Friday. 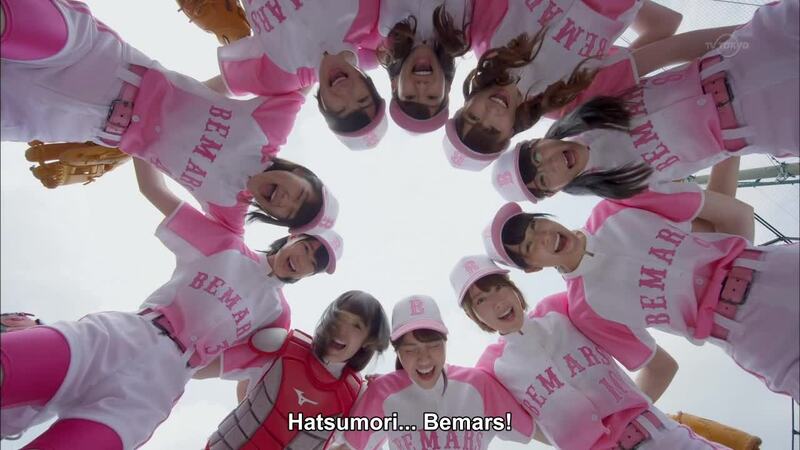 So Bemars 2 is a thing now. 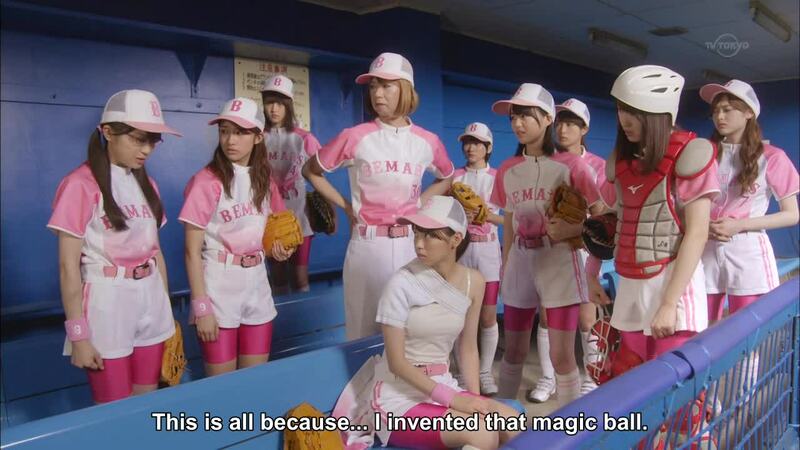 I woke up and saw this. 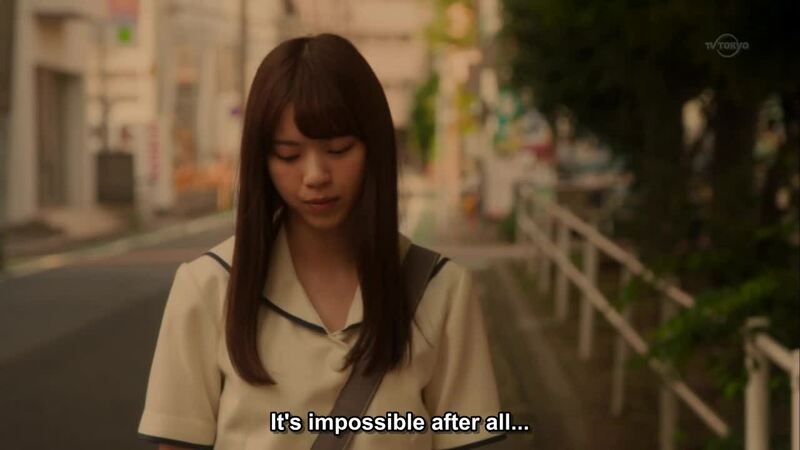 Needed to double check I wasn't still dreaming. 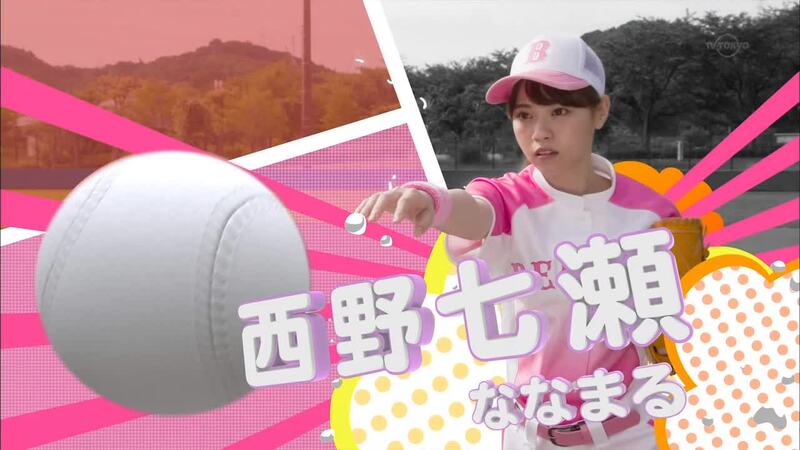 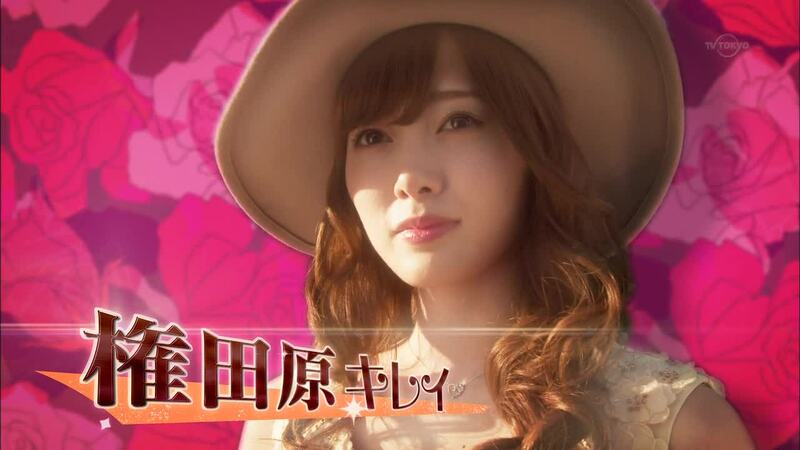 AKB48 member Shimazaki Haruka (島崎遥香) and HKT48 member Miyawaki Sakura (宮脇咲良) have joined the cast for next season of Nogizaka46's TV series "Hatsumori Bemars" (初森ベマーズ). 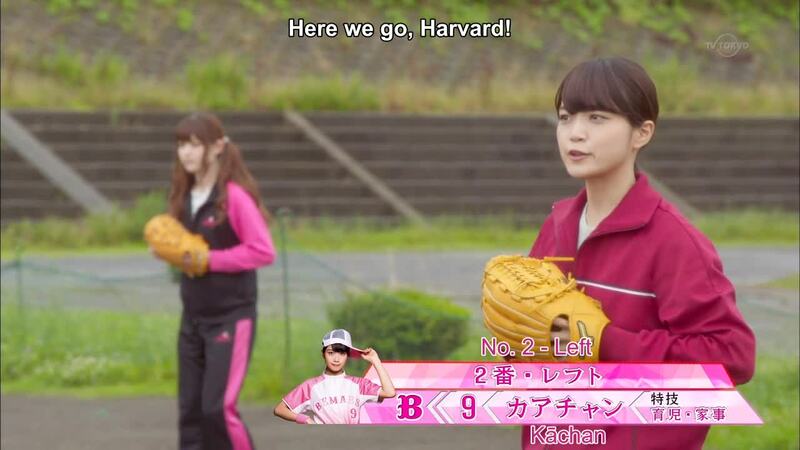 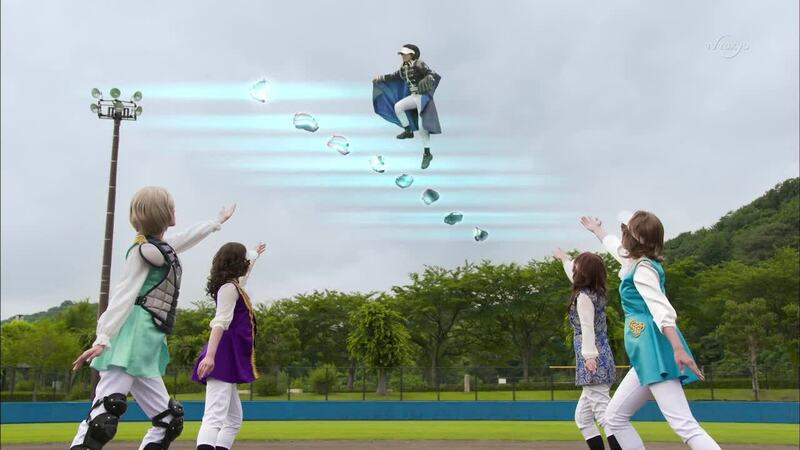 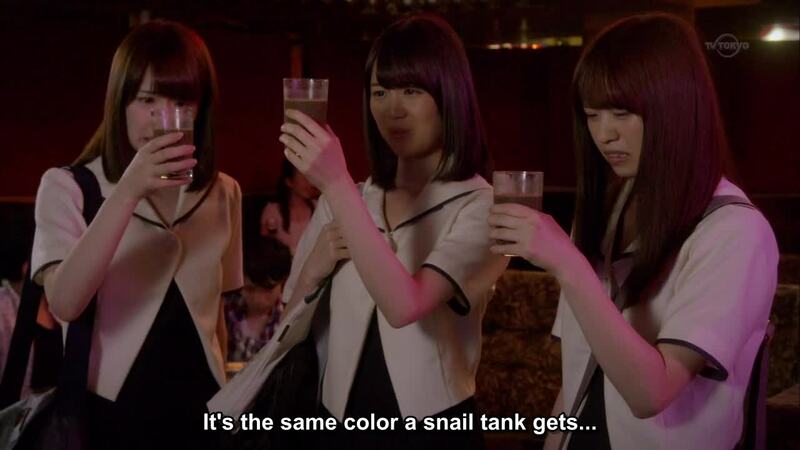 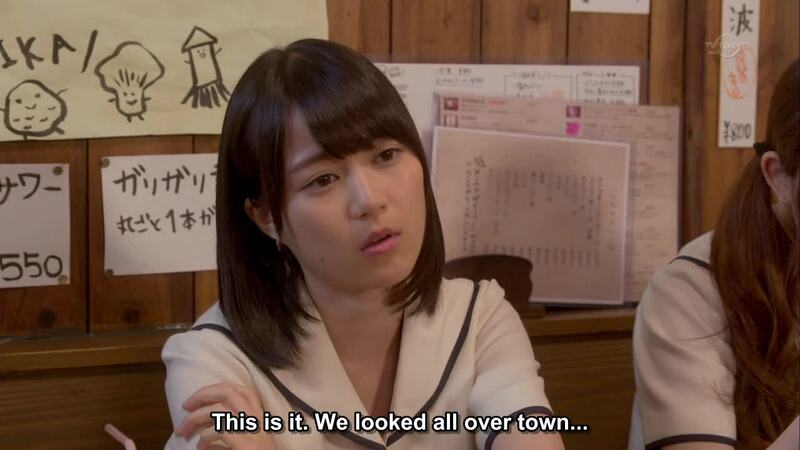 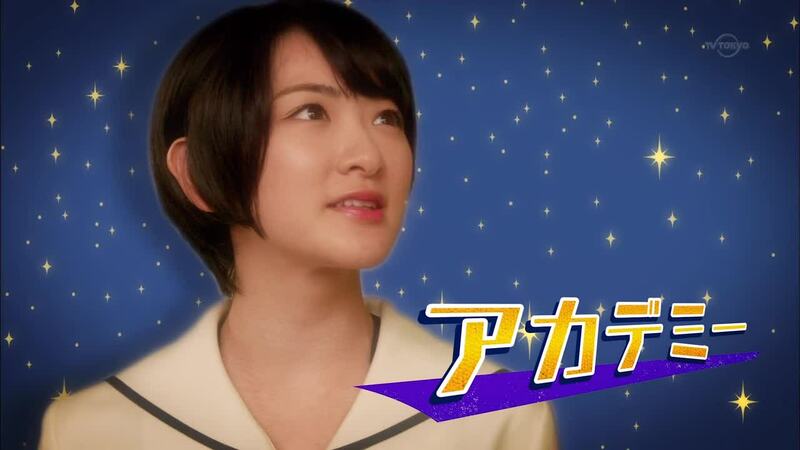 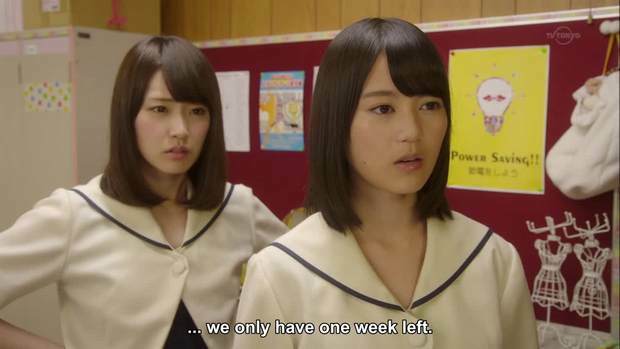 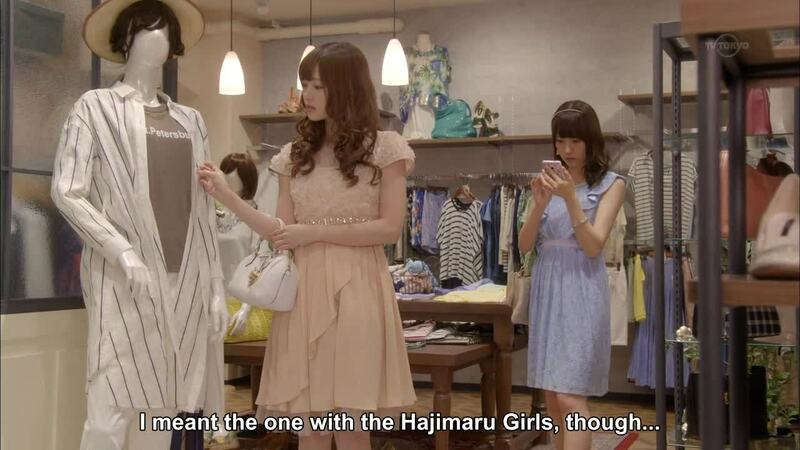 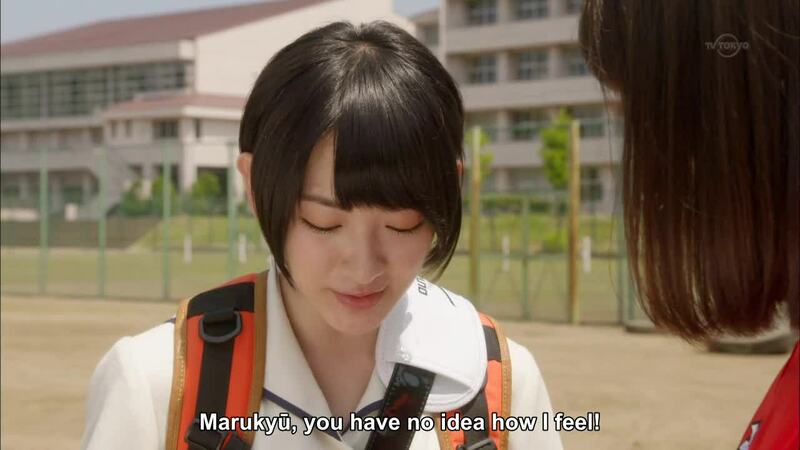 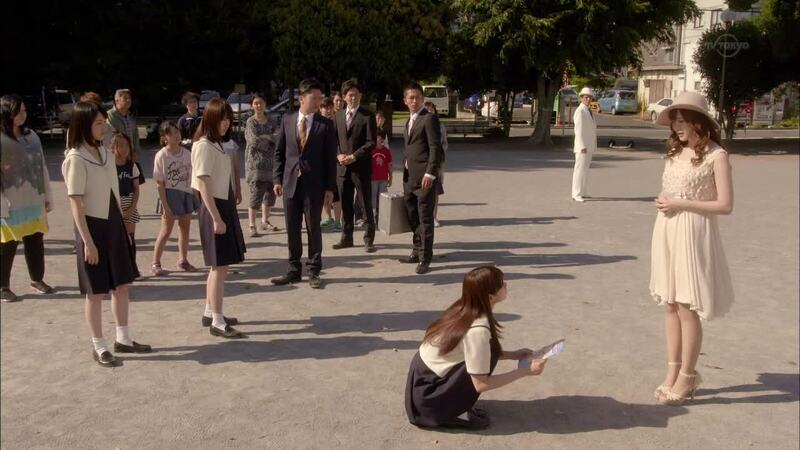 Hatsumori Bemars's final episode was aired at 26 September 2015, at the end of episode it previews that Shimazaki Haruka and Miyawaki Sakura will appear on next season. 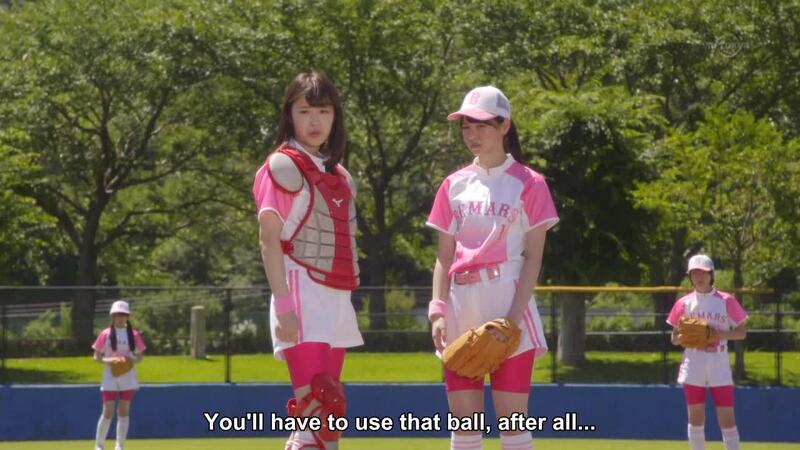 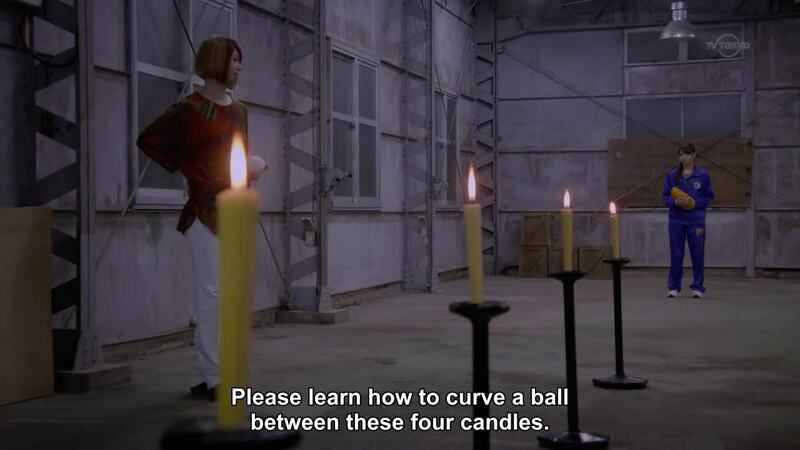 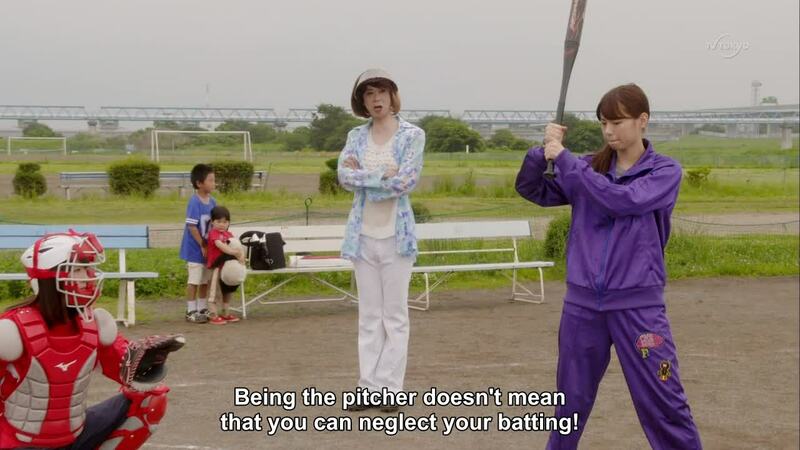 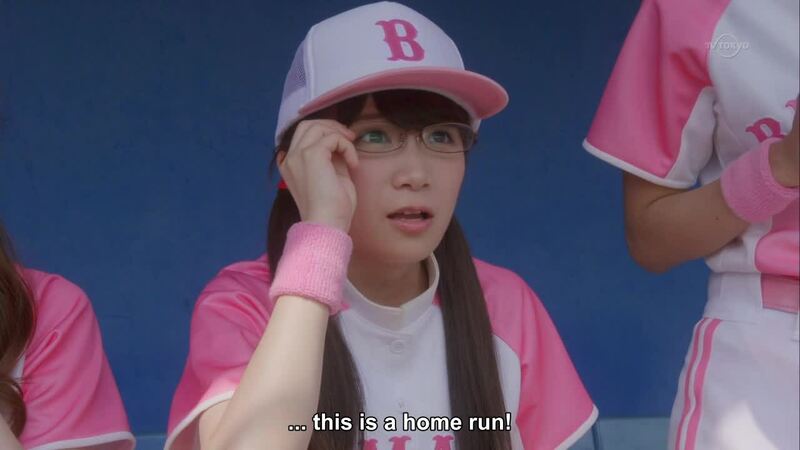 .... but do the Bemars have a chance against the power pitching and hitting of Kirei? 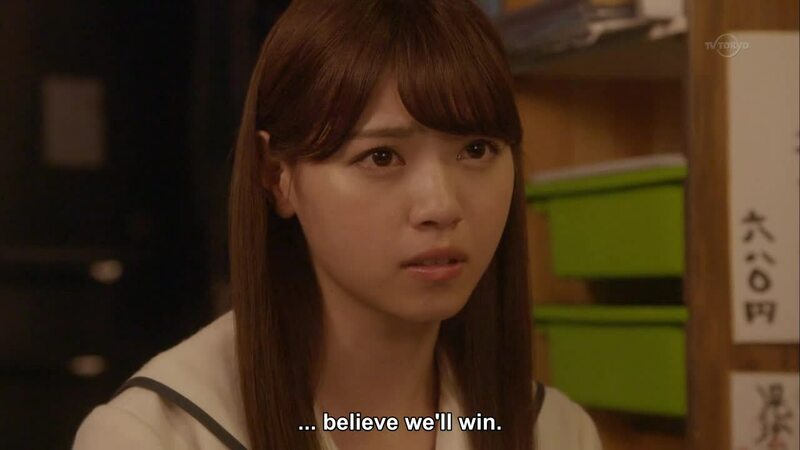 Let's just say you can add up all the dramatic finishes in dramas and their combined total couldn't have beaten this ending. 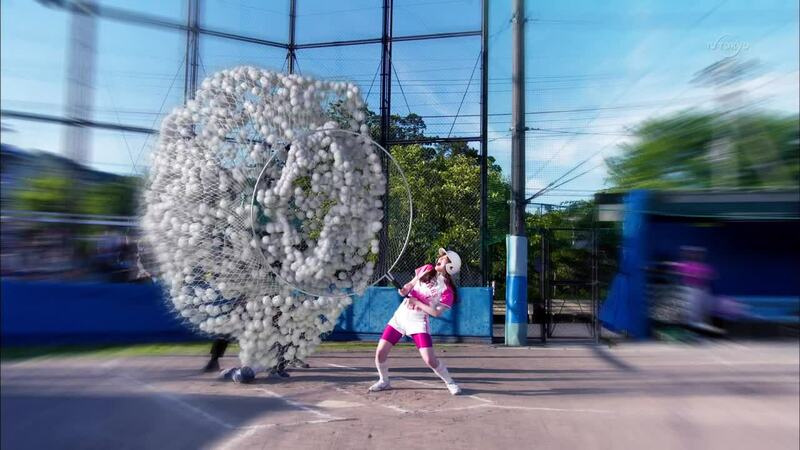 Page created in 0.905 seconds with 15 queries.